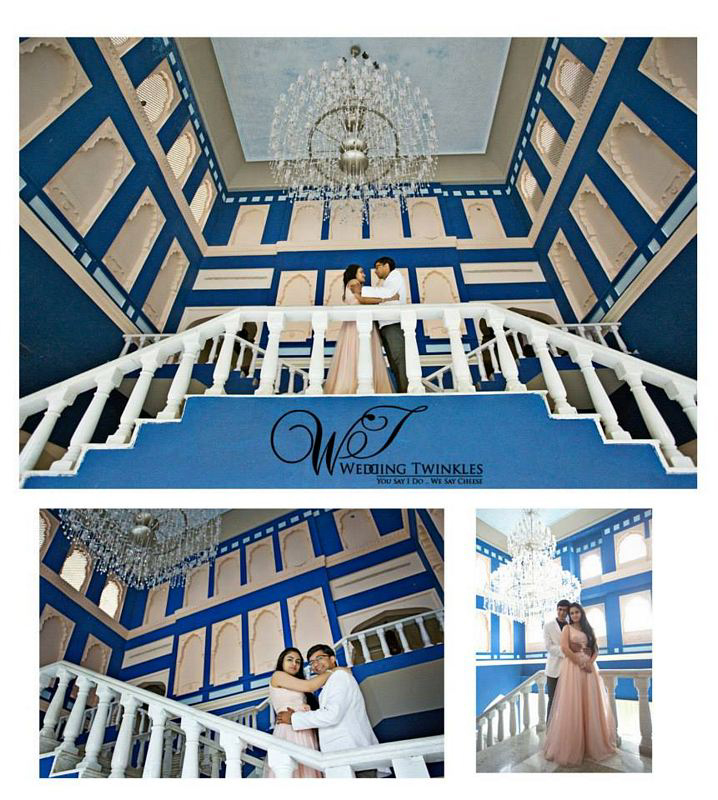 Love blossoms when two-likeminded people come together with a sole promise of walking hand in hand. 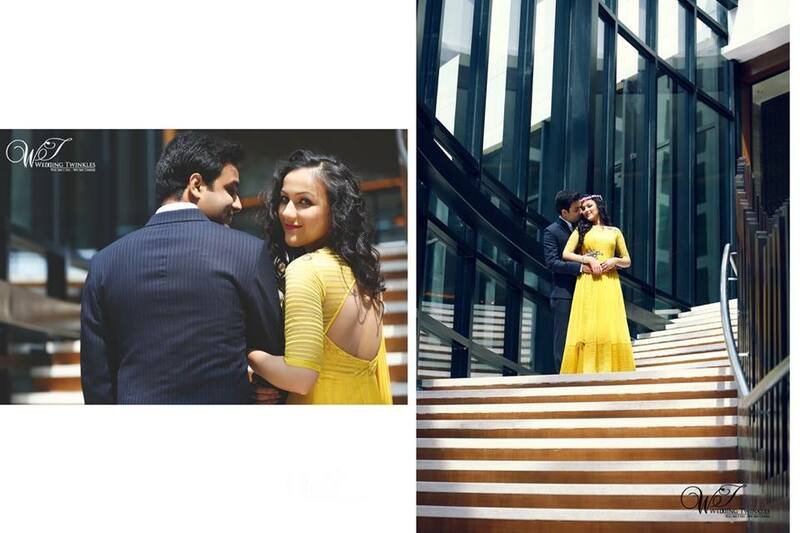 Such is the sweet love story of our love birds, Madhuri and Bhavik. 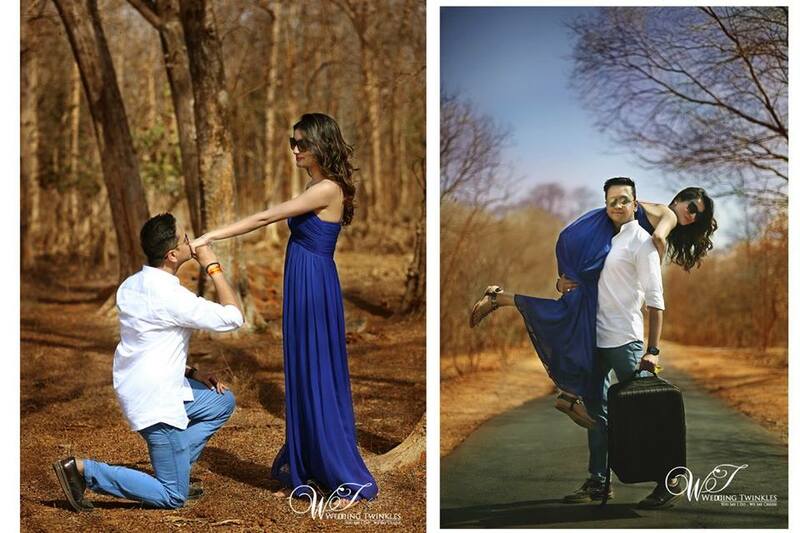 Ever wondered two strangers tying the knot could be so truly, madly and deeply in love. 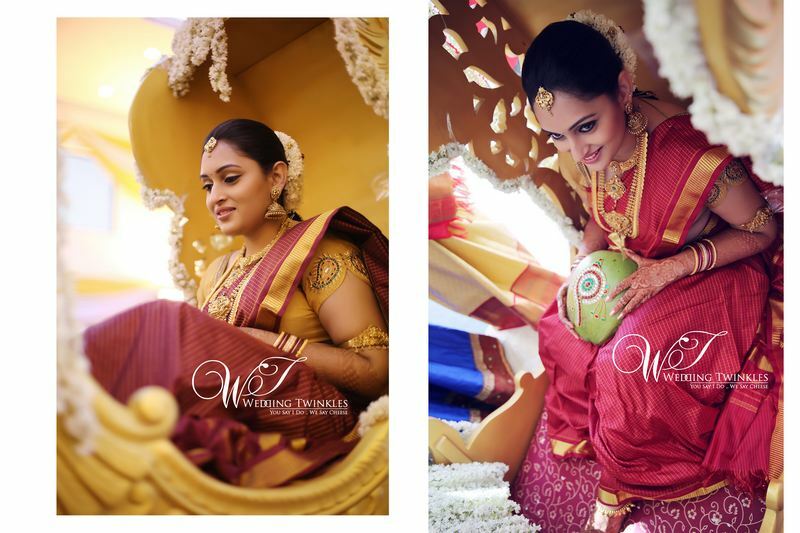 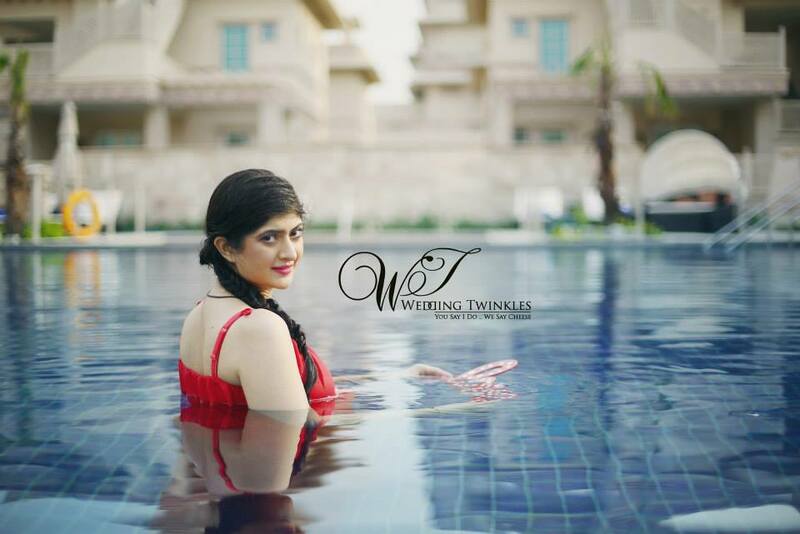 Our pretty bride-to-be is based out of Dubai and hailing from Maharashtra looks resplendent in all the pictures. 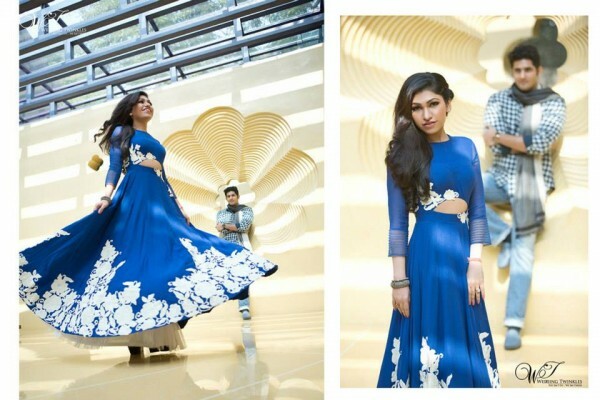 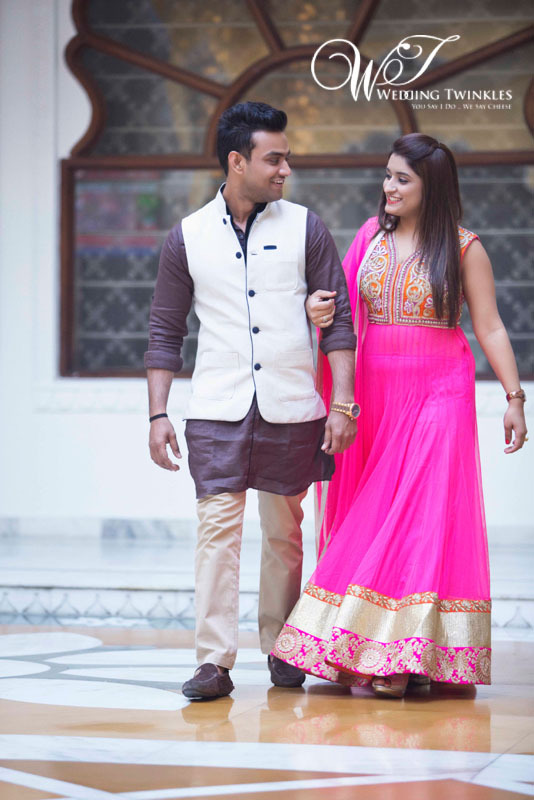 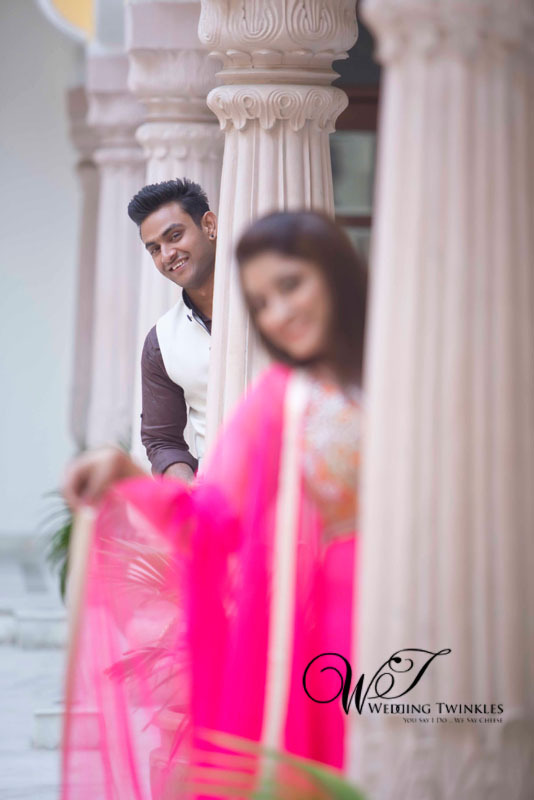 Her dreamy silhouettes and soft features are sure to cast a spell on the oh-so-dashing Gujju groom-to-be Bhavik. 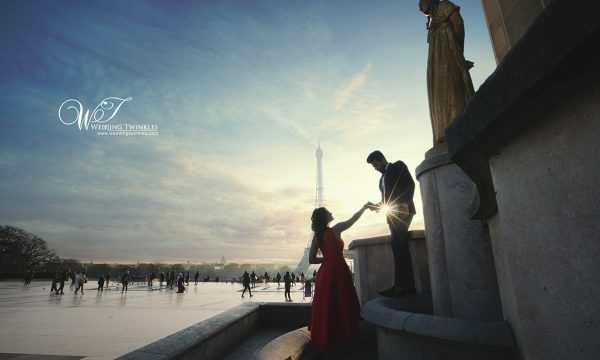 The pretty pictures prove just that. 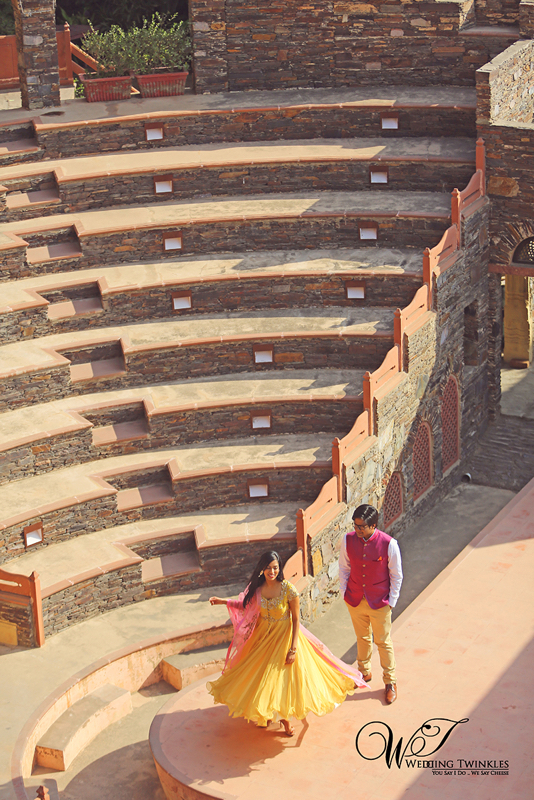 And when it’s time to play, nothing else than this shot and perfect frame could capture! 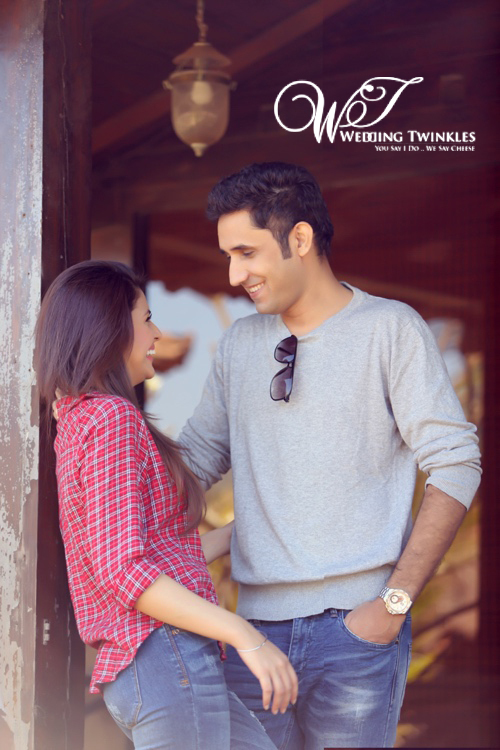 A true partner unleashes innocence at it’s best. 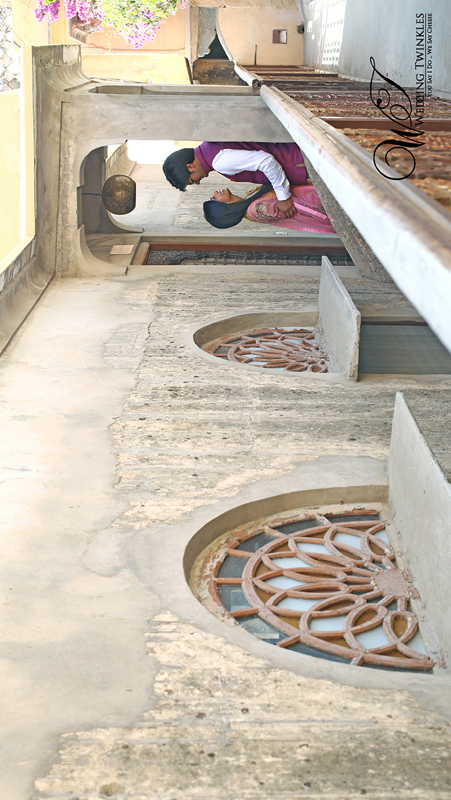 Madhuri shows how to do it. 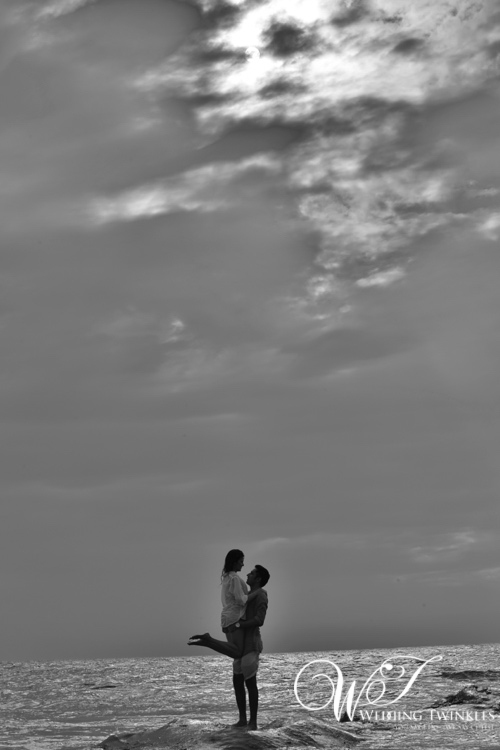 Isn’t that all what a girl always dreams of? 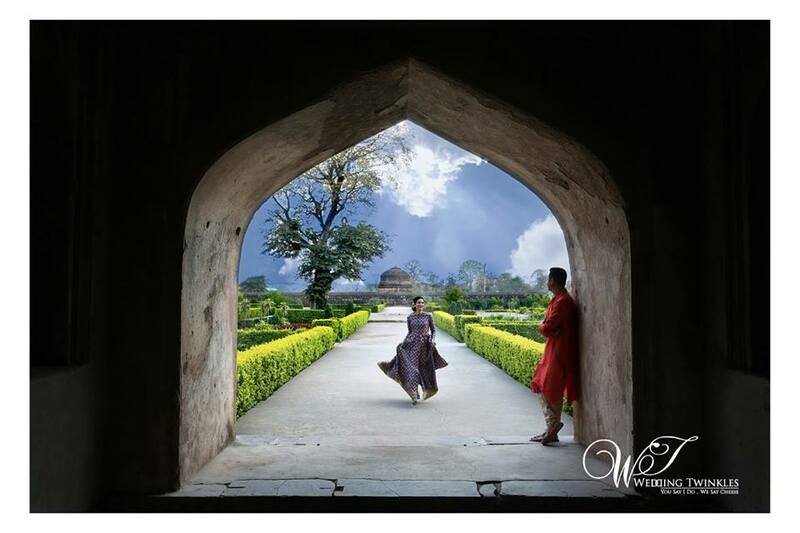 The vintage background, charming prince and a royal affair is all that this picture showcases. 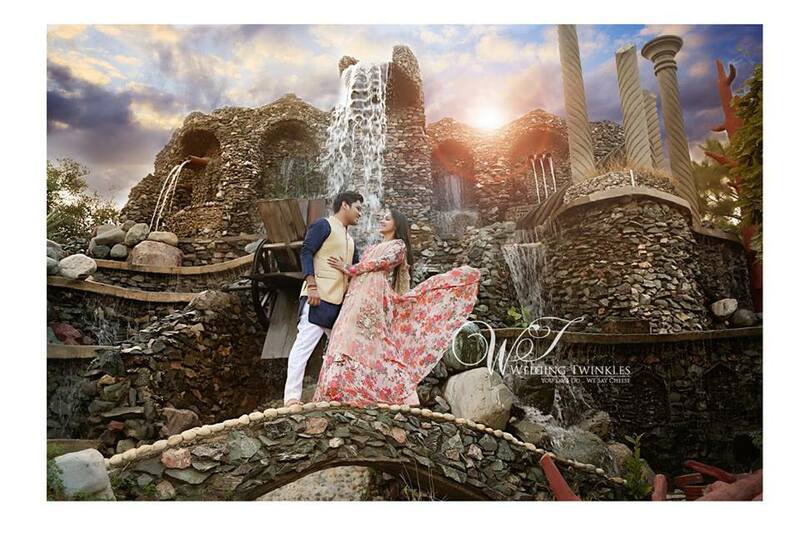 We are drooling over this breathtaking shot. 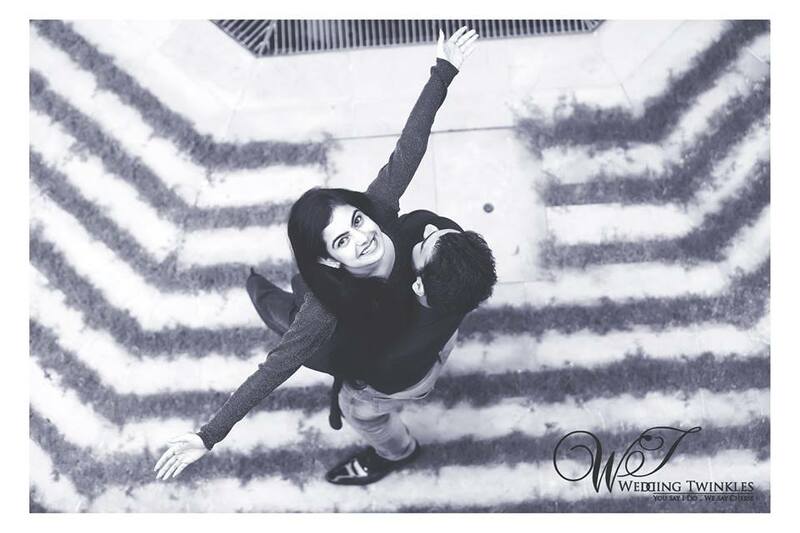 There are couples who fall in love and then there are people who fall head-over-heels. 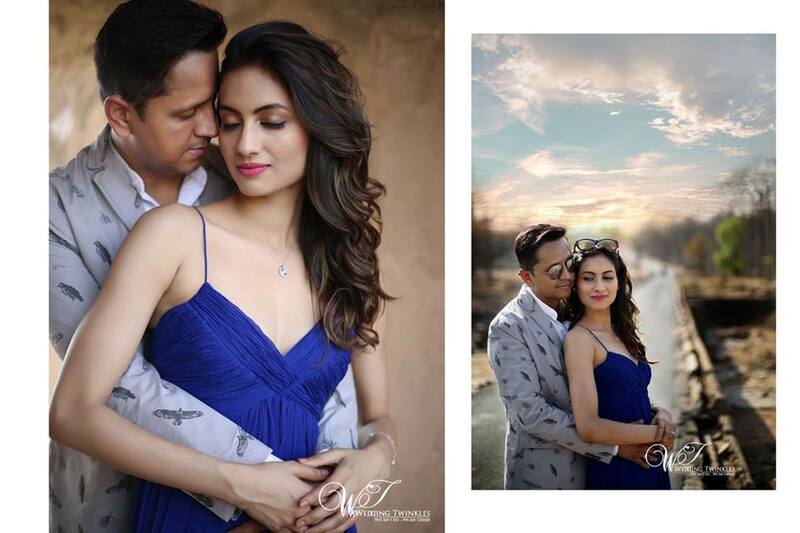 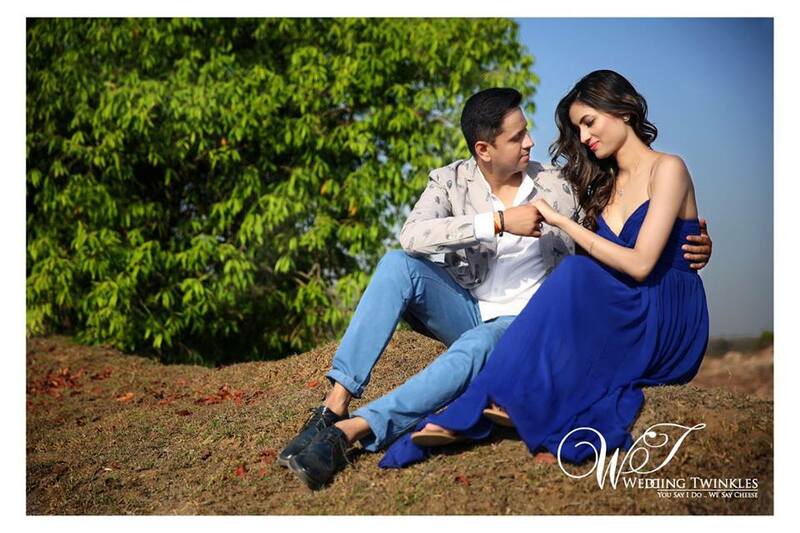 Their pre-wed shoot will give you all those ideas of going wild, young and free but wait, don’t forget to check out the beautiful video here. 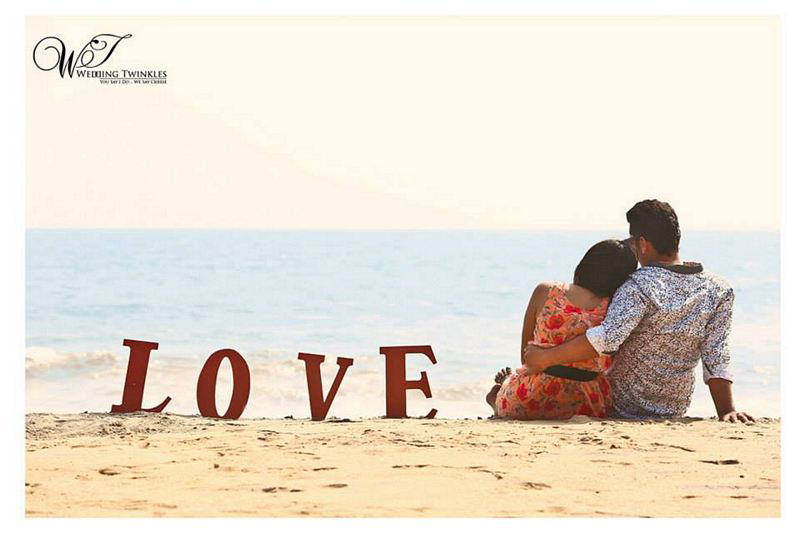 The sweet and charming couple picked Goa as their destination and undoubtedly, the beach, the sand and cuteness complimented them. 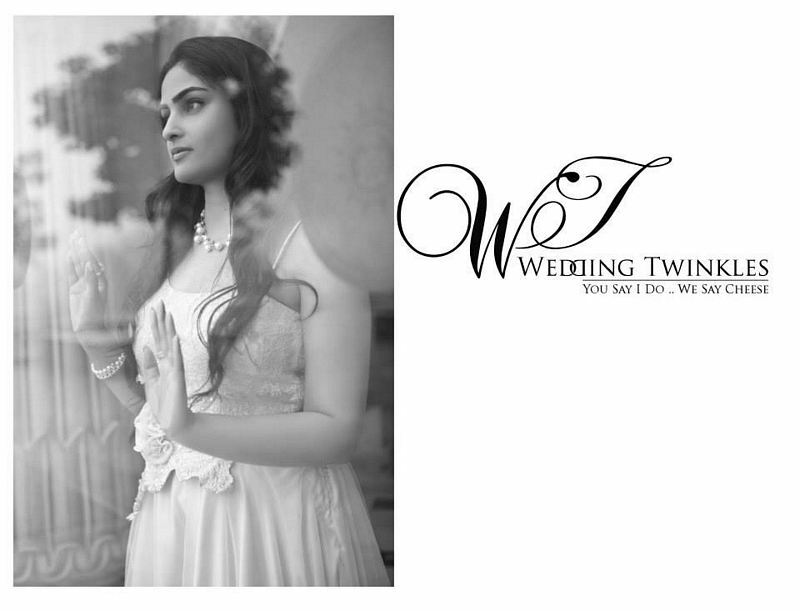 Take a look here. 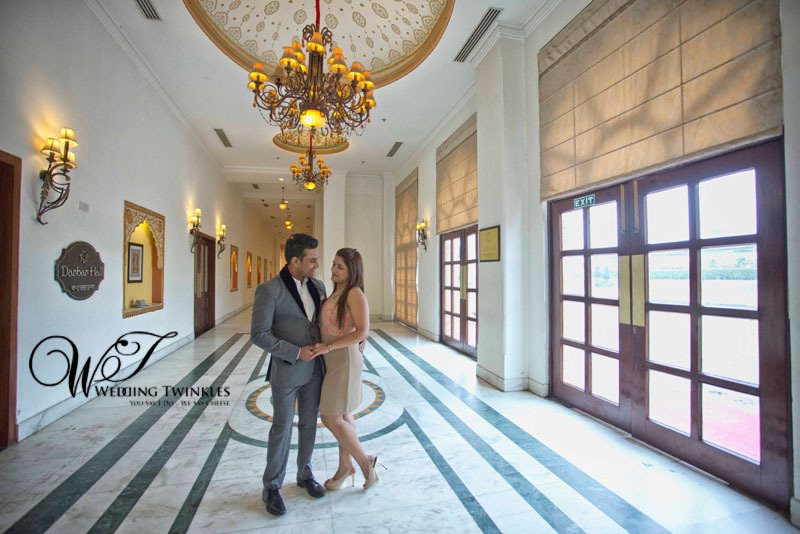 For a quirky and fun-loving couple like them, it was not easy to meet the requirements of the adventurous duo. 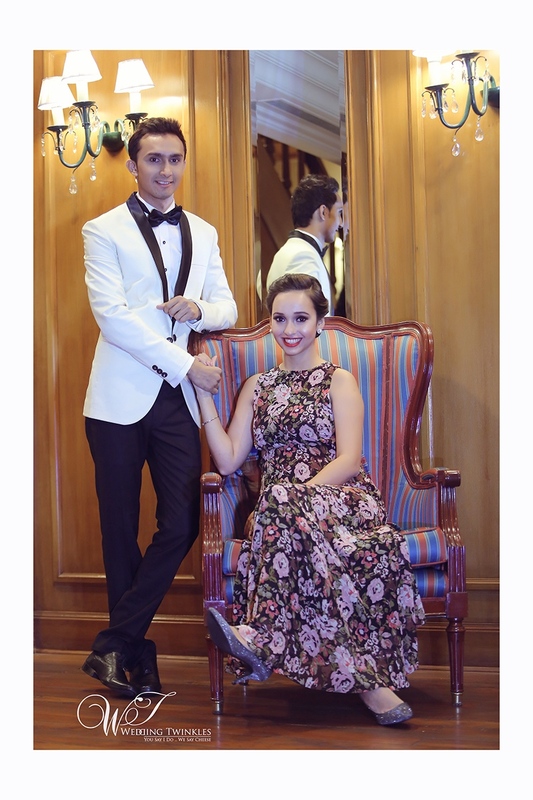 But, we managed to outdo as always. 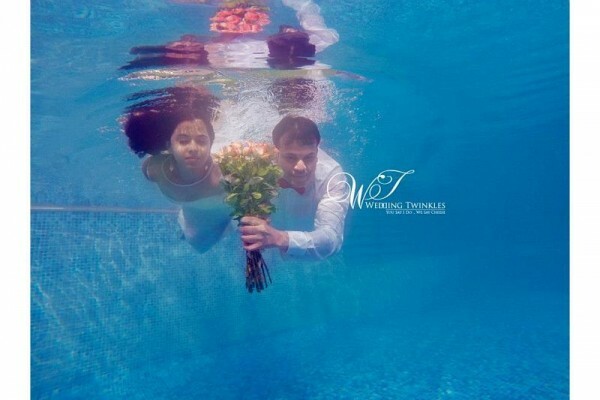 A pinch of aqua therapy has done wonders for them and we wish all the very best to this cute bunch of party starters. 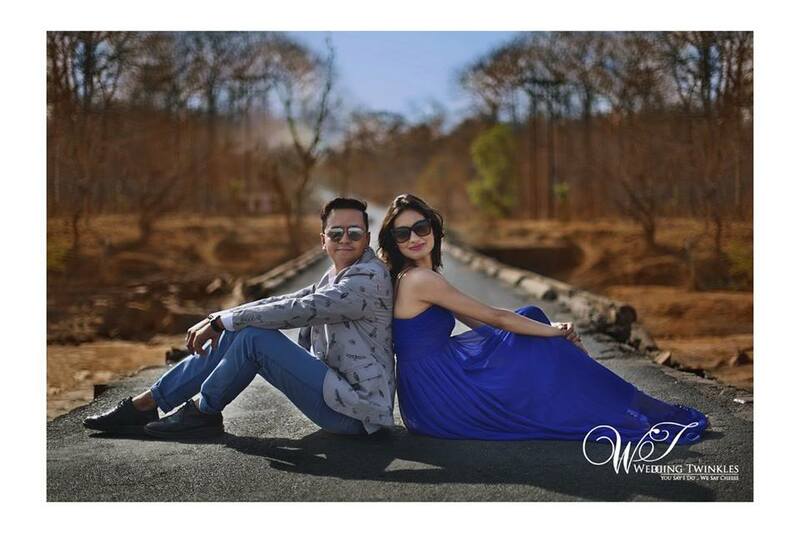 The destination this couple chose was Nasik. 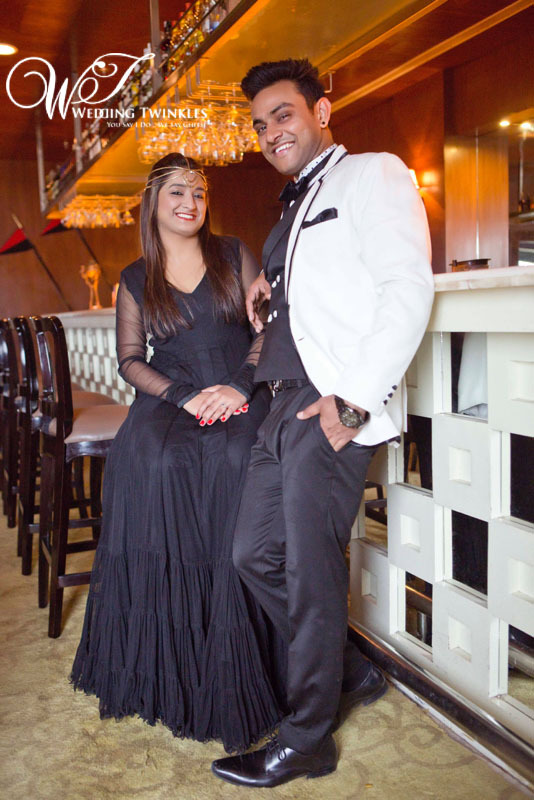 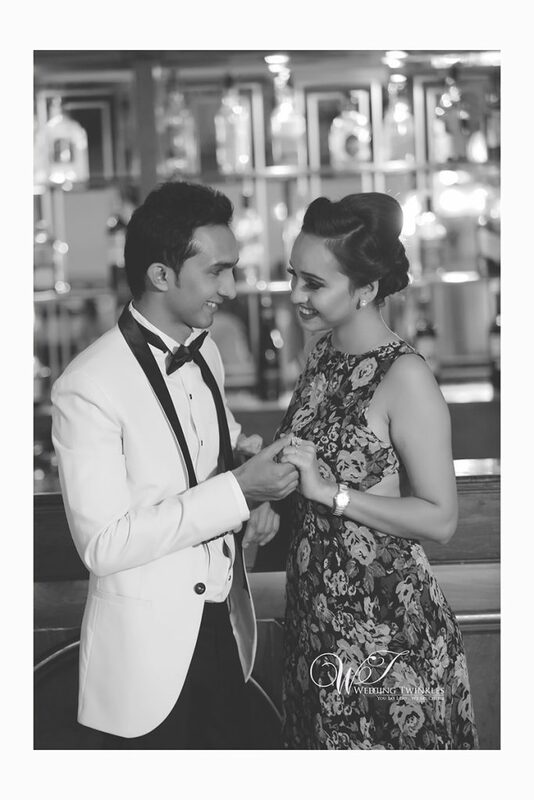 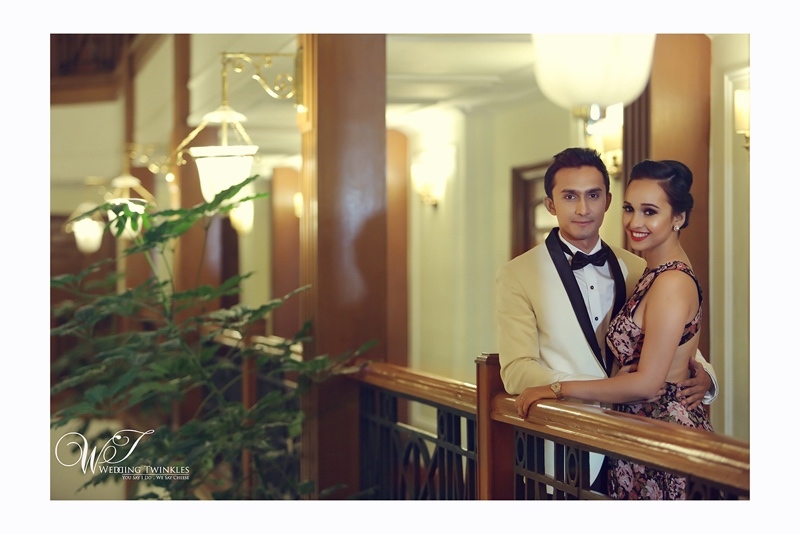 Nothing spells elegance as vintage and the old world charm, which was opted as a go-to pre-wedding theme for the love birds Swati and Hrash. 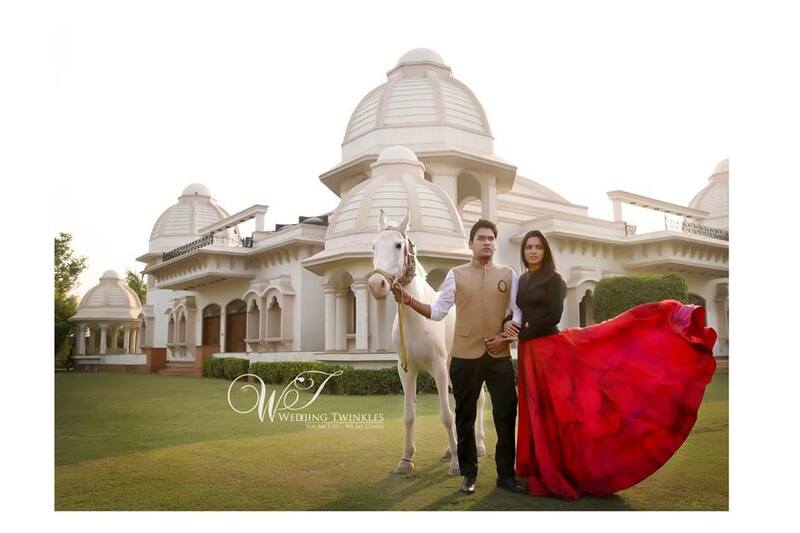 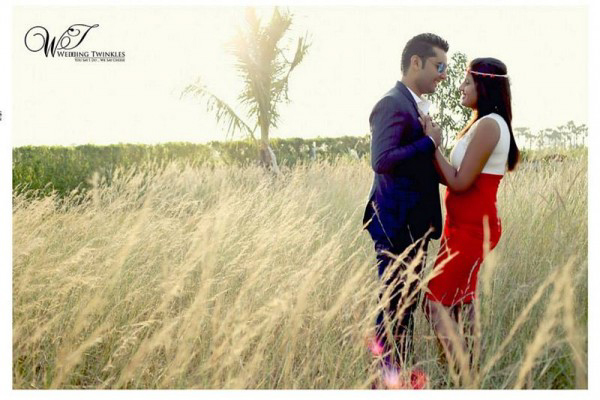 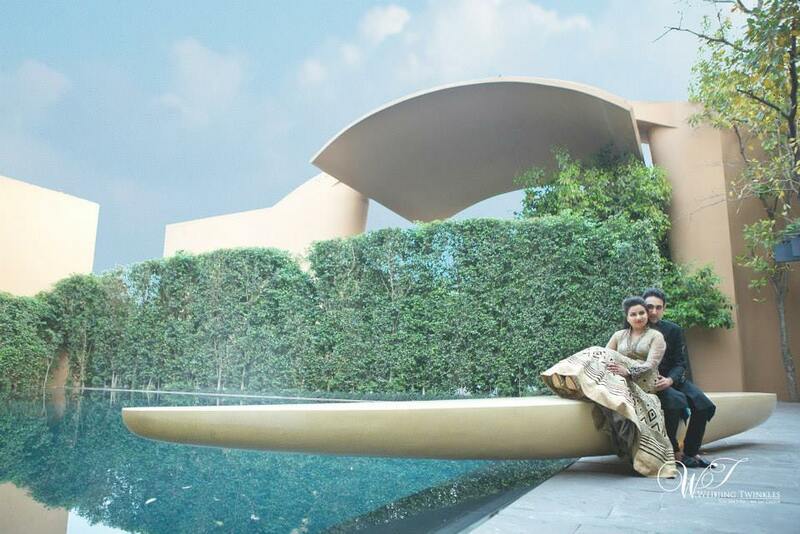 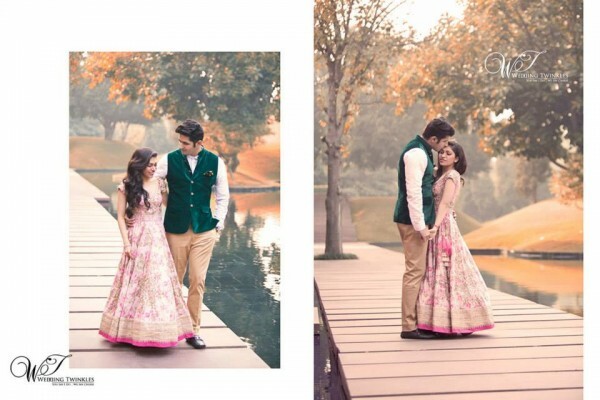 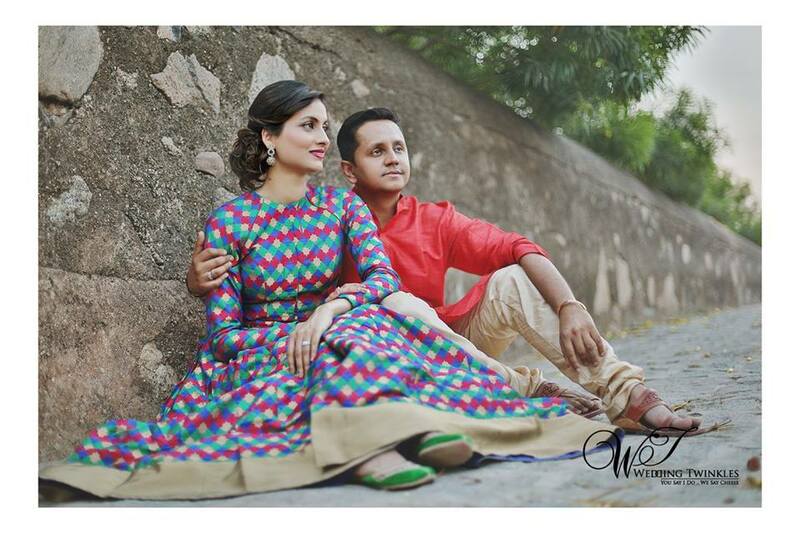 Behold the backdrop beauty of Delhi with the classic couple posing suavely for their extravagant pre-wed is nothing but graceful. 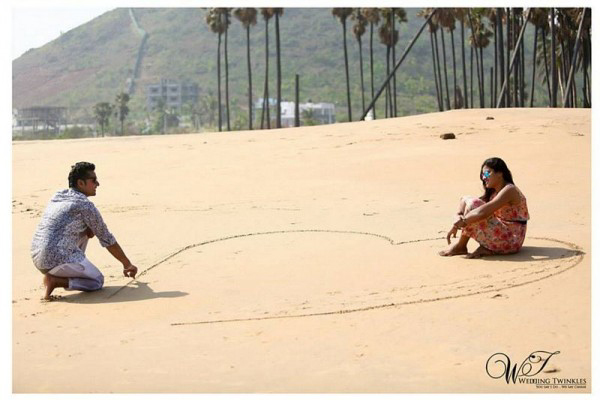 This might remind you an old classic 80’s flick too. 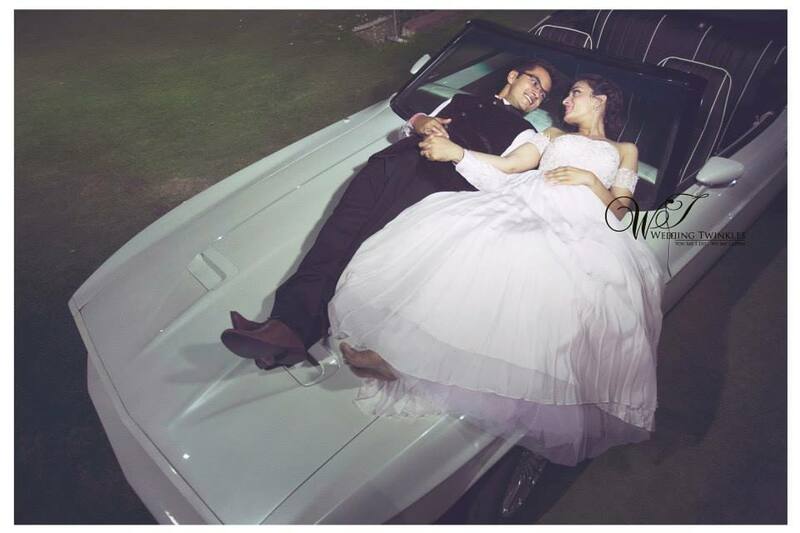 What happens when a melodious diva of B-Town twirls to the tunes of the hot and young guy- Pure Bliss. 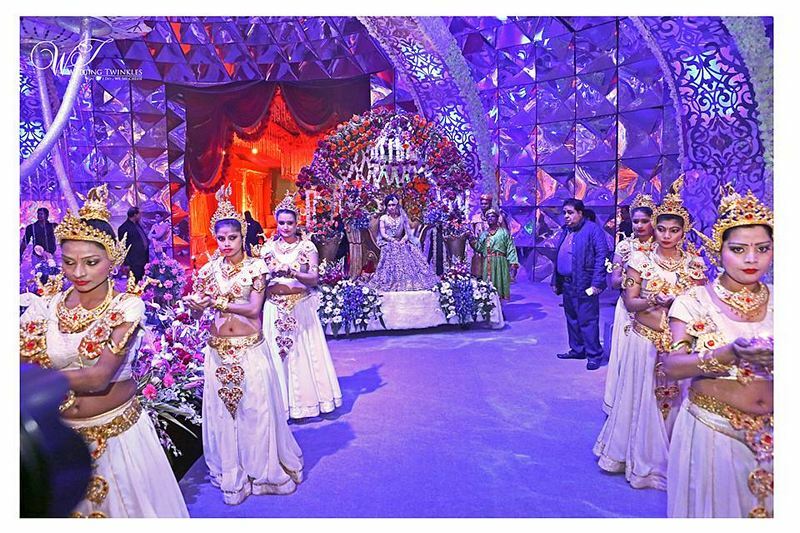 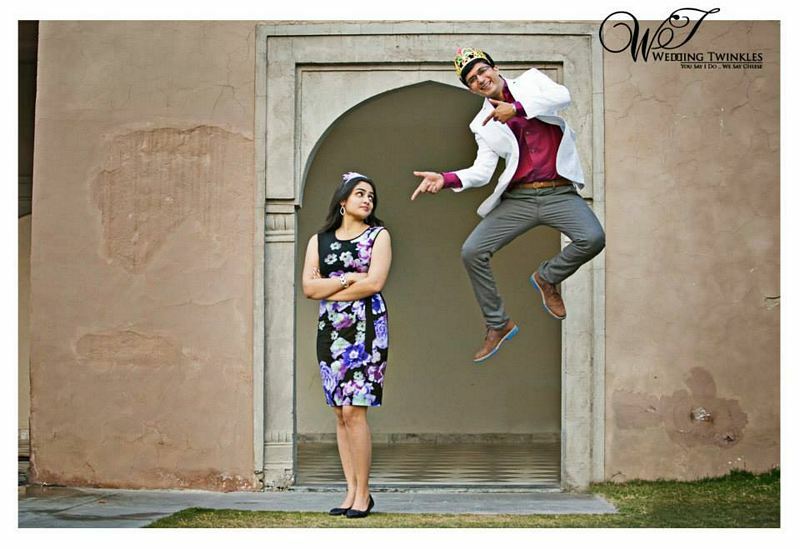 Oh yes, so is the theme of their royal and flamboyant pre-wedding at Dusrit Devarana, Delhi. 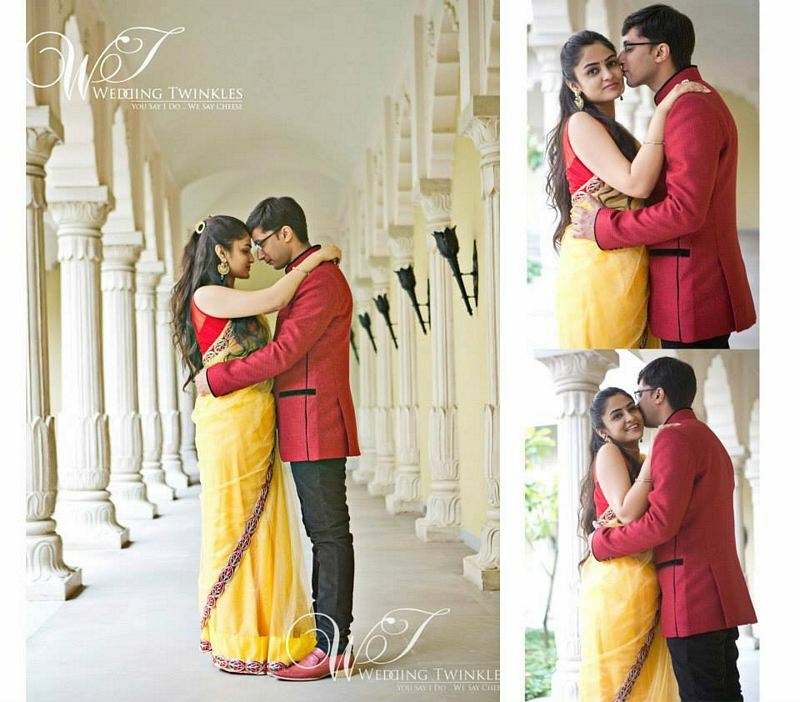 The wonderful couple compliments each other very well and snaps are sure to prove that. Sheer elegance we’d say. 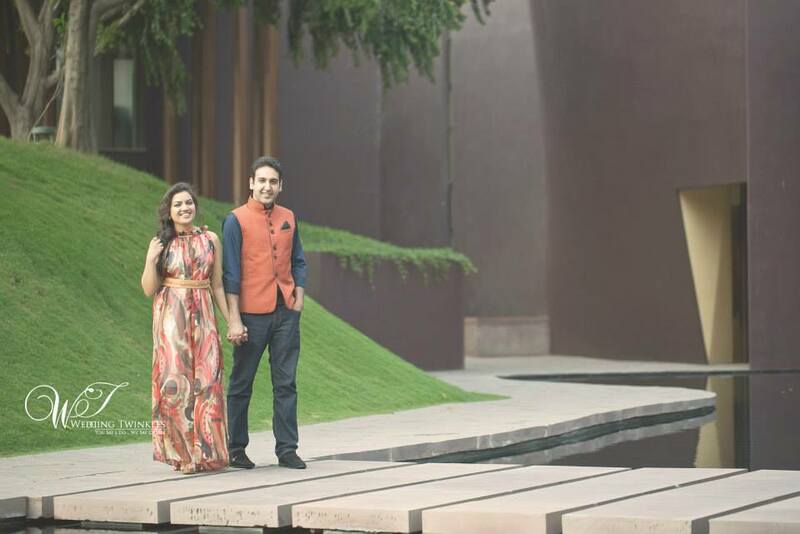 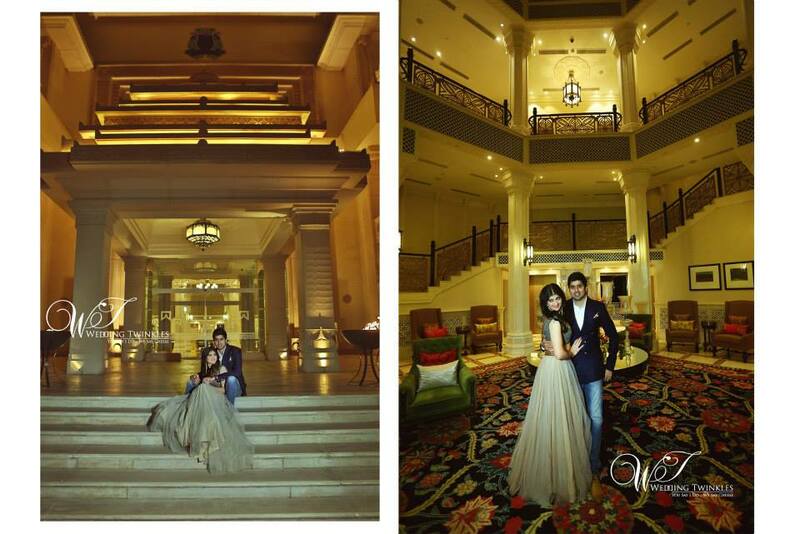 ITC Grand Bharat: ITC Grand Bharat in Gurgaon is an amazing place for pre wedding photo shoot. 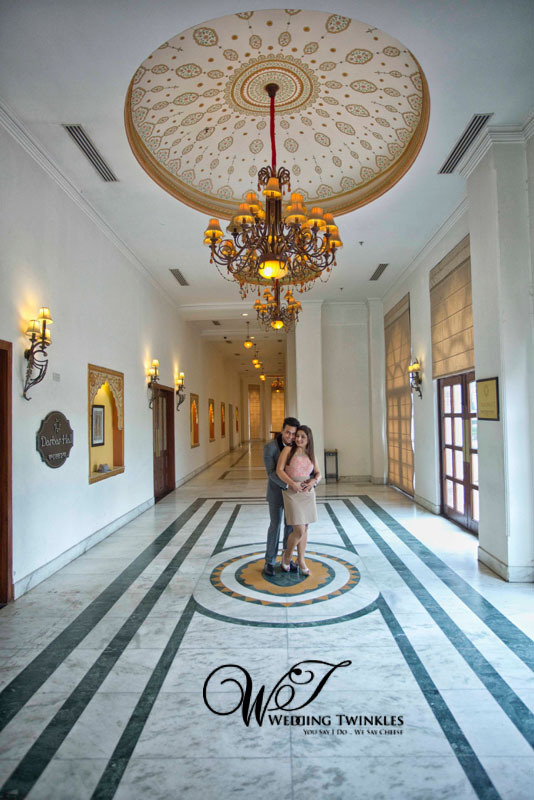 The place itself is very grand with a touch of traditional touch in it. 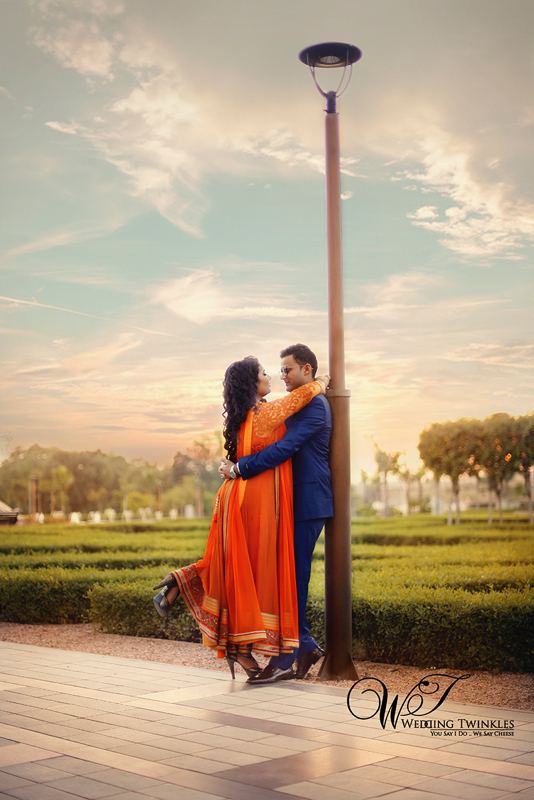 The long corridors, the pillars, the poolside, the fresh green grass everywhere is something that makes it so different and beautiful from every other place. 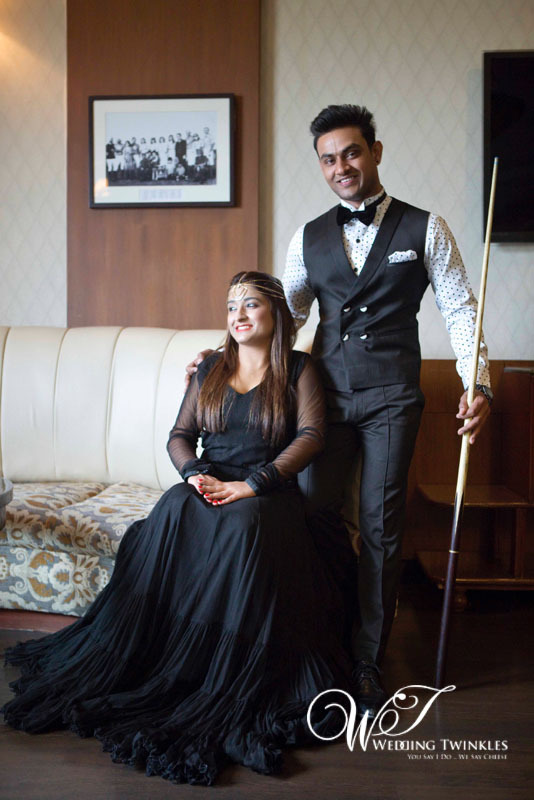 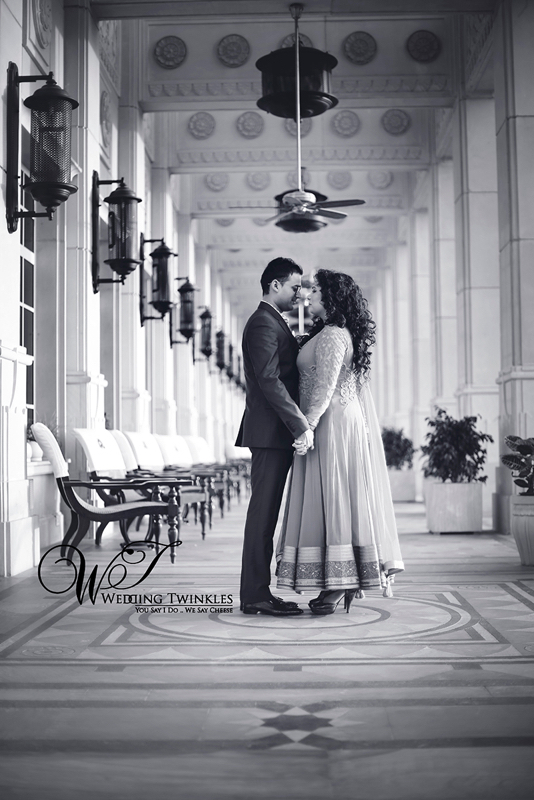 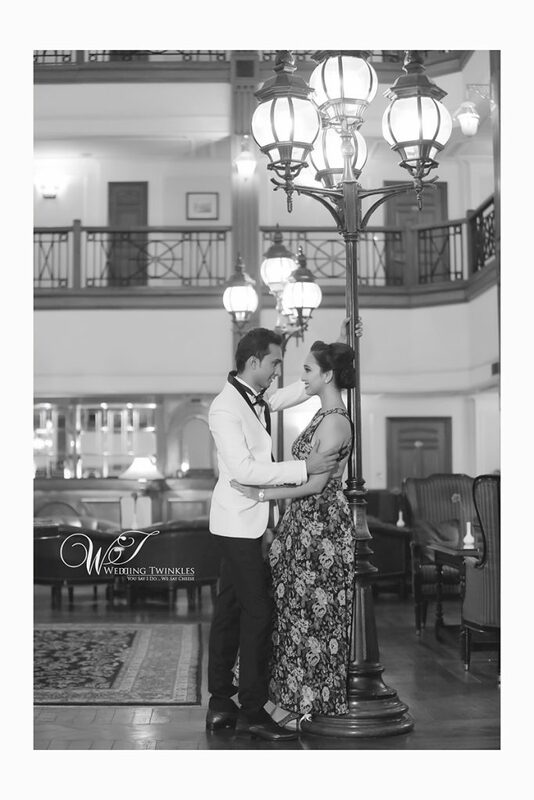 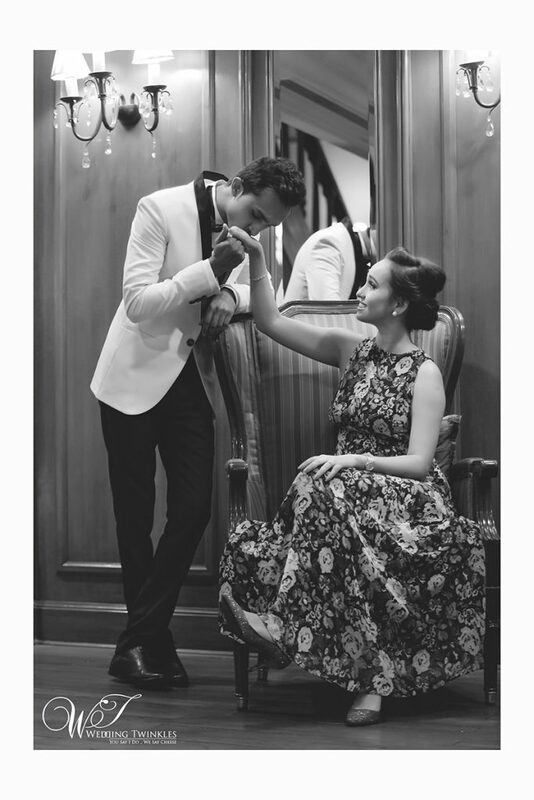 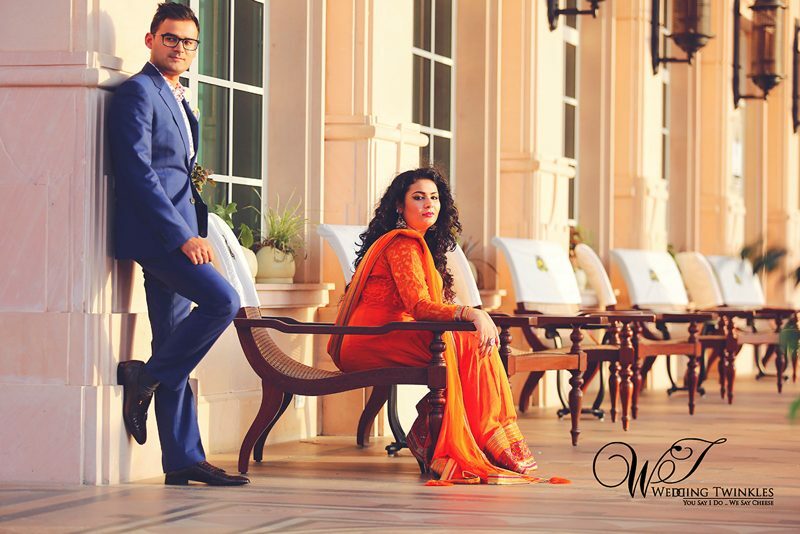 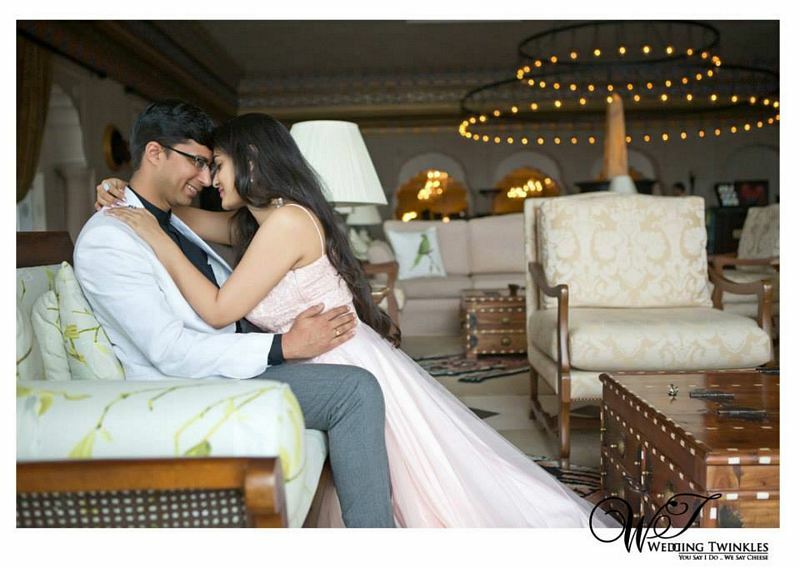 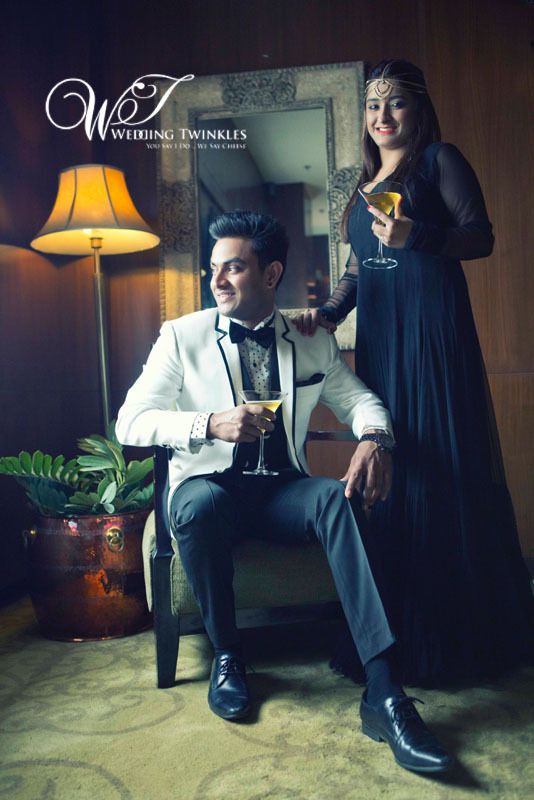 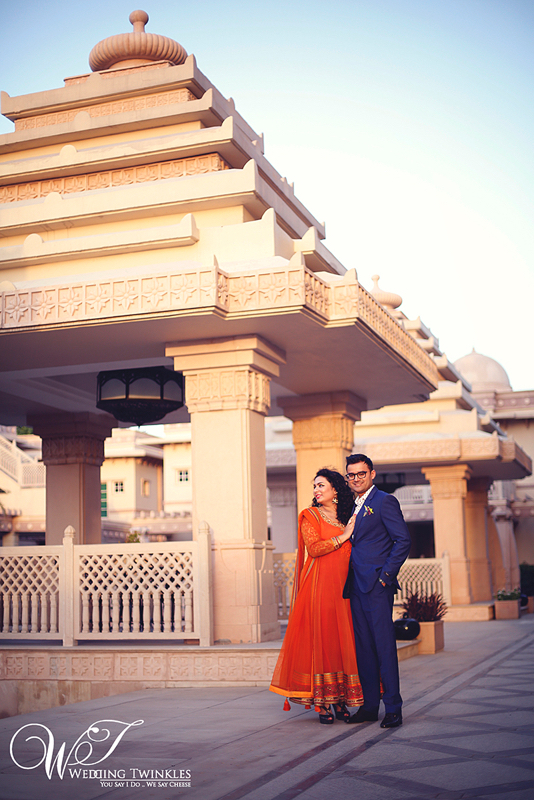 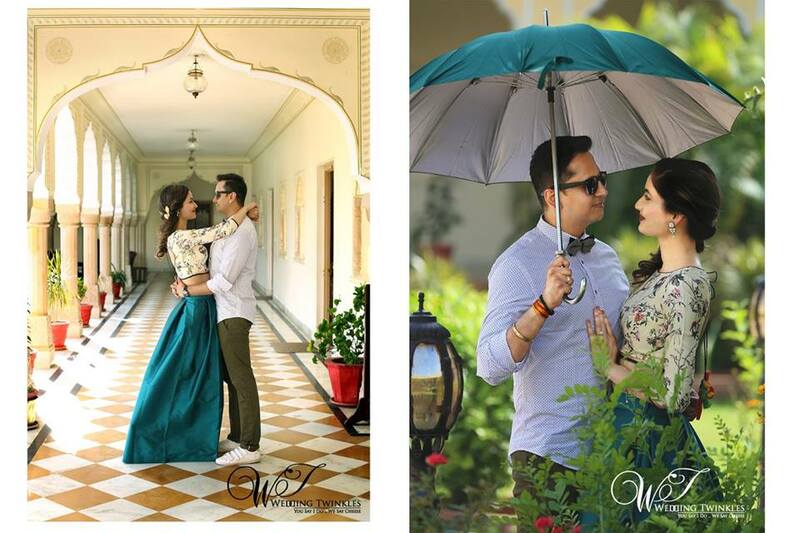 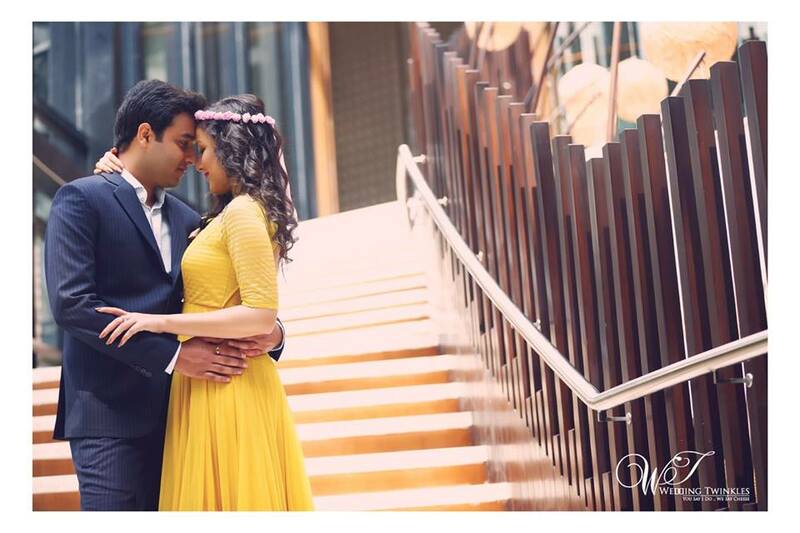 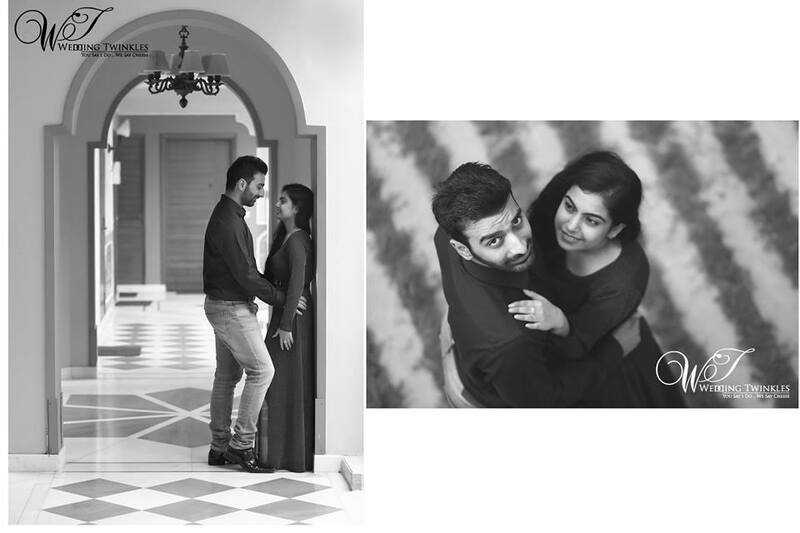 The essence of class and royalty is something that attracts the couple and thus they chose ITC Grand Bharat for their pre-wedding photo shoot. 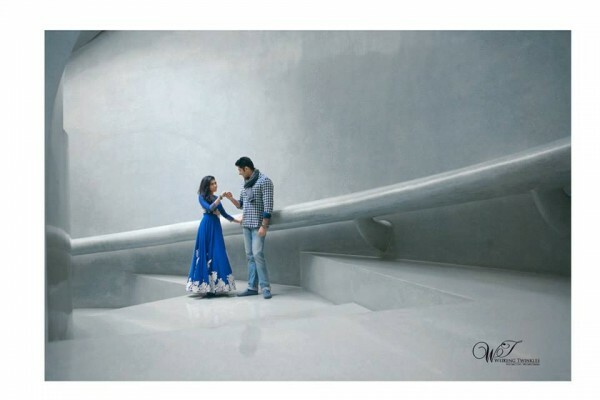 The interior looks very sorted with beautiful wall paintings and the lighting is something that should be talked about. 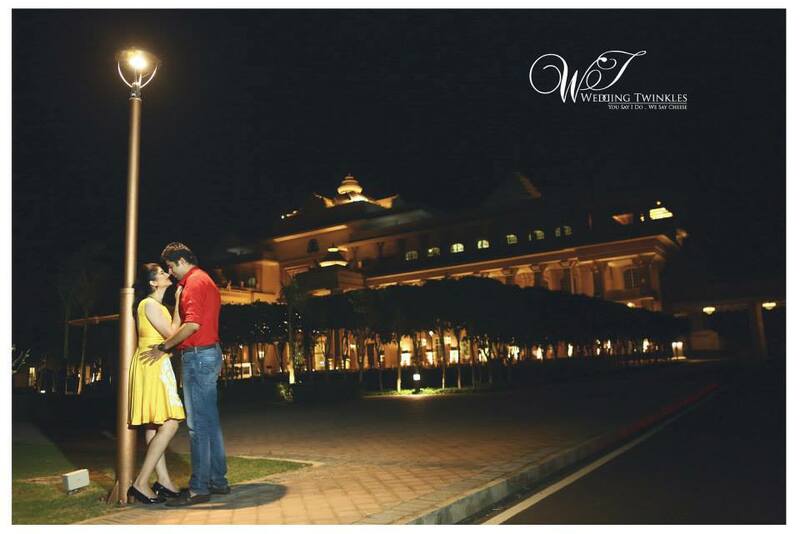 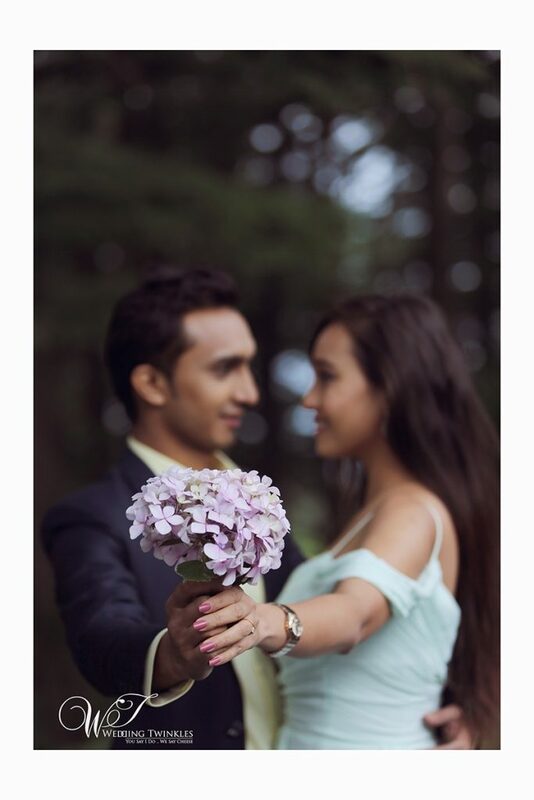 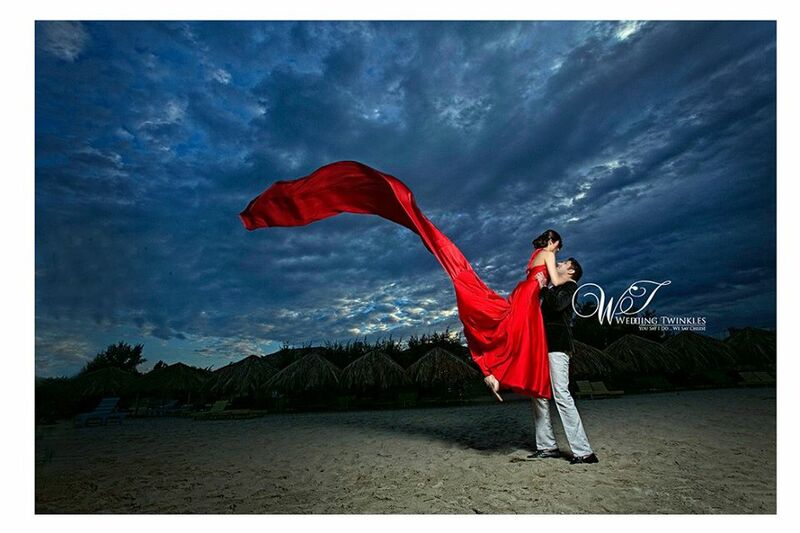 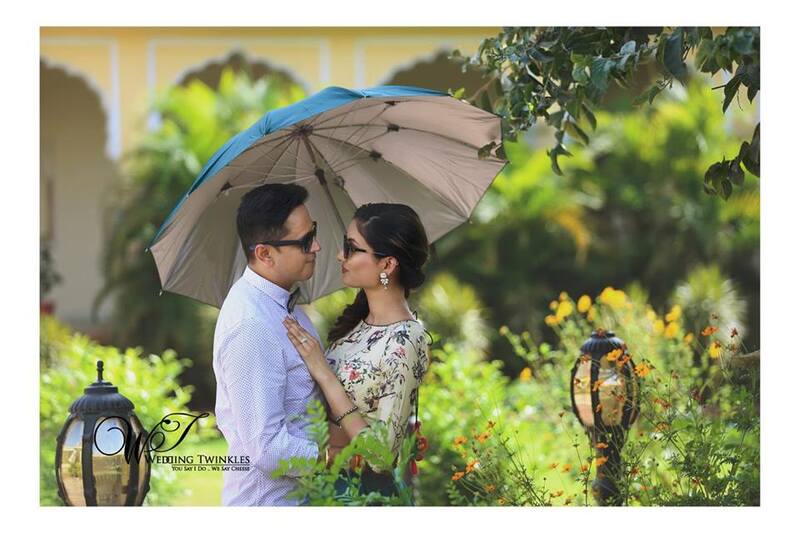 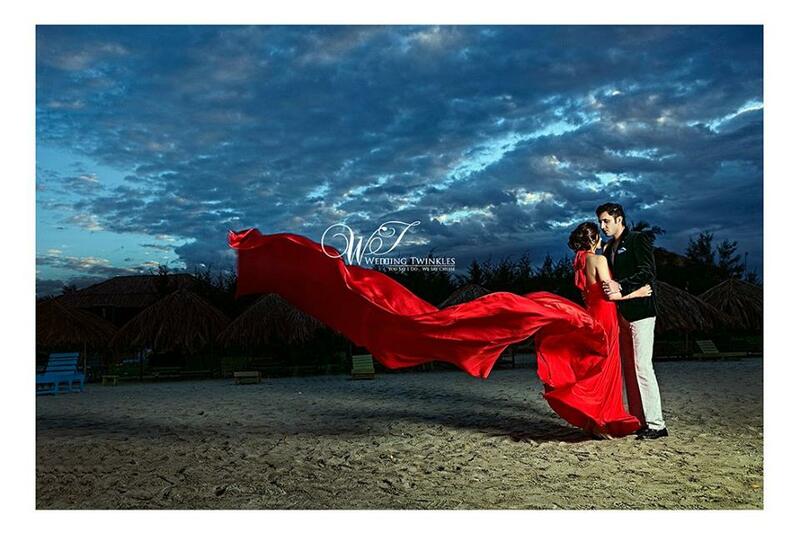 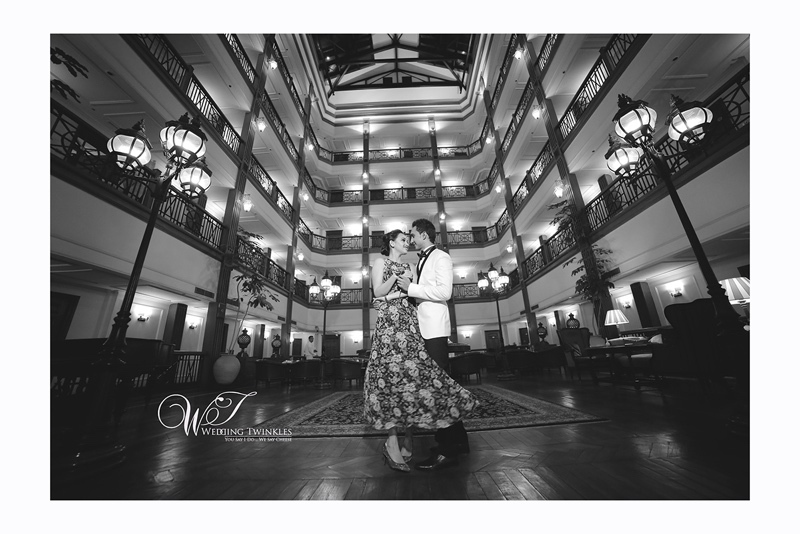 Dusit Devrana: is also a good option if you are planning for a pre-wedding photo shoot anytime sooner. 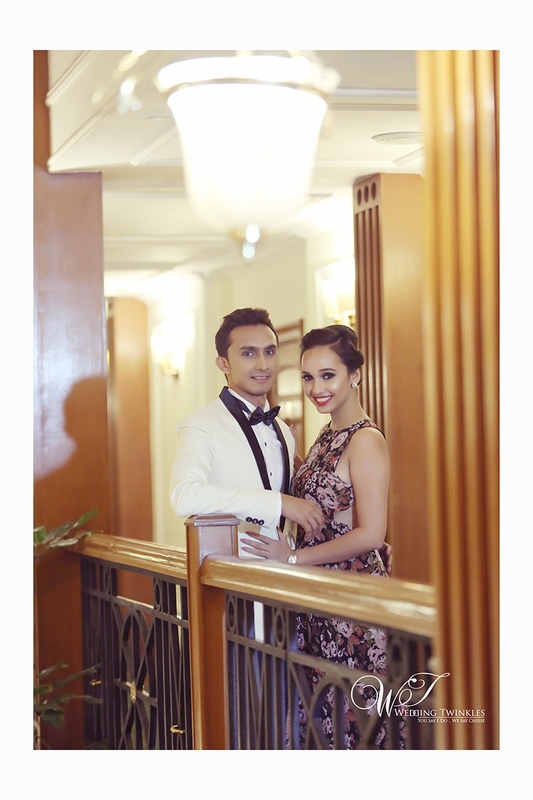 Dusit also has a very traditional touch but it can be called more as contemporary. 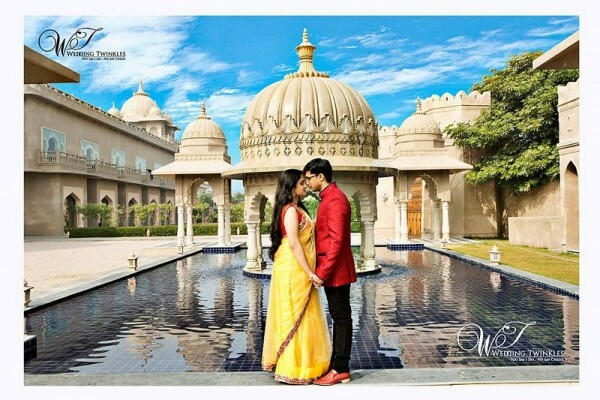 The huge fields, the water bodies are the main highlights of them. 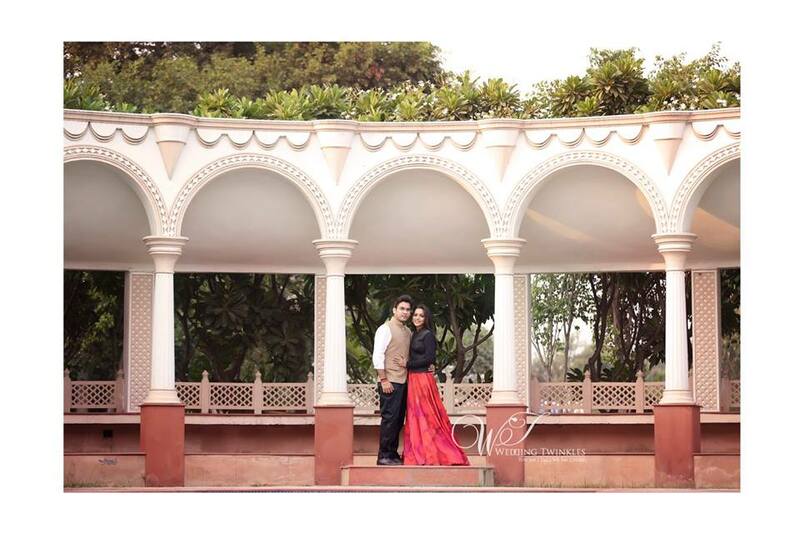 They have huge pillars which make them so unique. 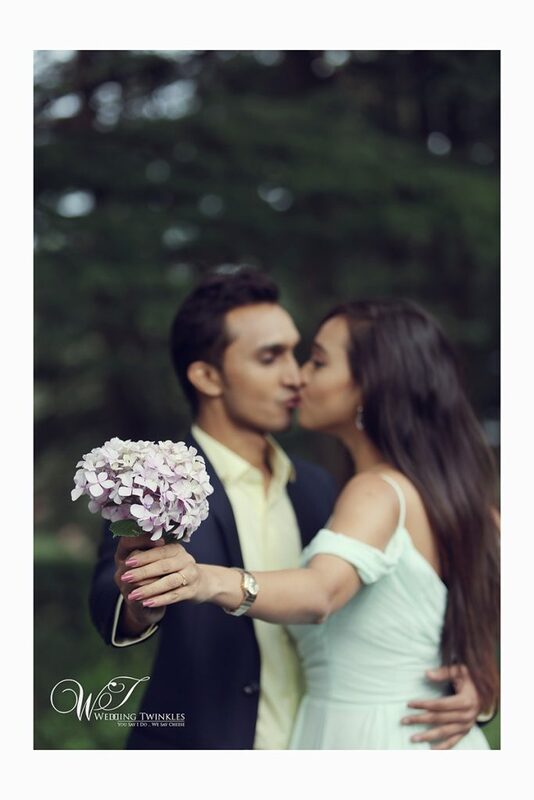 It has a lot of green in it. 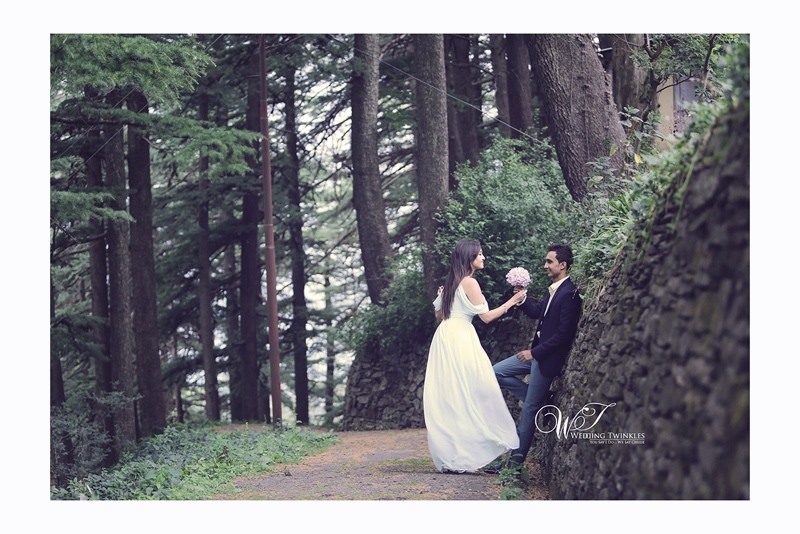 The green grace, trees planted everywhere in and around the whole place. 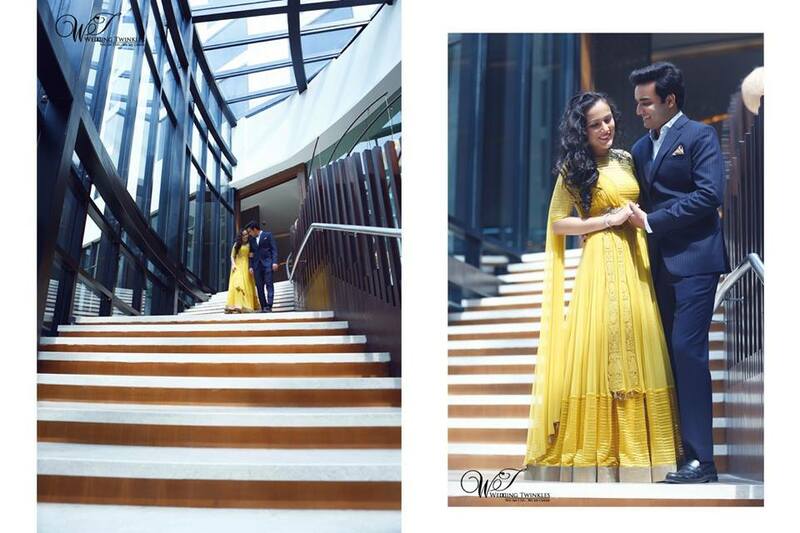 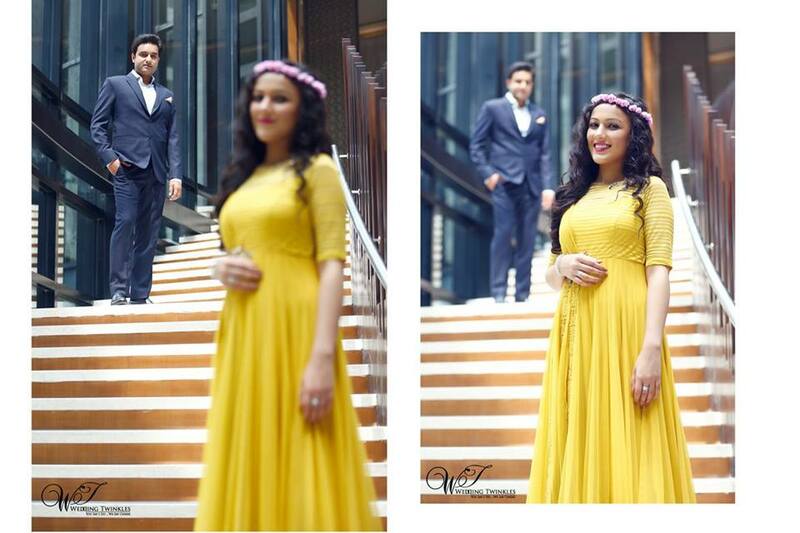 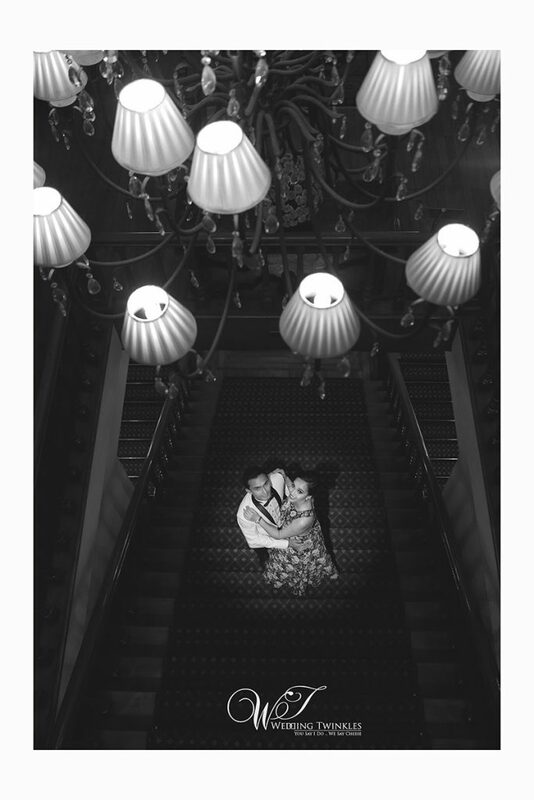 So getting a pre-wedding photo shoot done in Dusit is definitely a jce idea if you like contemporary. 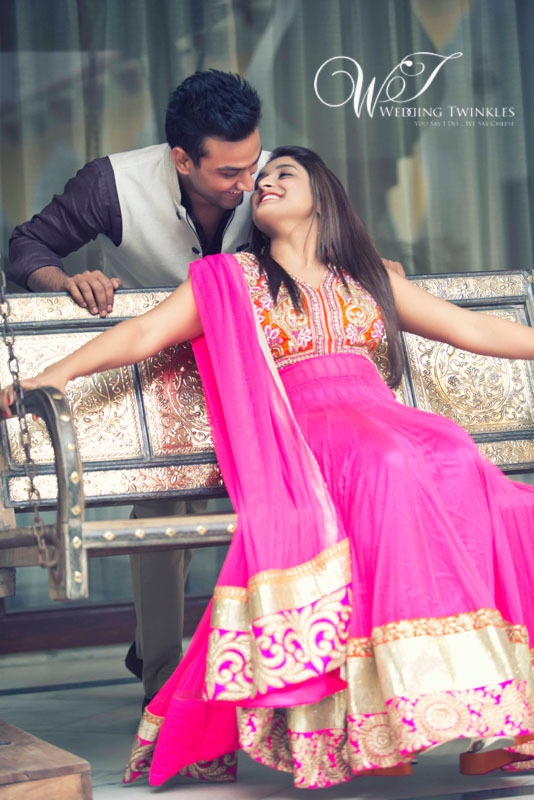 Falling in love is a beautiful thing and when you fall in love with your boss its way better. 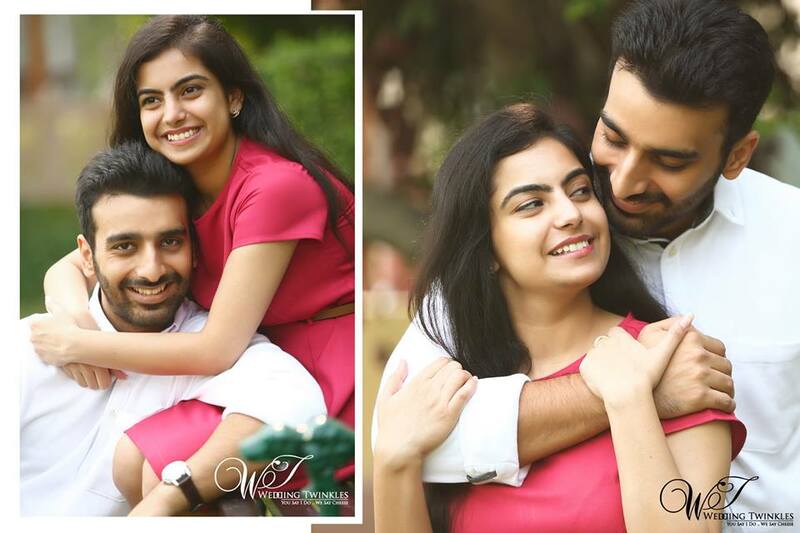 Yes we are talking about the cute couple Prerna and Praveen. 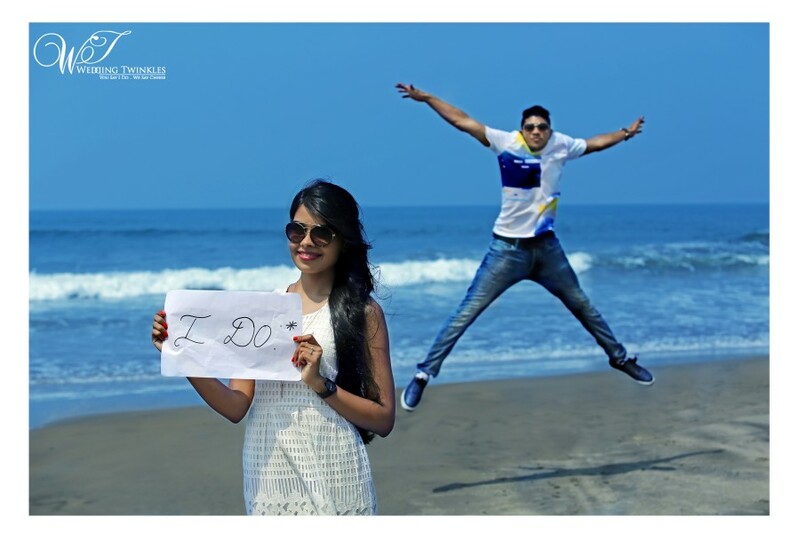 After asking the girl out for so long she agreed and then decided to take things forward to the next level i.e marriage. 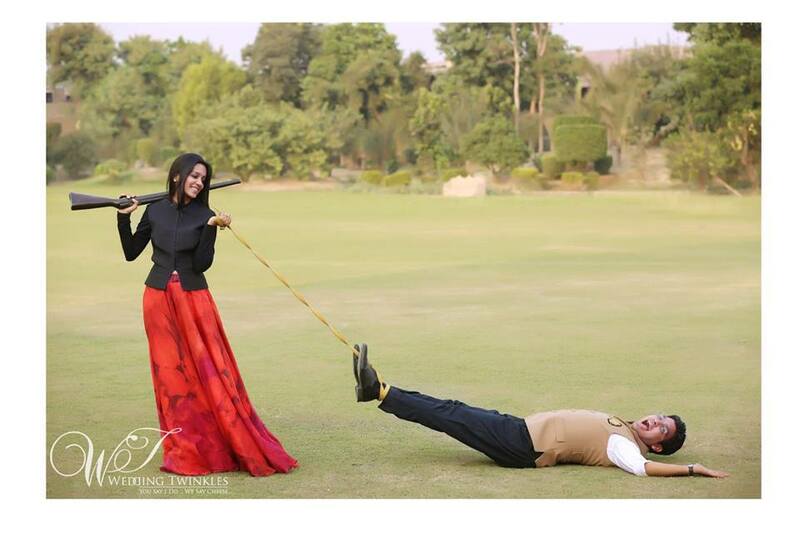 Love marriage is always exciting and magical. 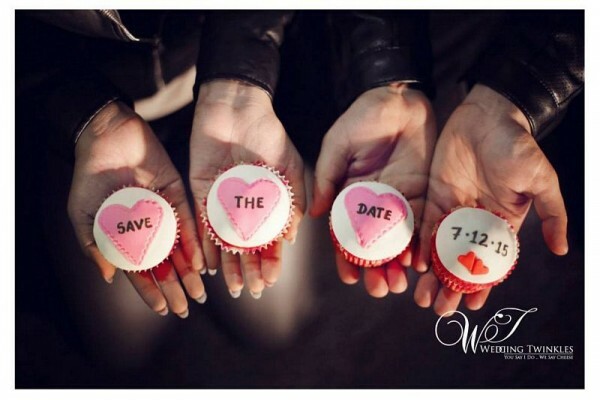 You stay in a relationship for certain period and then decide to give it a name. 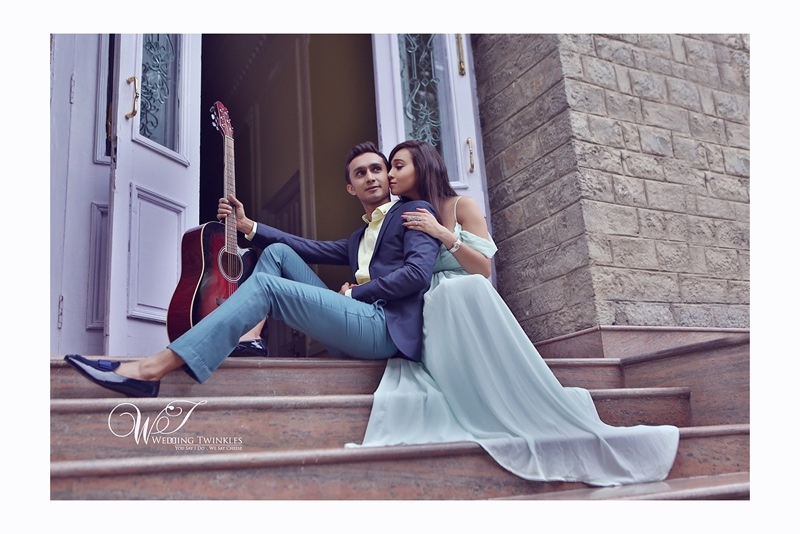 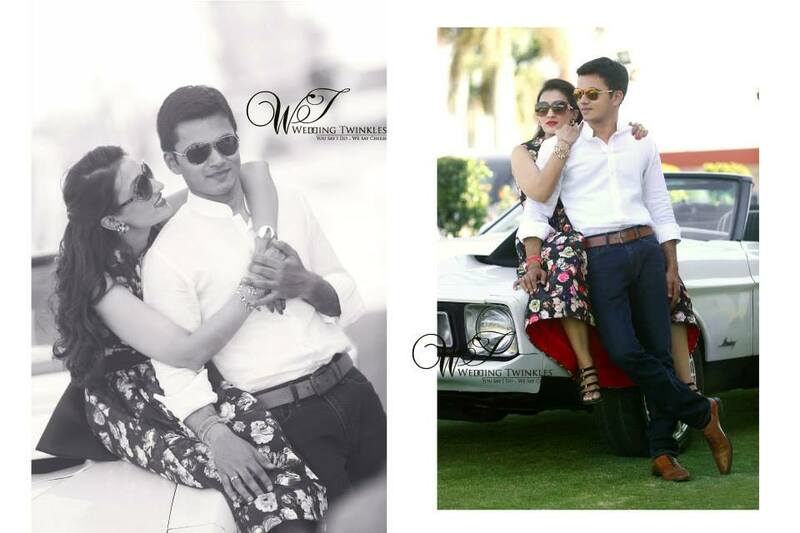 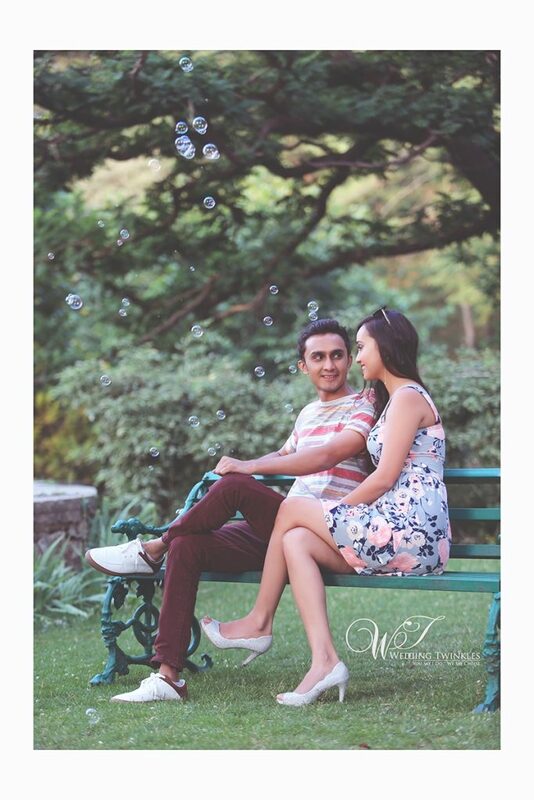 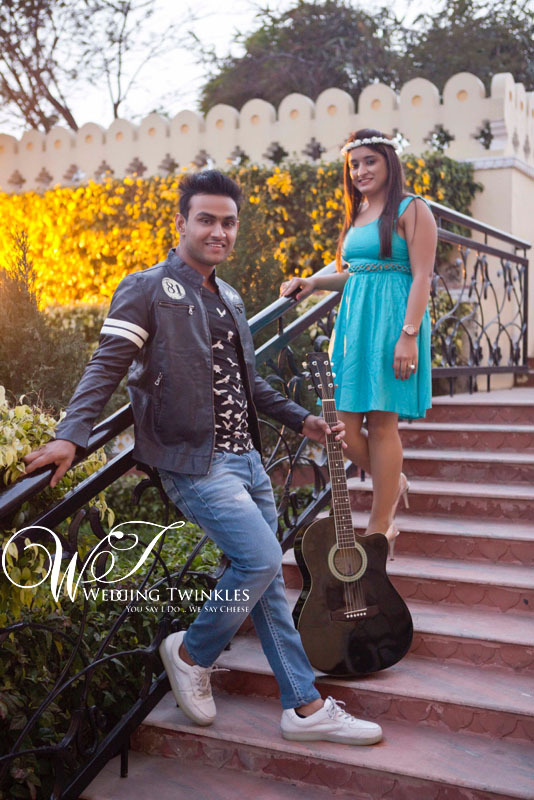 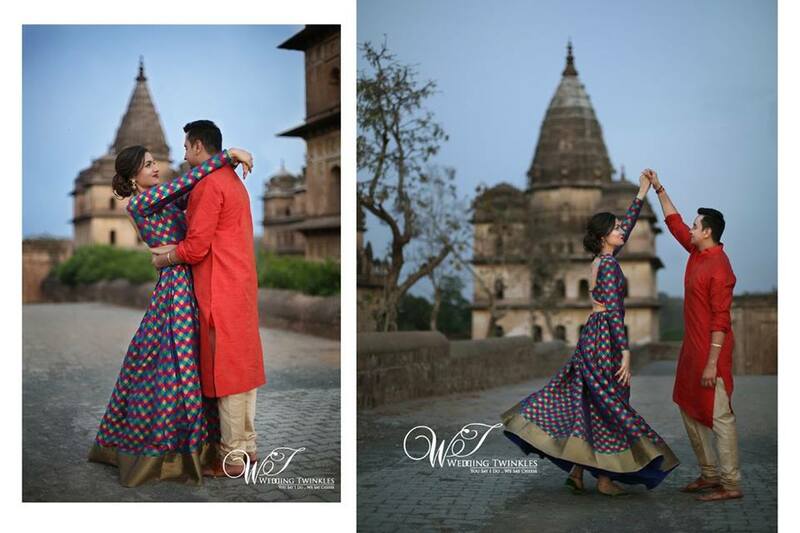 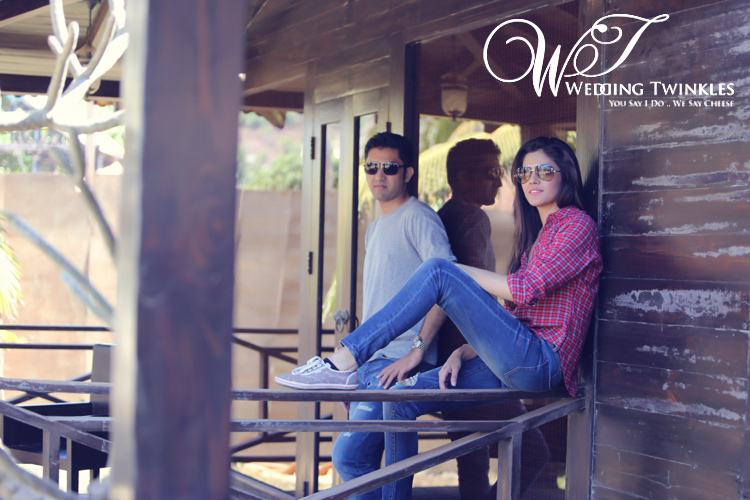 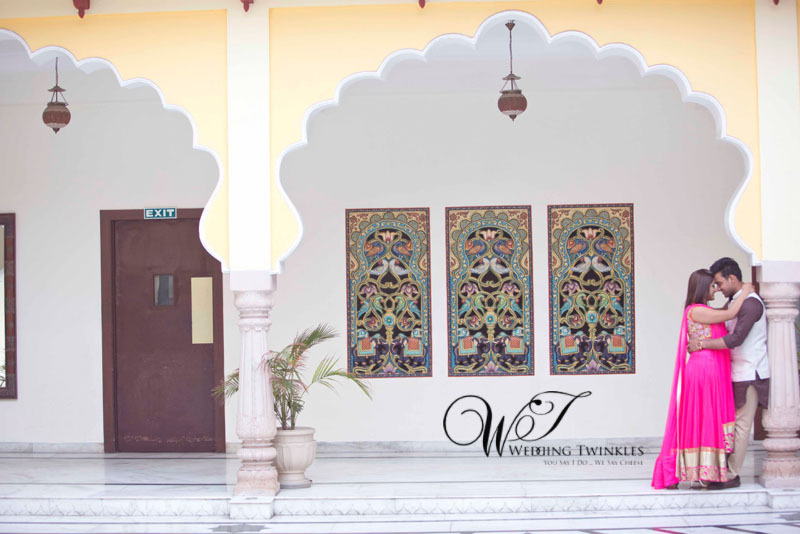 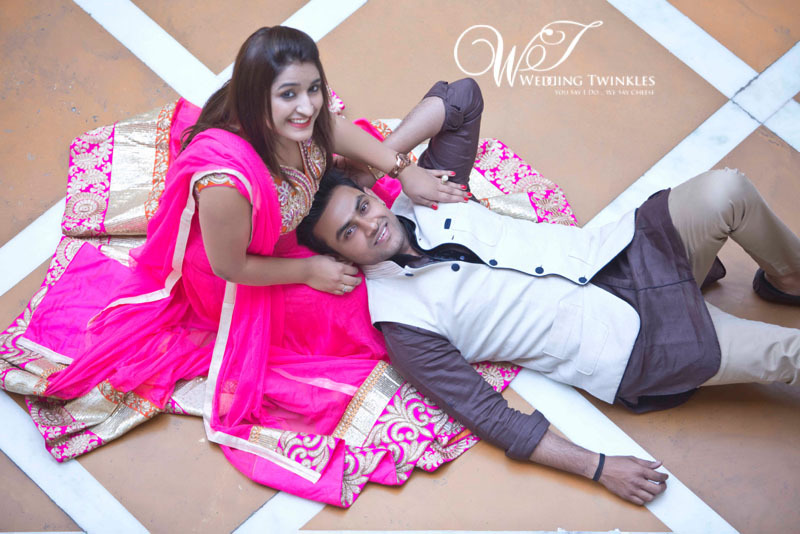 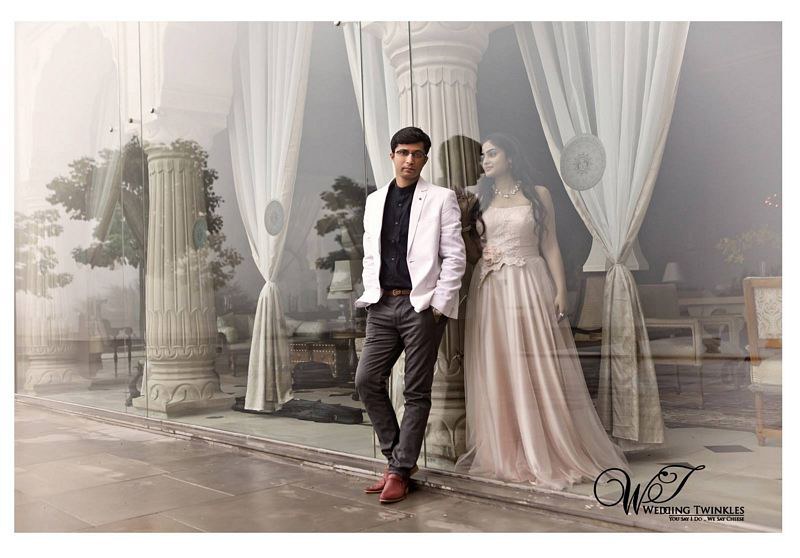 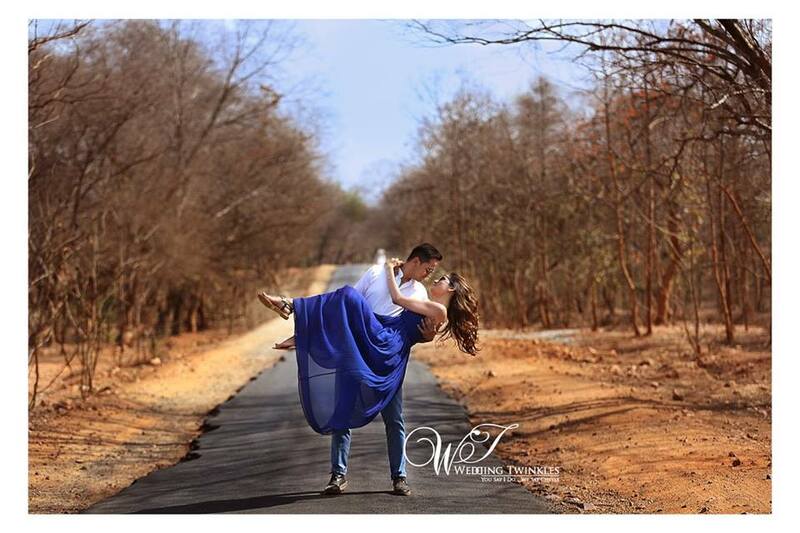 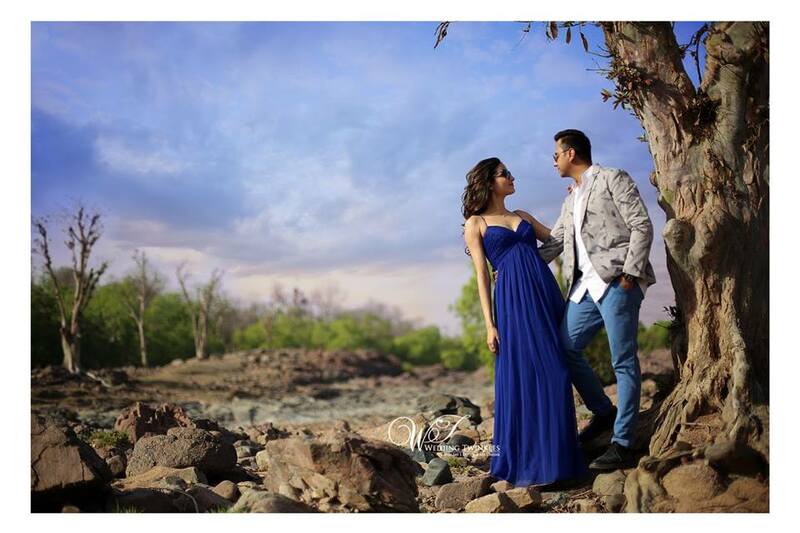 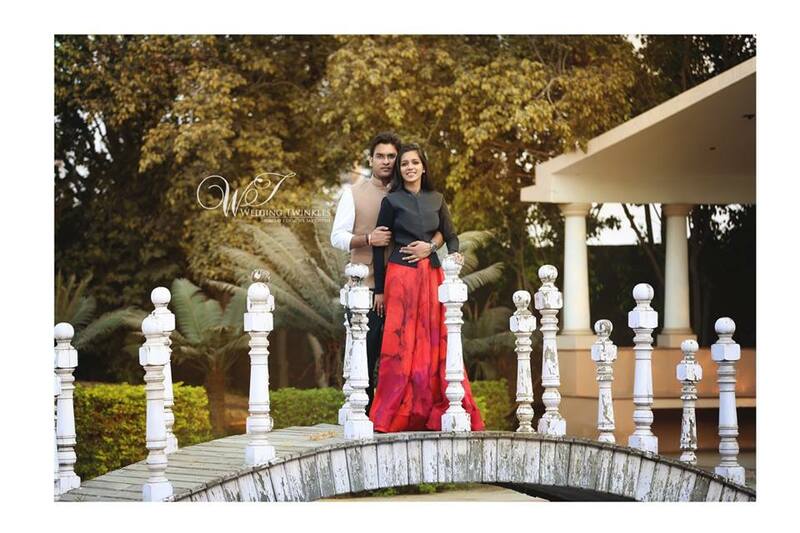 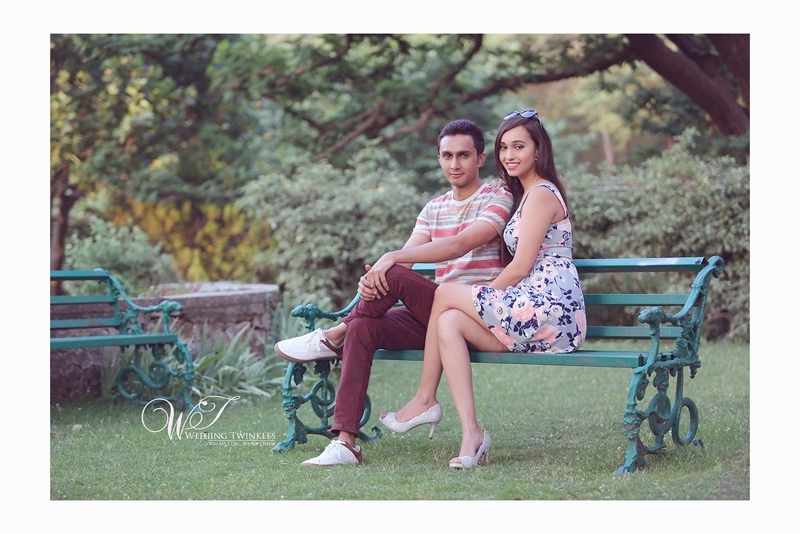 Wedding Twinkles did destination pre-wedding shoot with the lovely couple in Gwalior. 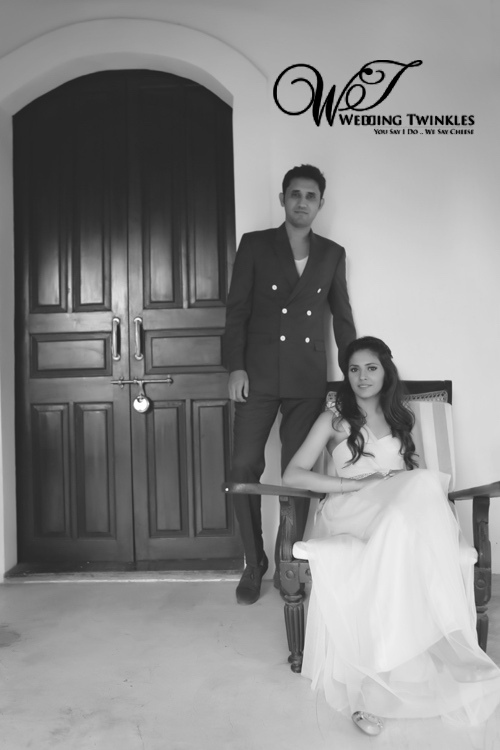 The groom Praveen belongs from the city and wanted the photo-shoot there. 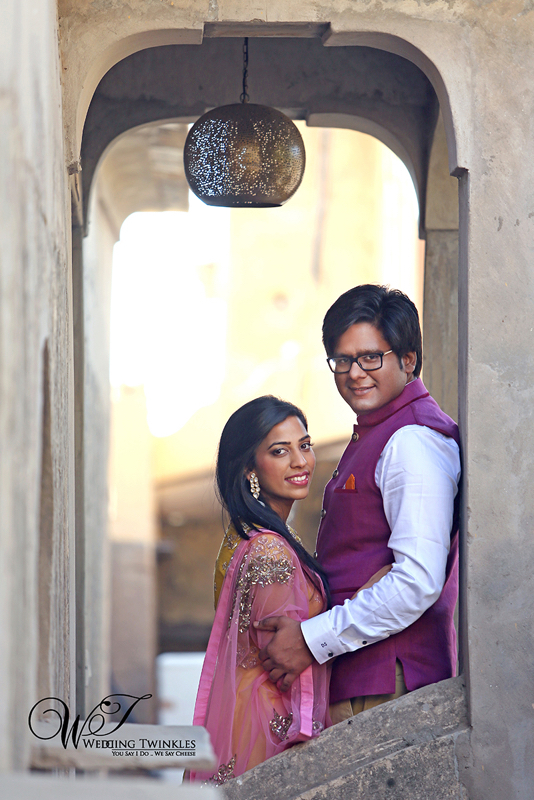 Though they met in a different city but the groom is supposedly born and brought up in Gwalior. 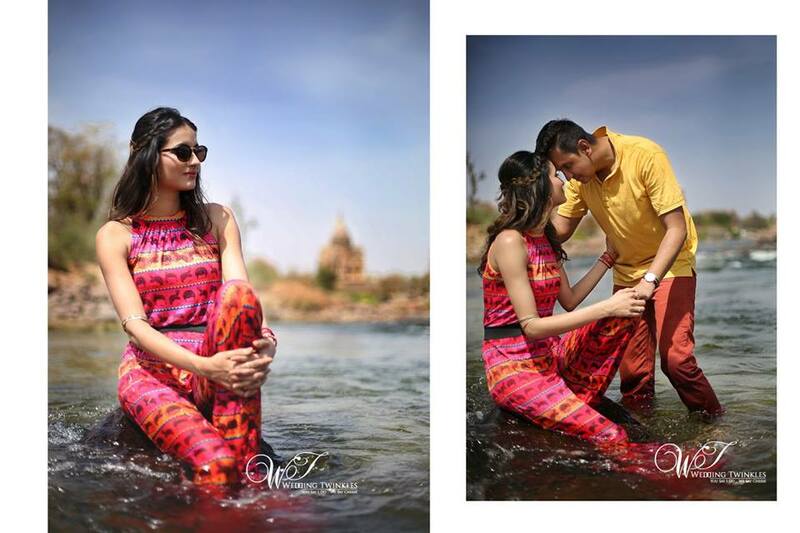 The shoot was mostly done by the hills, river and on the road. 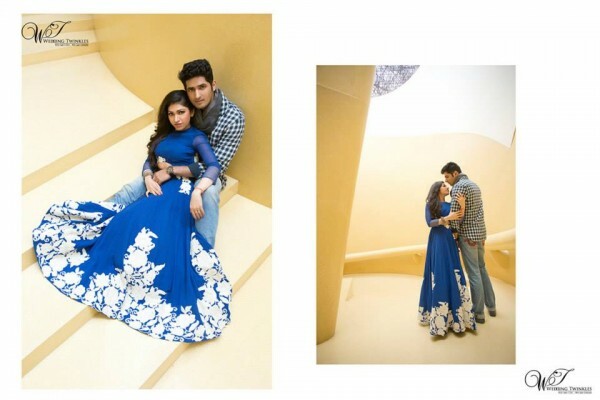 The couple looks extremely good together. 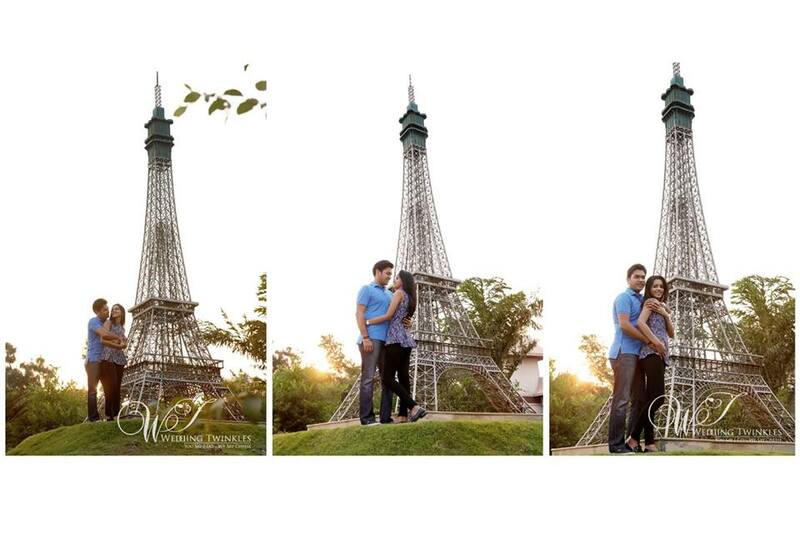 All their poses were so perfect and depicted love. 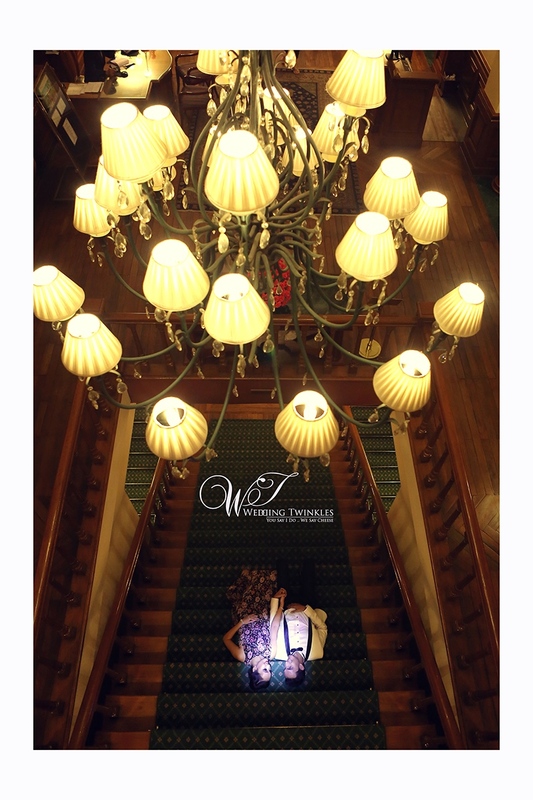 We as a professional wedding photography team had a wonderful time shooting them. Wedding Twinkles always gets good experience shooting the couples. 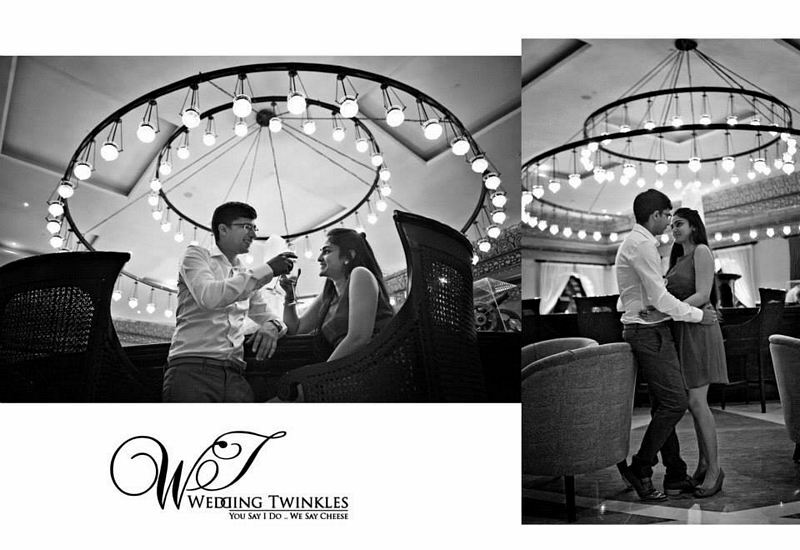 So in love they were- We wish them a very good luck for their marriage and hope they stay together forever. 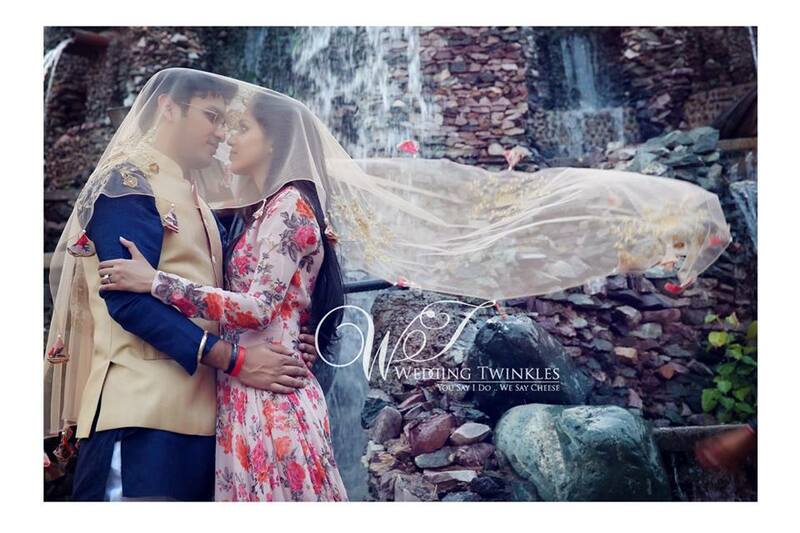 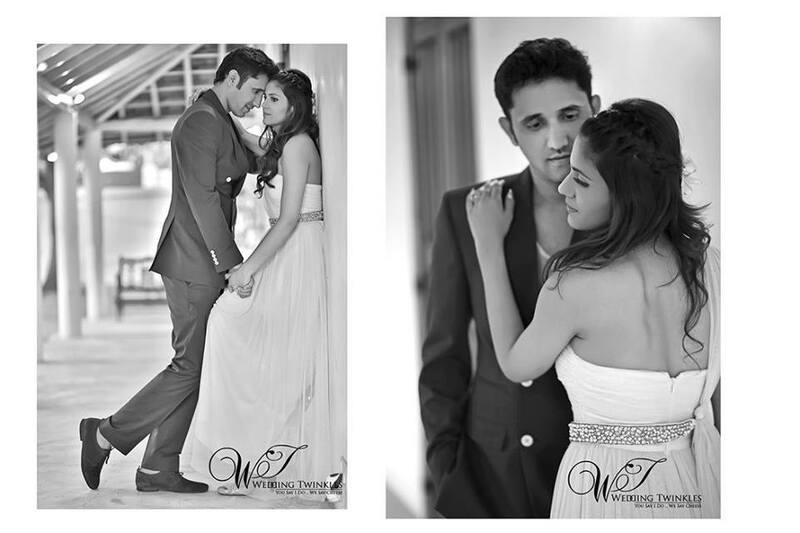 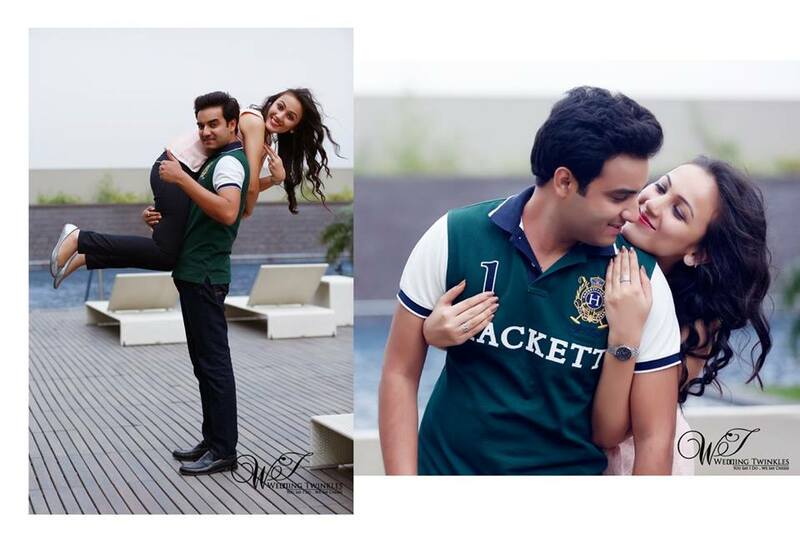 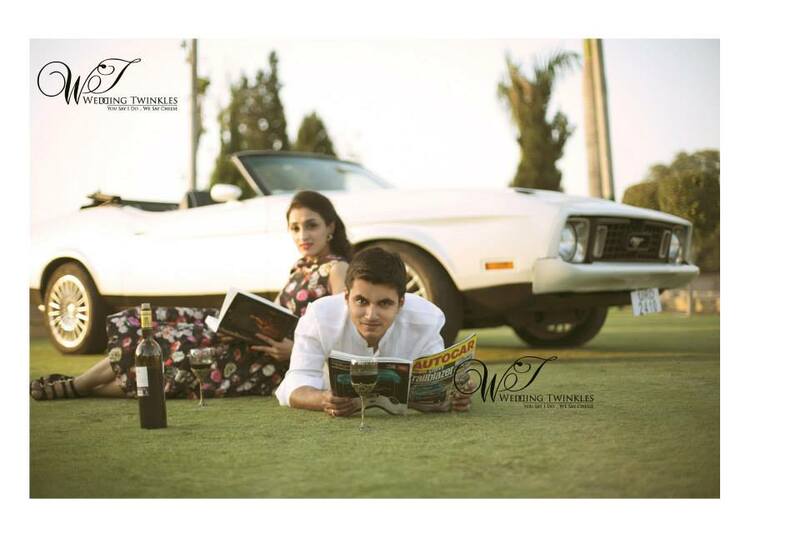 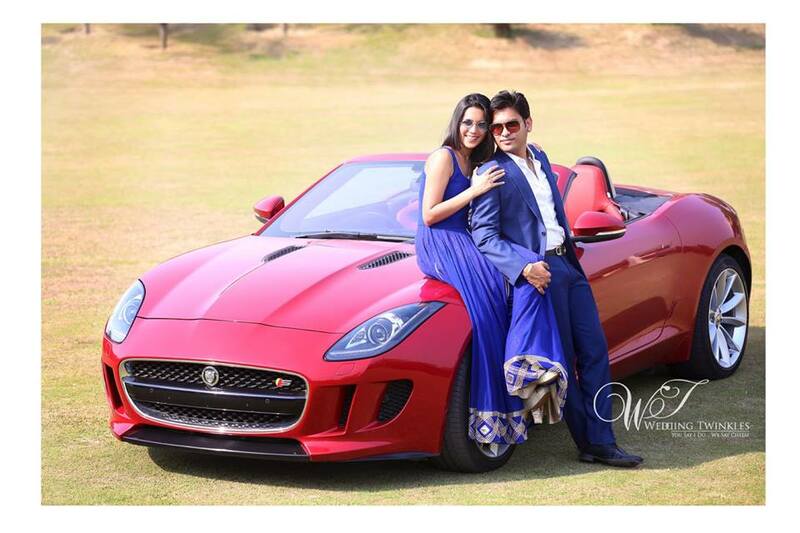 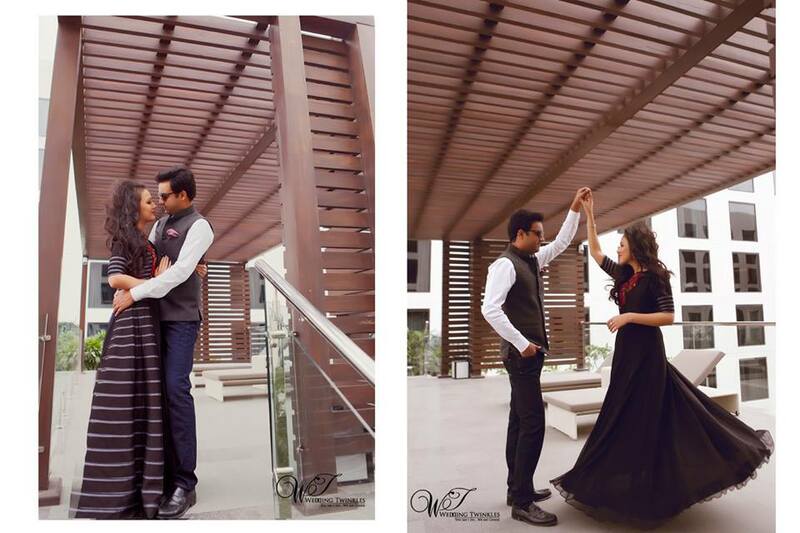 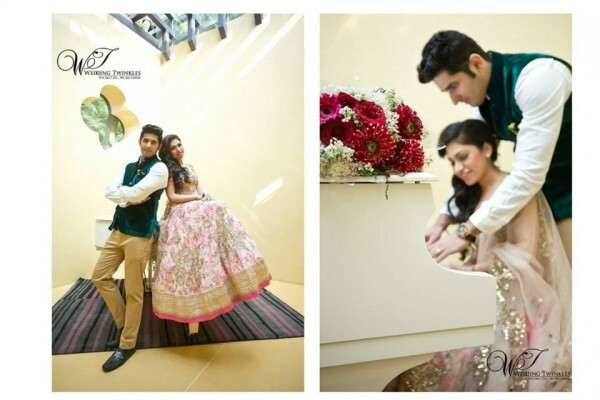 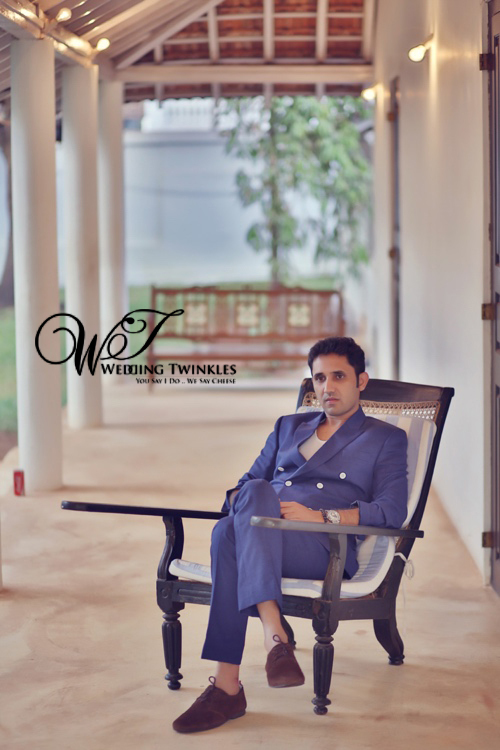 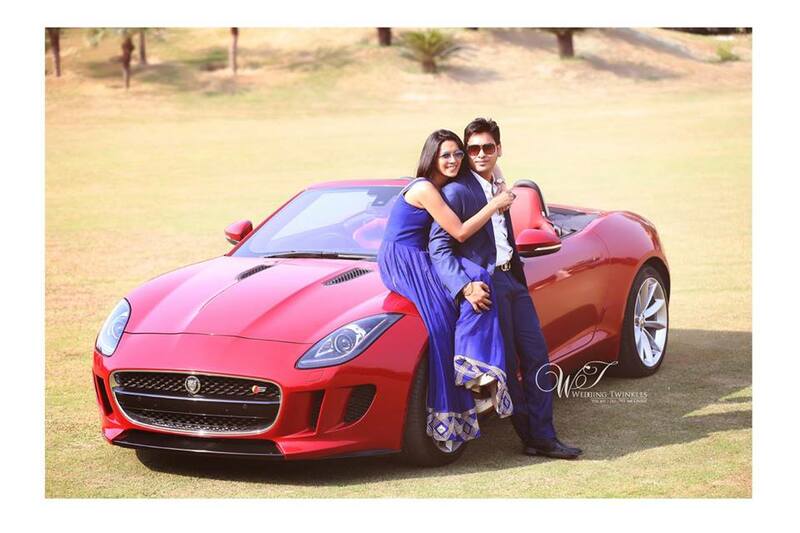 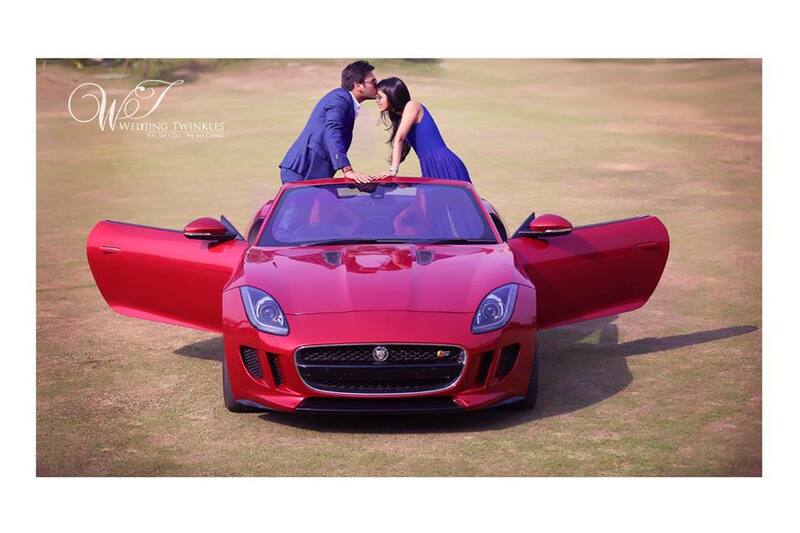 Pre wedding portfolio shoots have become a trending thing these days. 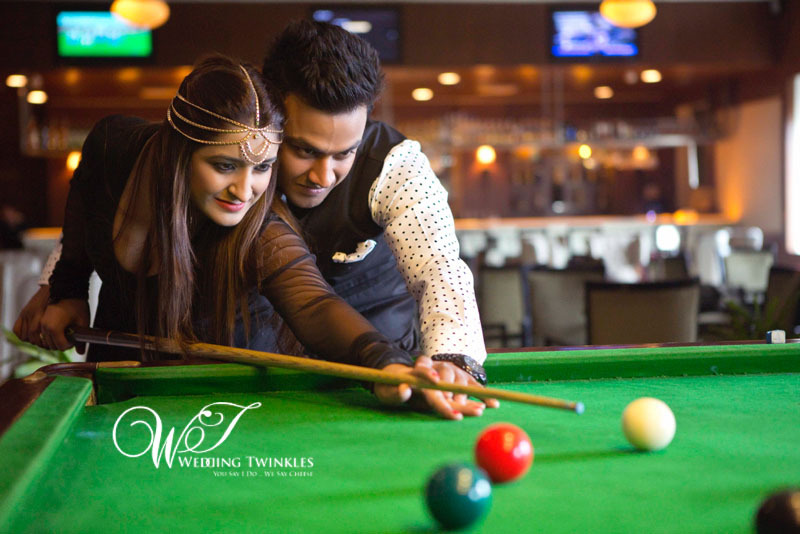 Every couple getting married these days wants one pre wedding shoot of theirs to be done. 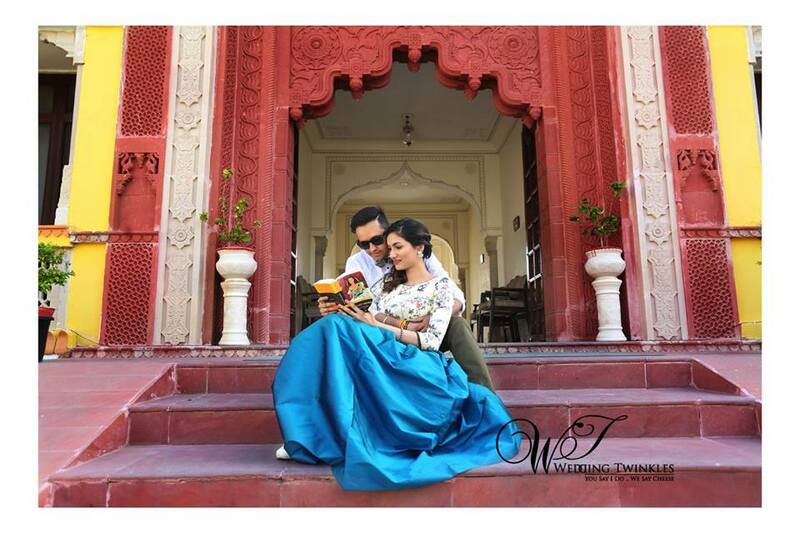 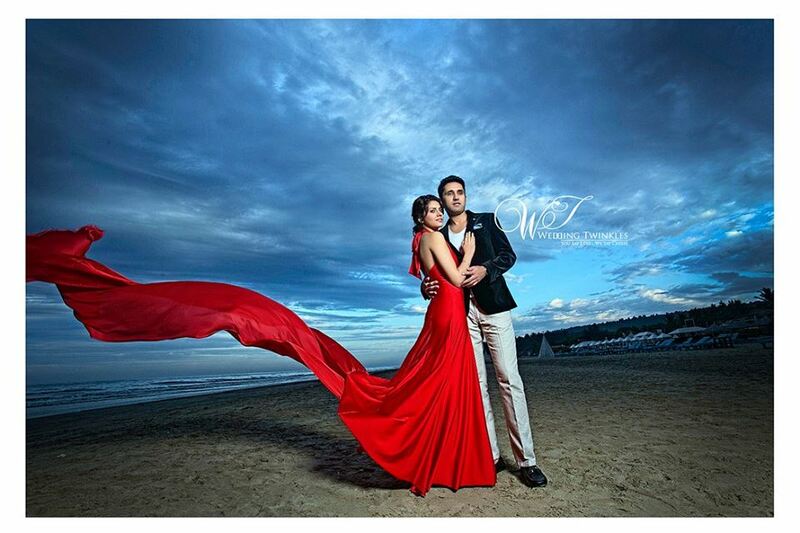 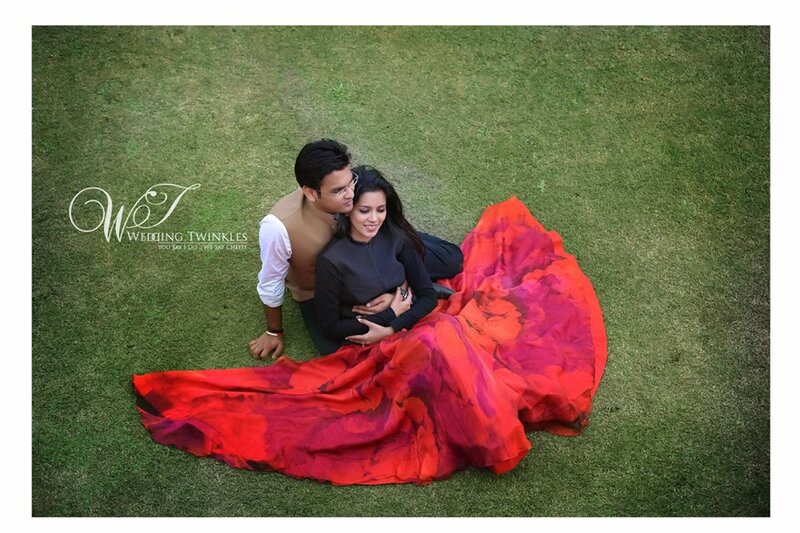 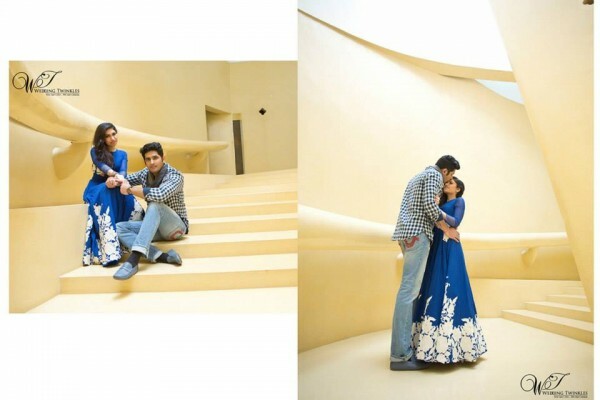 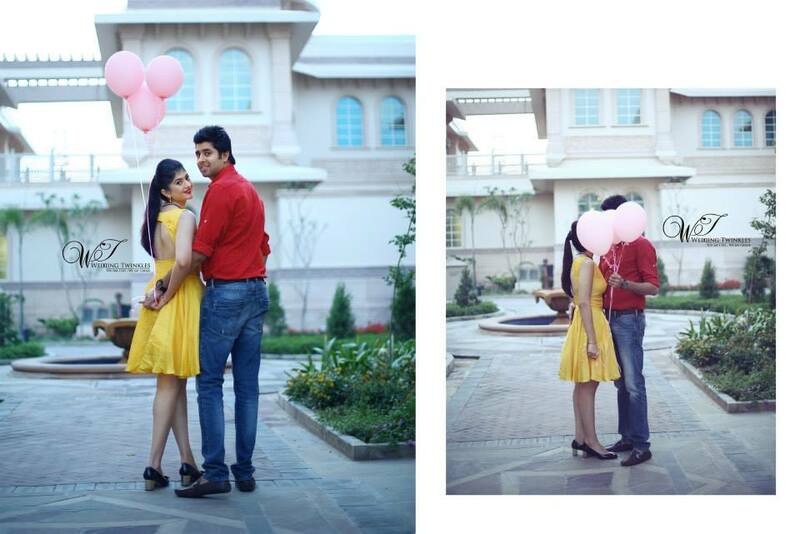 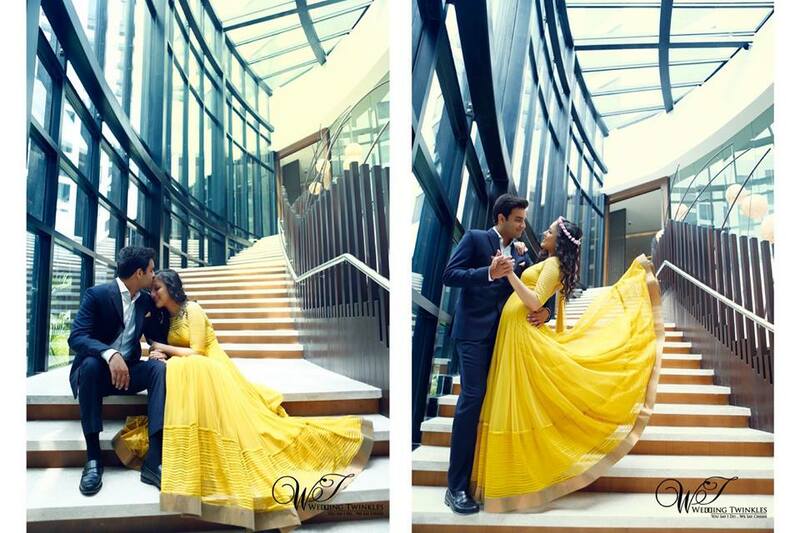 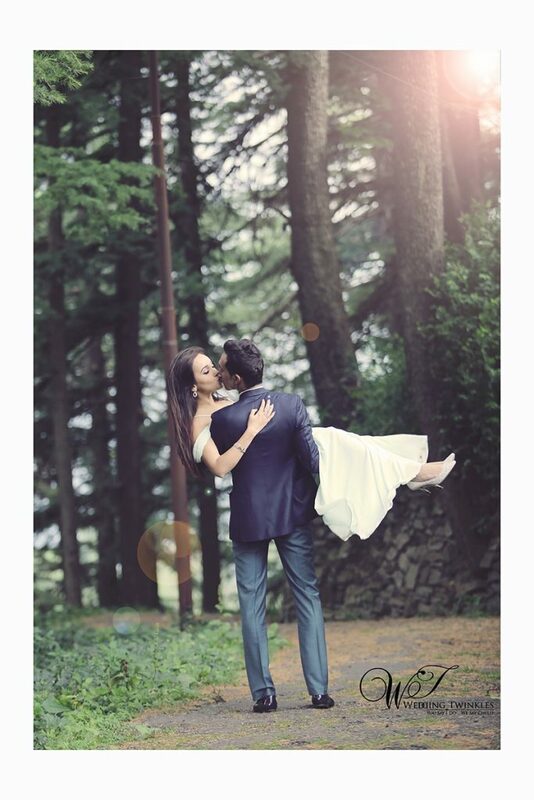 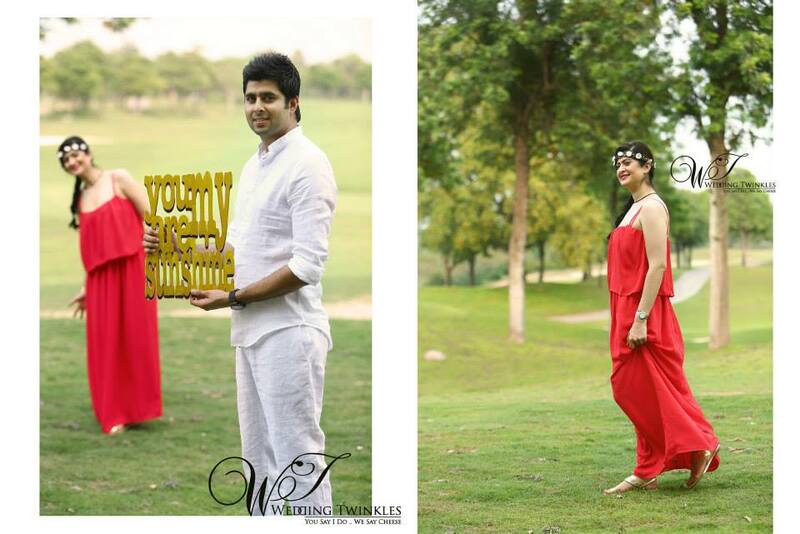 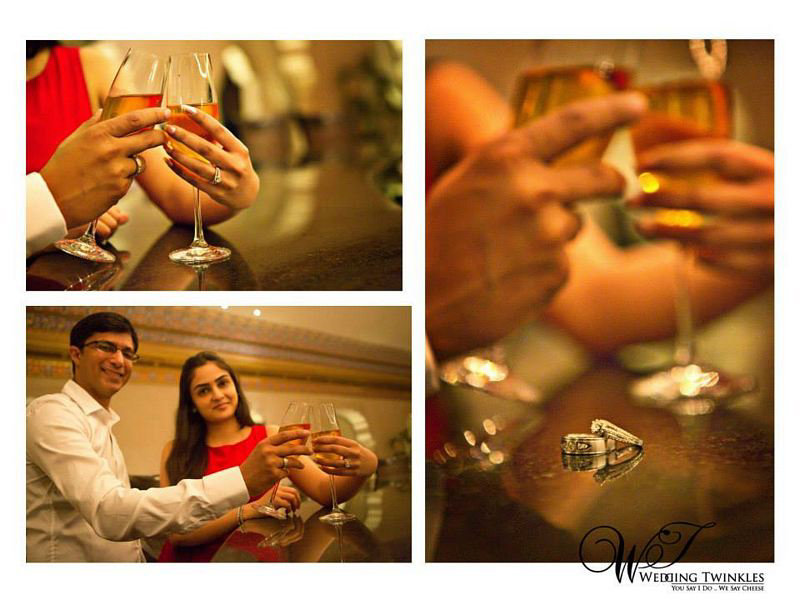 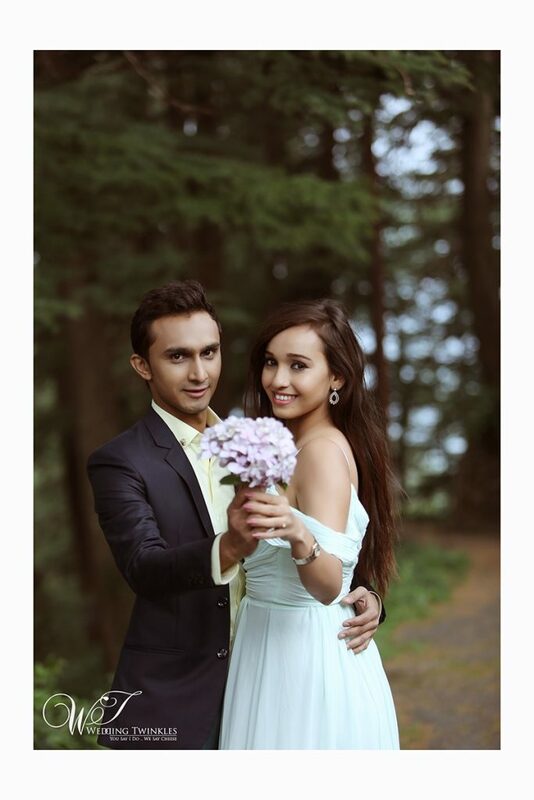 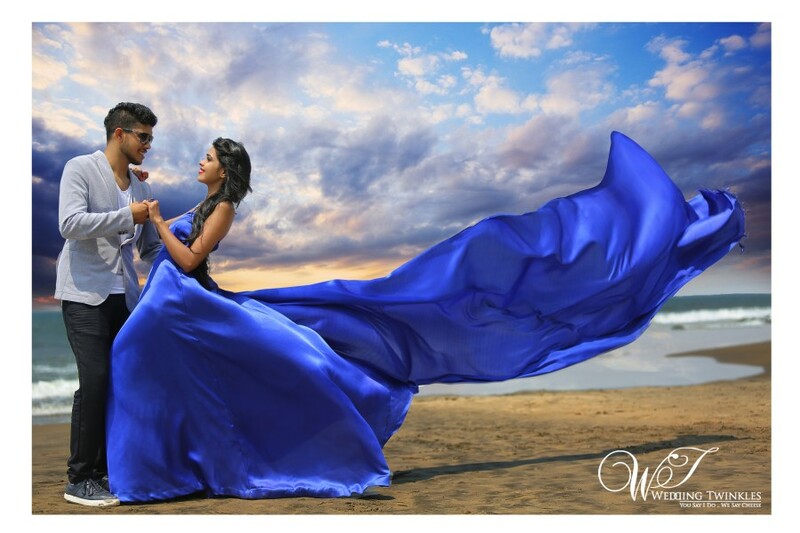 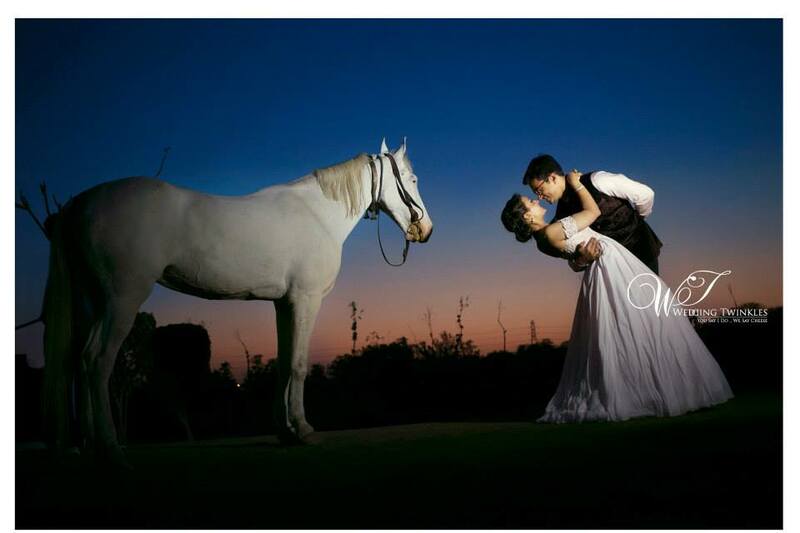 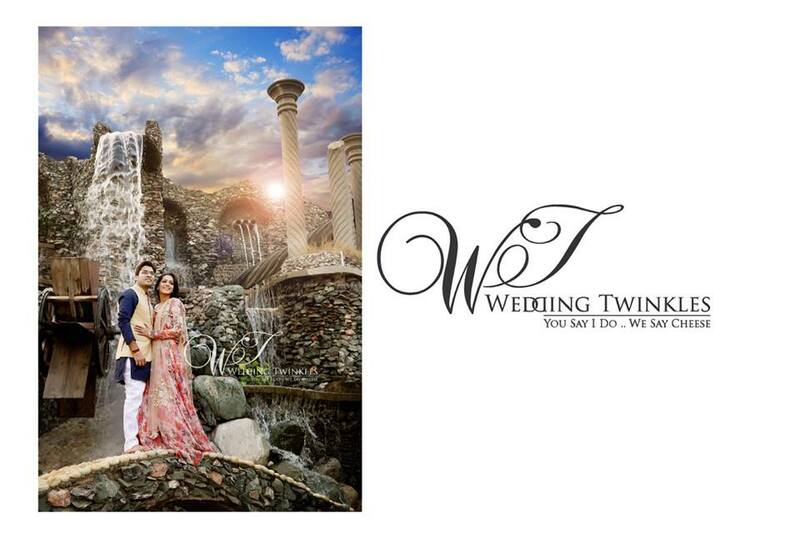 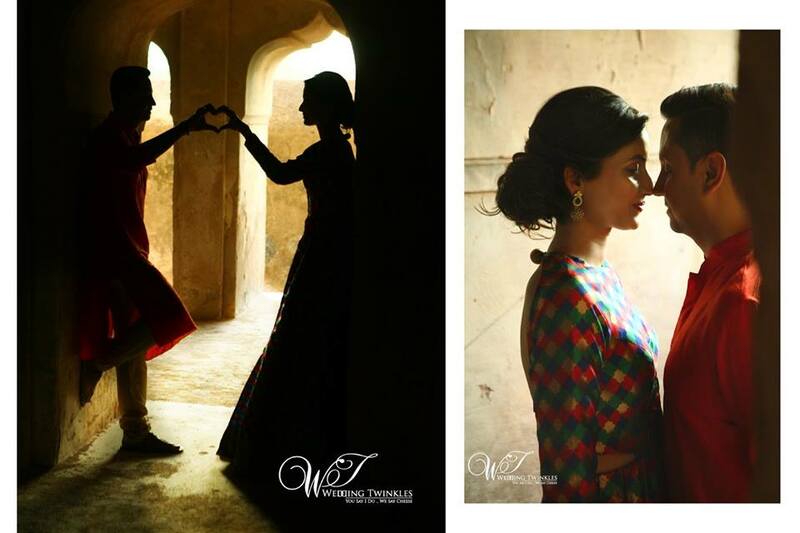 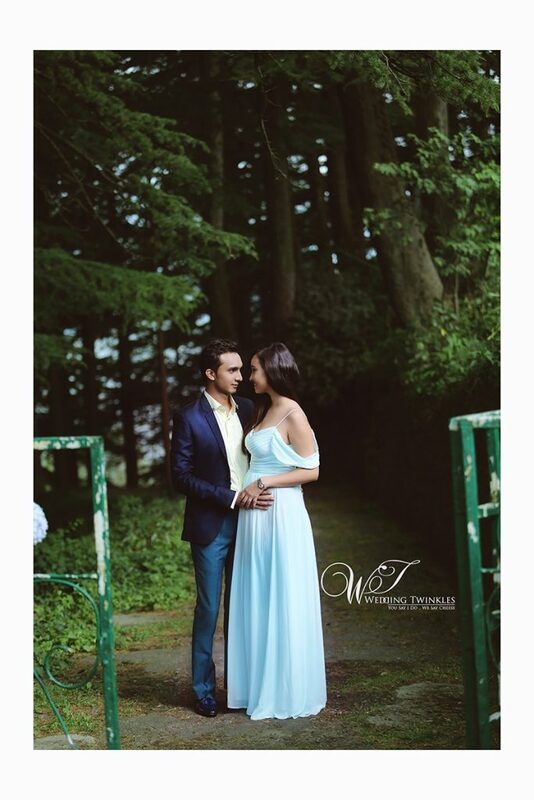 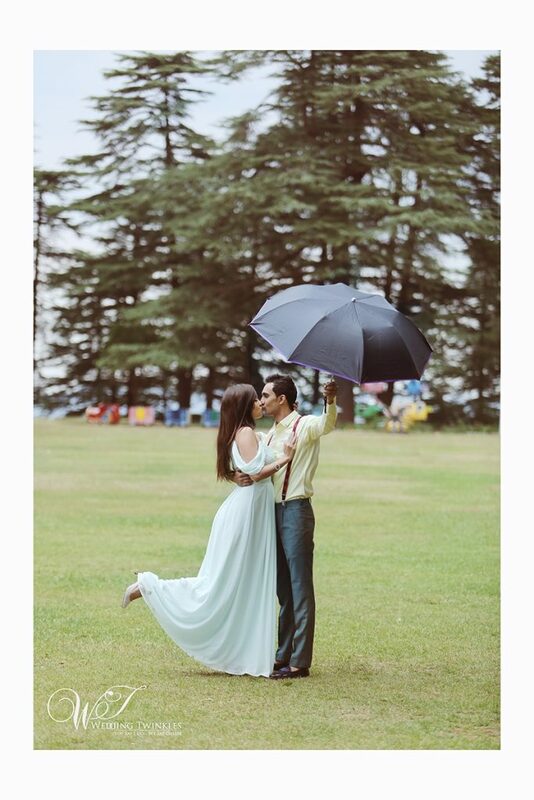 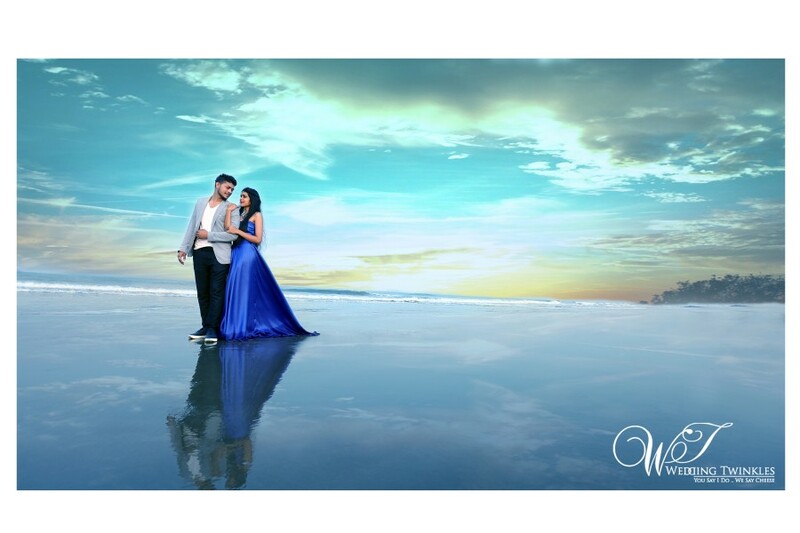 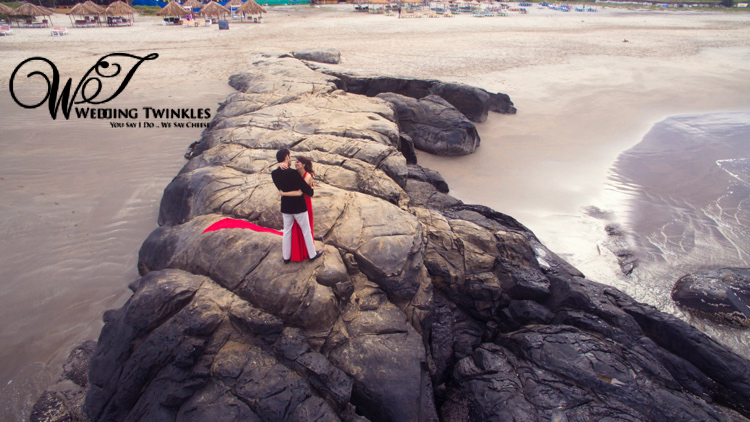 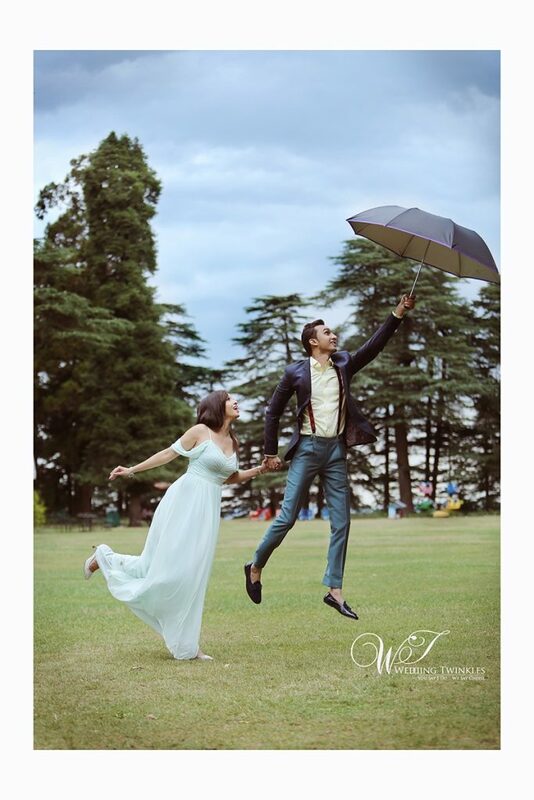 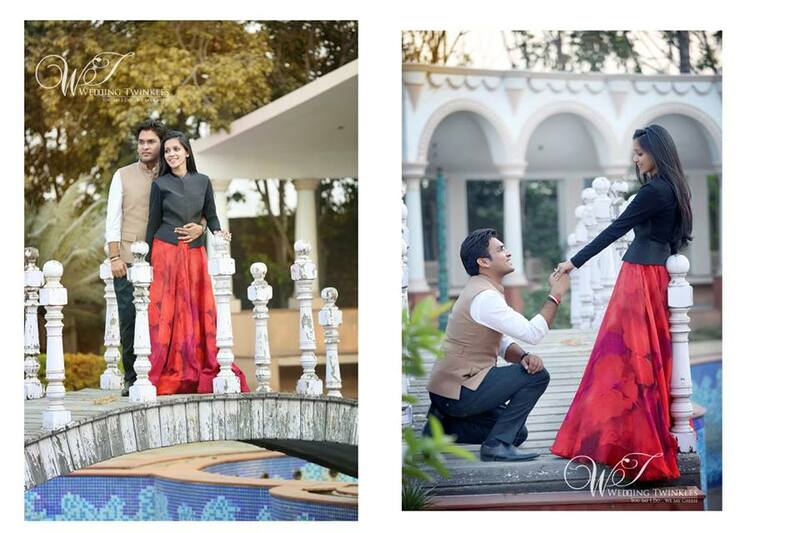 Be it in fancy places, parks, hotels, mansions, forts or palaces pre-wedding photo shoots are very much in demand. 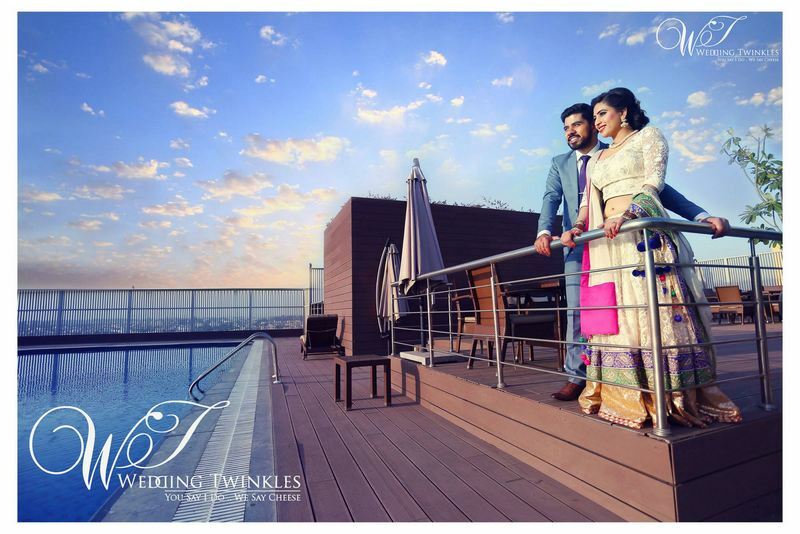 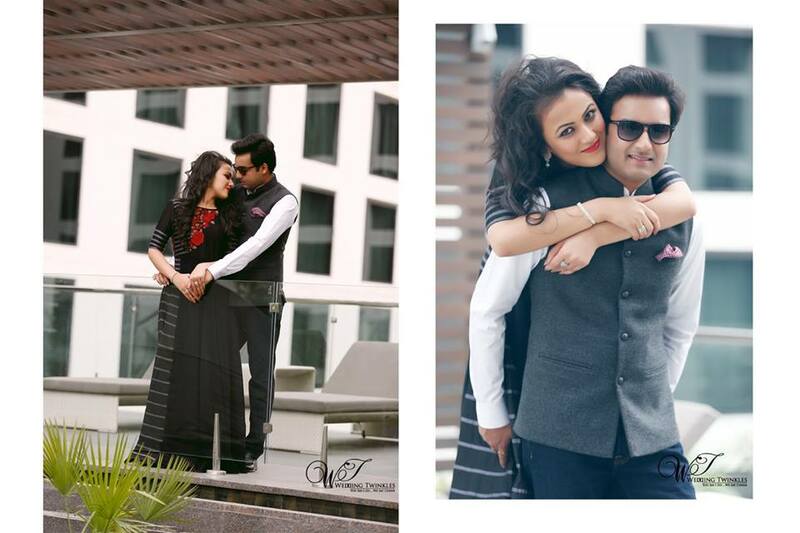 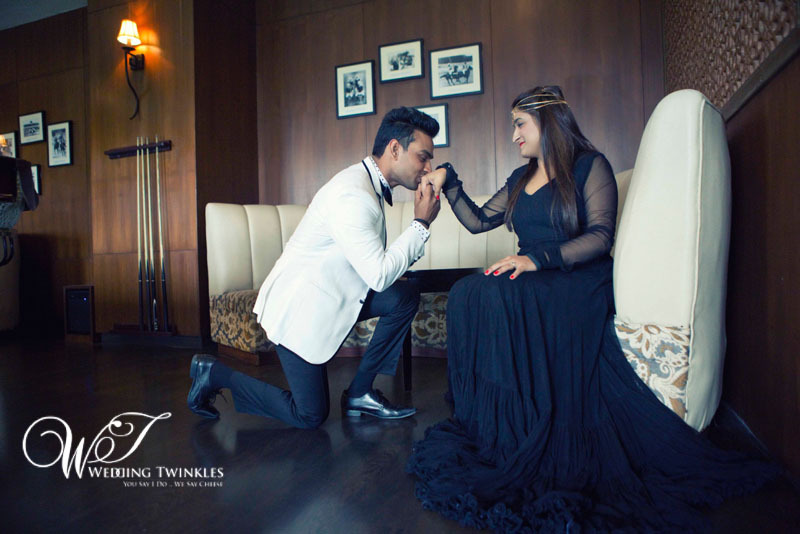 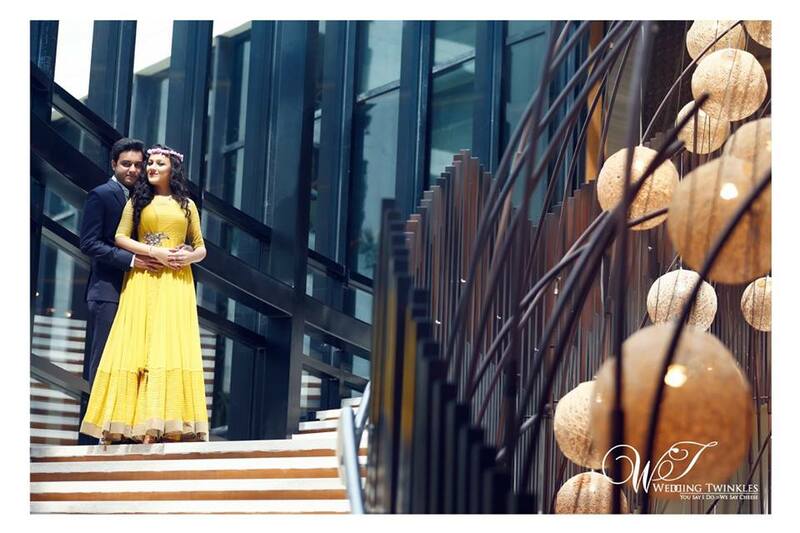 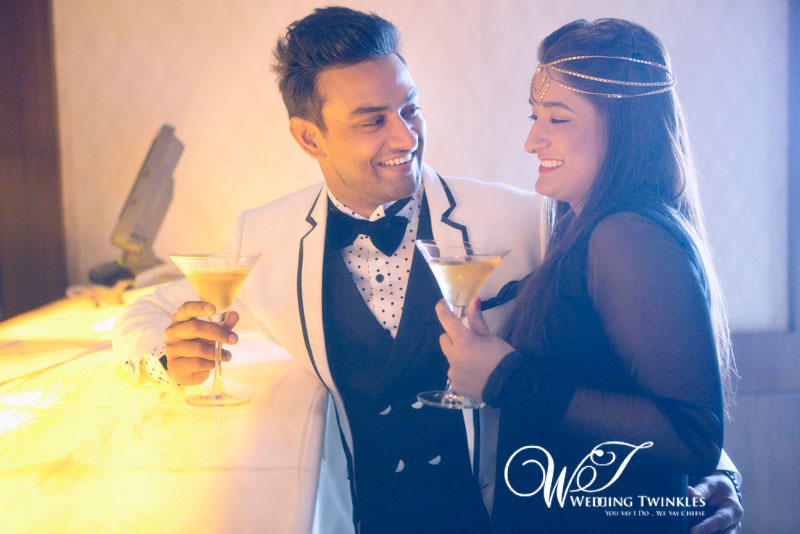 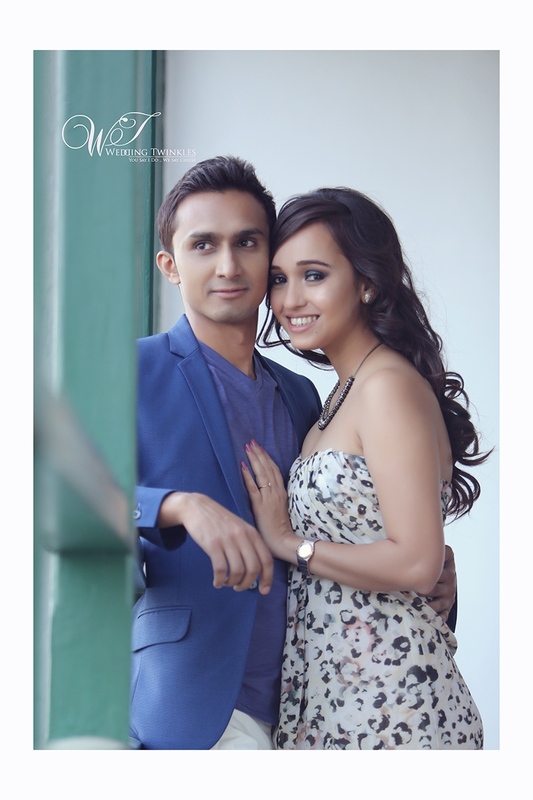 Wedding Twinkles recently had done a professional pre wedding shoot with the couple Arjun and Vanshika in Novotel, Aerocity. 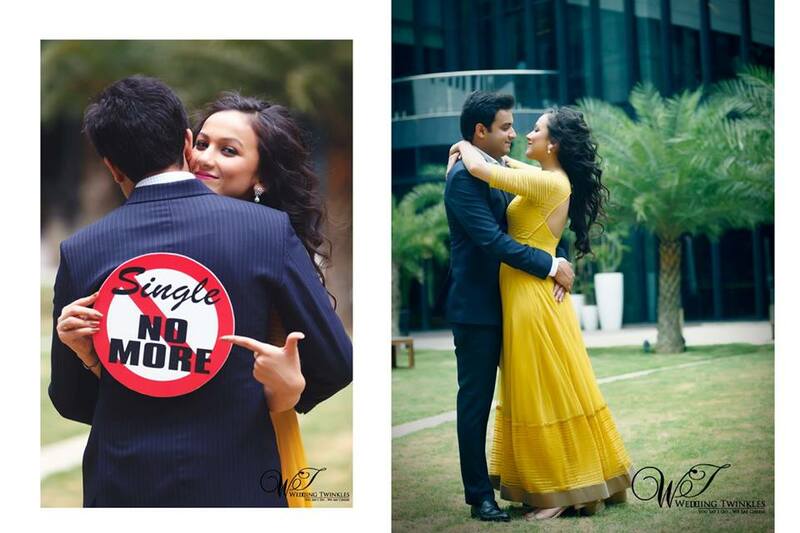 They are getting hitched in an arranged way. 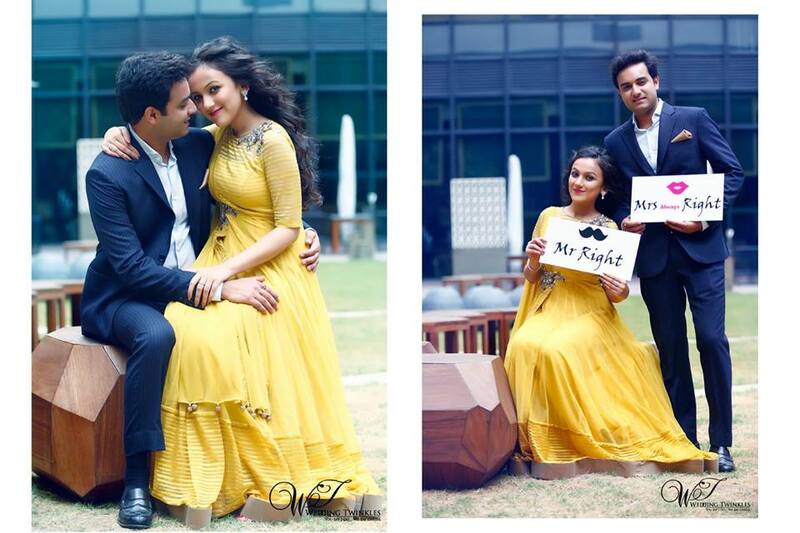 Both the bride and the groom looked absolutely adorable in all the photographs. 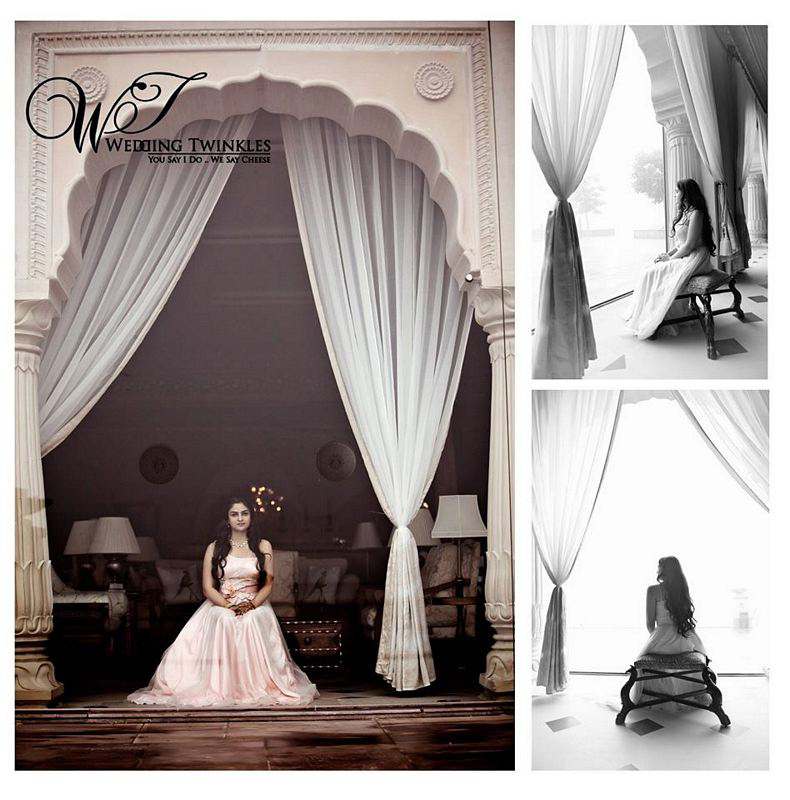 Starting from hotel rooms, to parks to bath tubs we have experimented with them in every angle and poses. 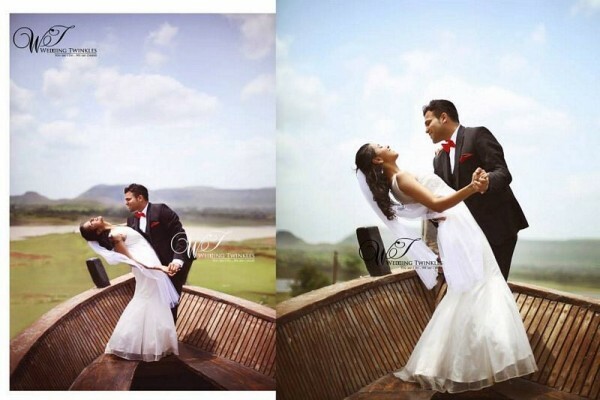 Though getting married in an arranged marriage affair both looked immensely in love with each other. 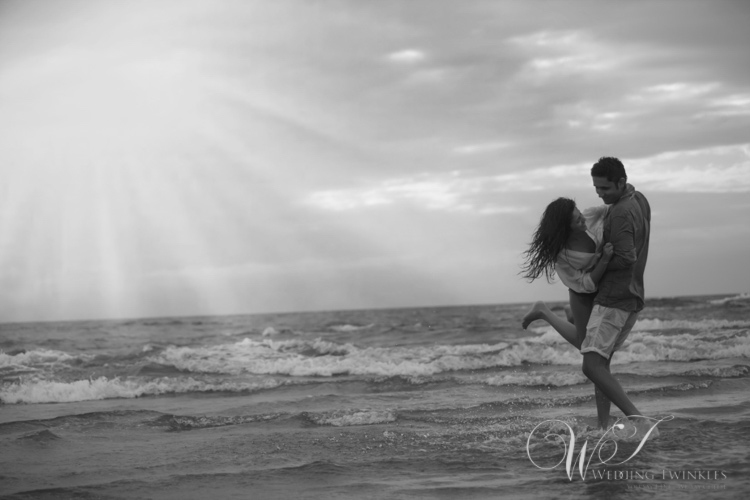 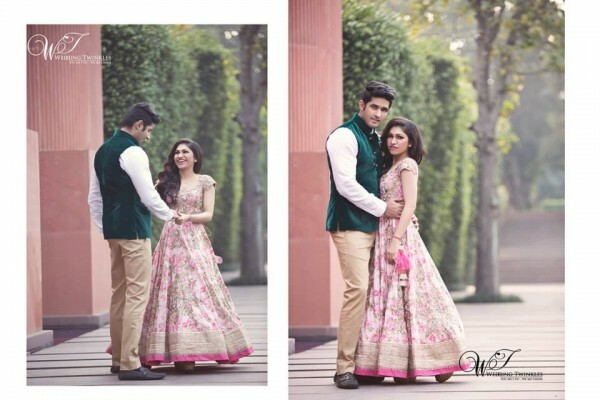 Their sweet blush, shyness and the love made the pictures look exceptionally wonderful. 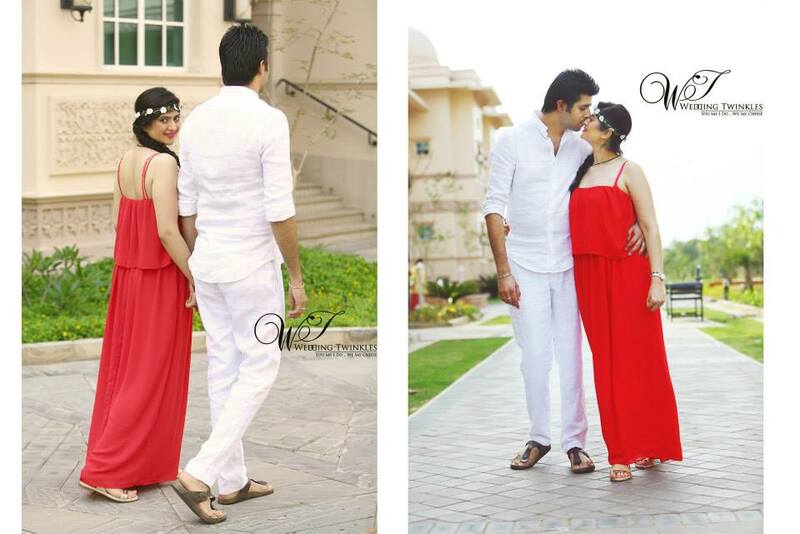 The poses they gave were very natural and sweet. 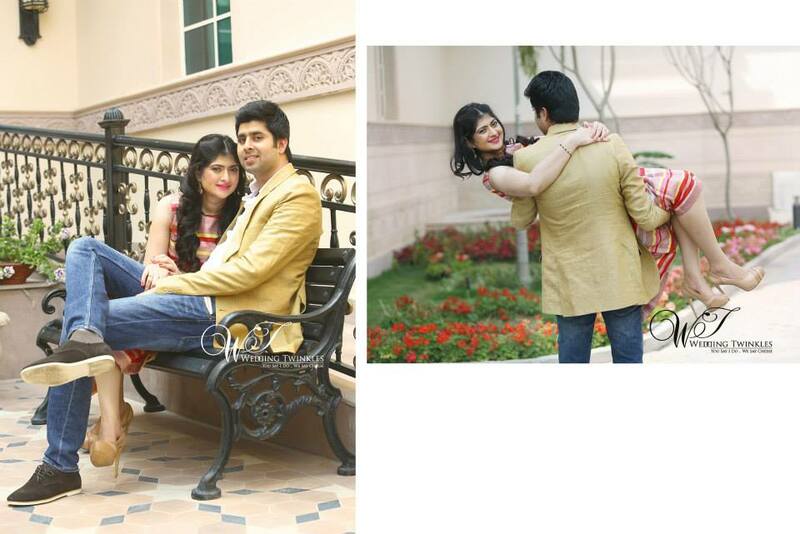 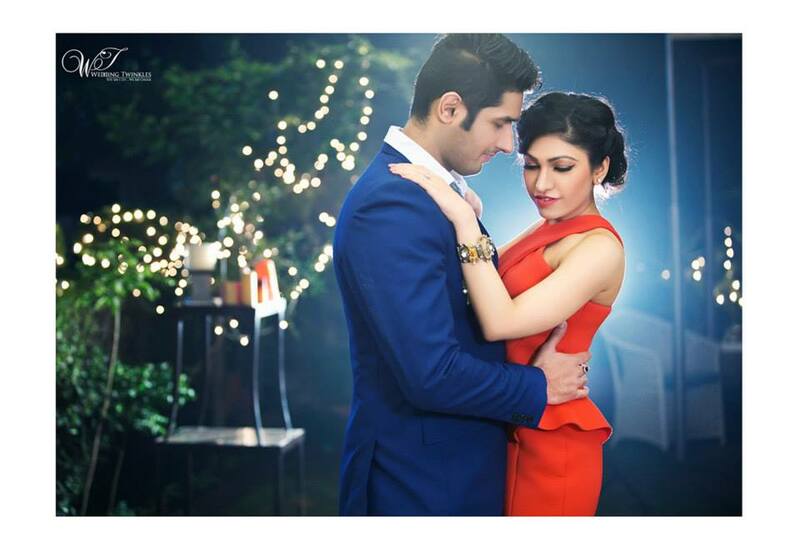 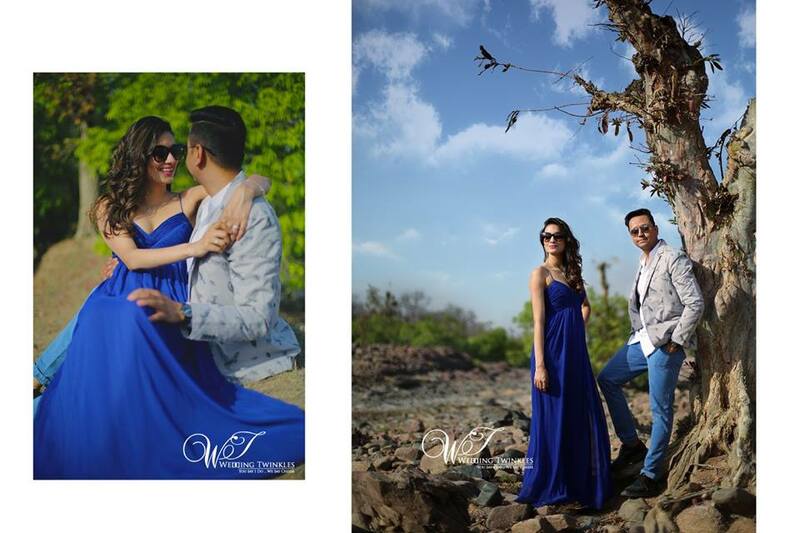 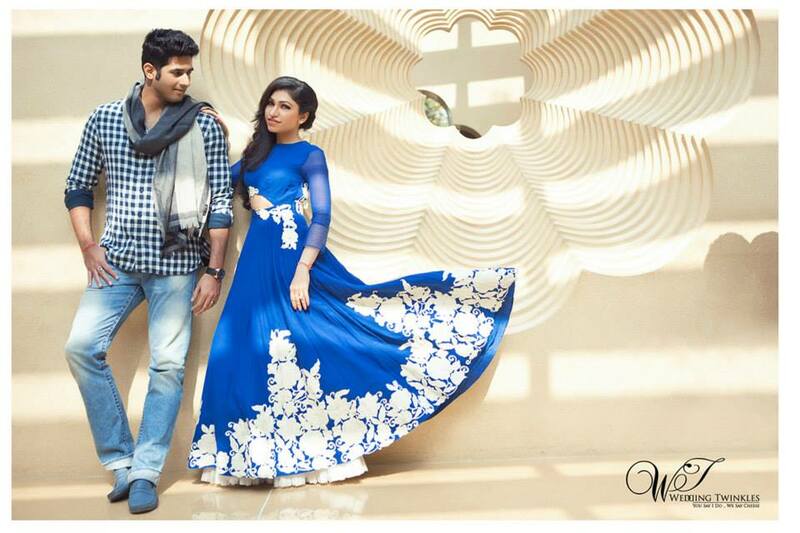 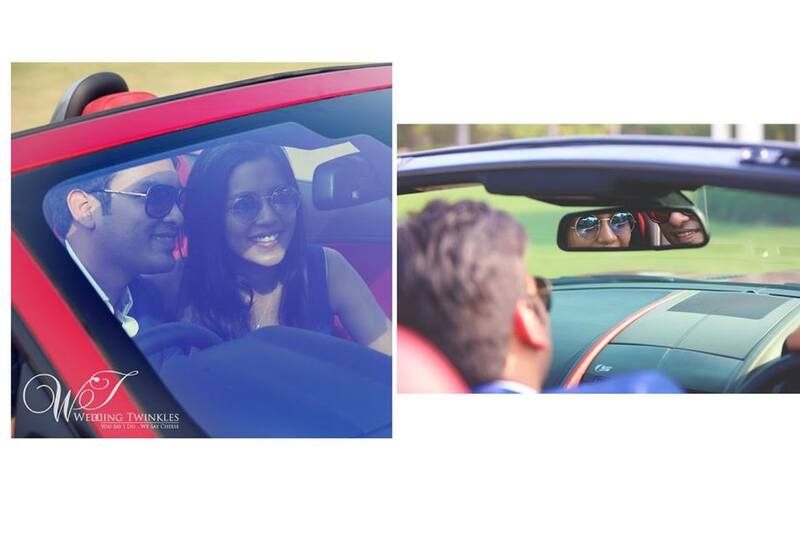 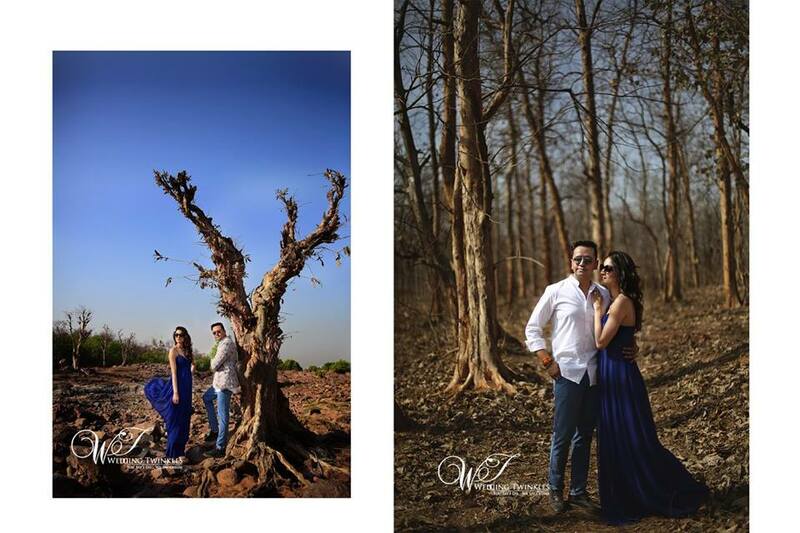 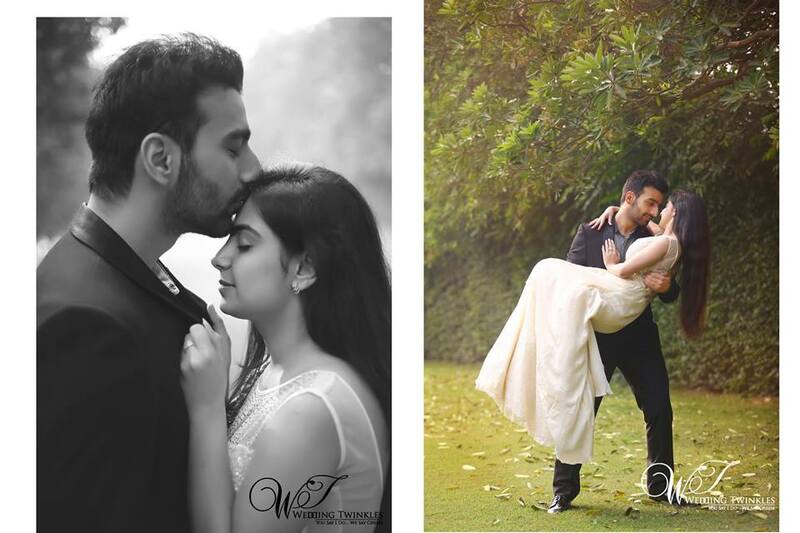 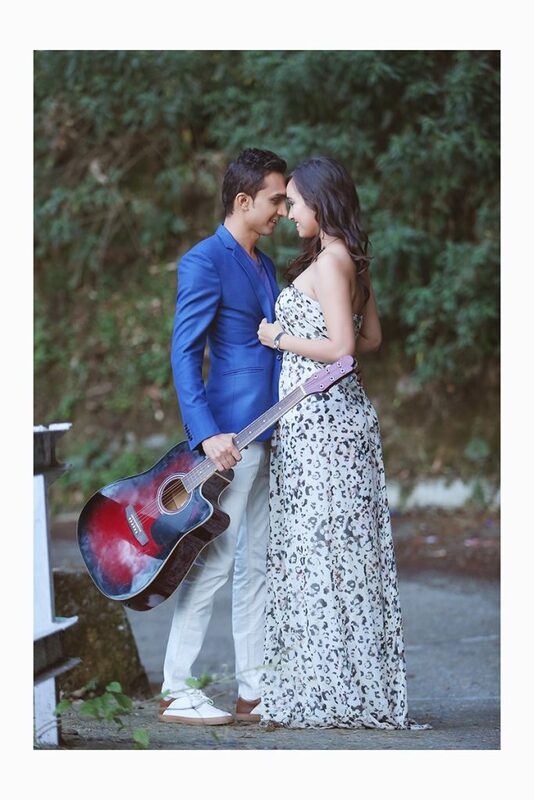 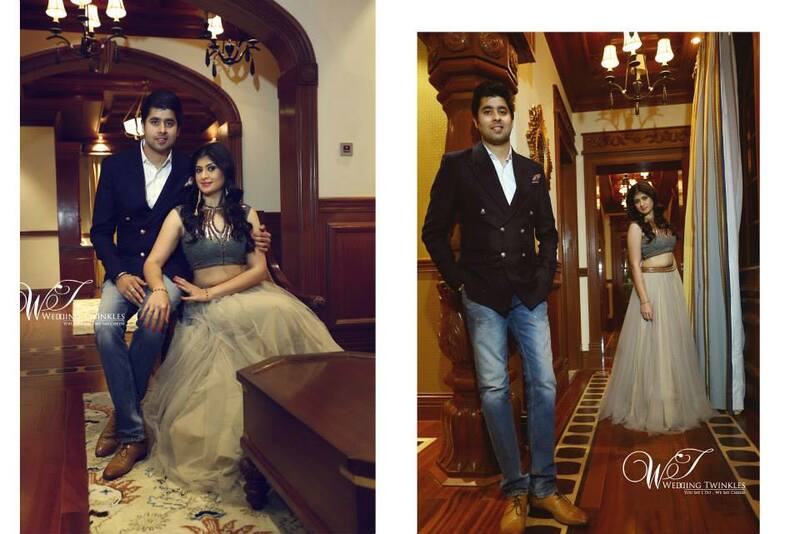 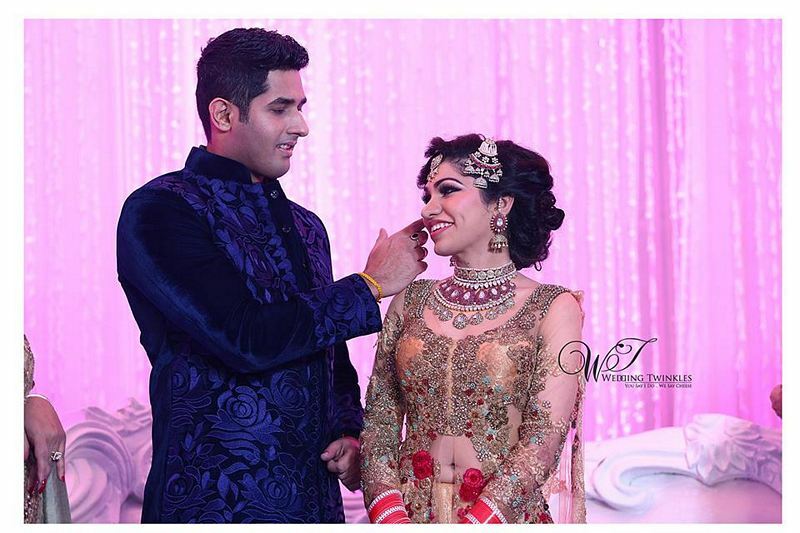 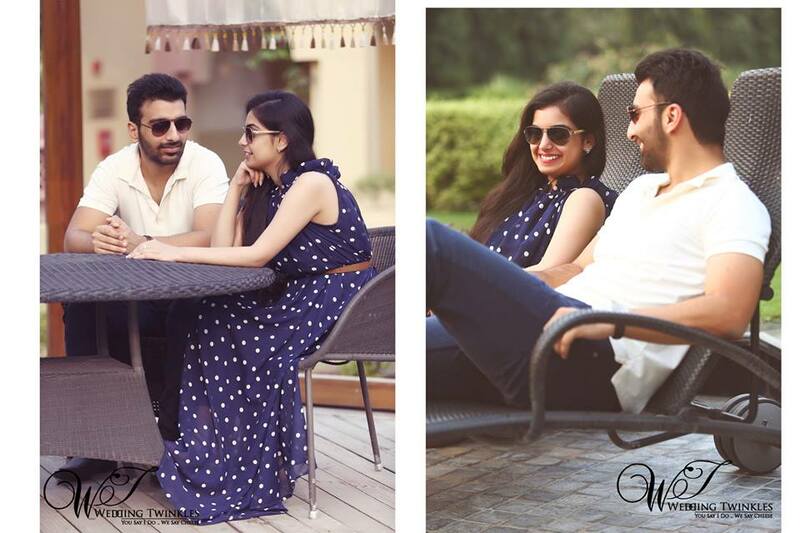 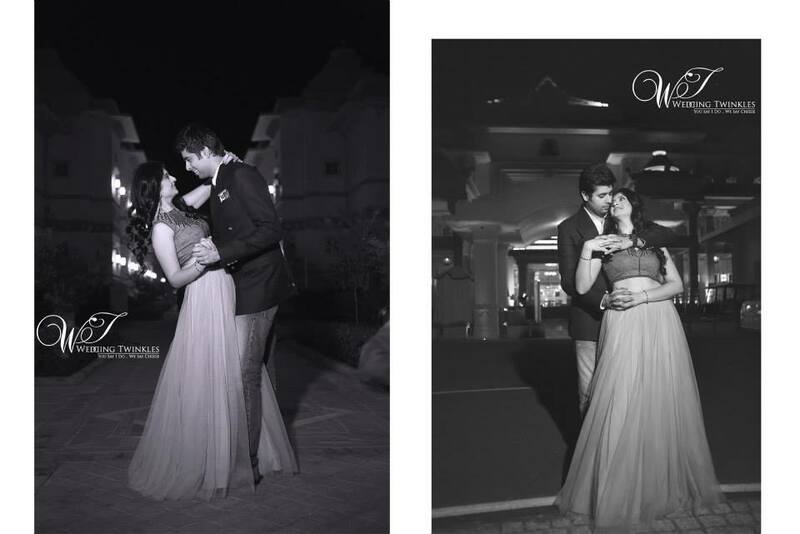 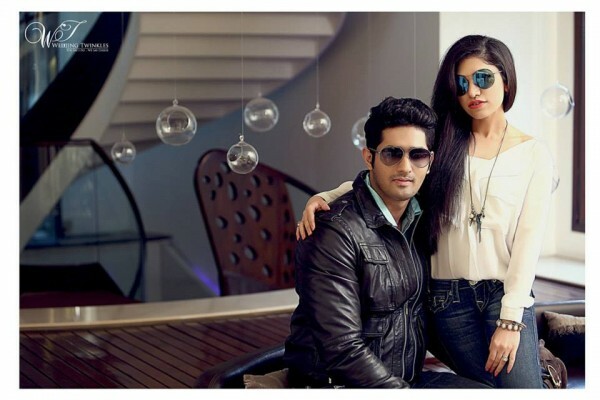 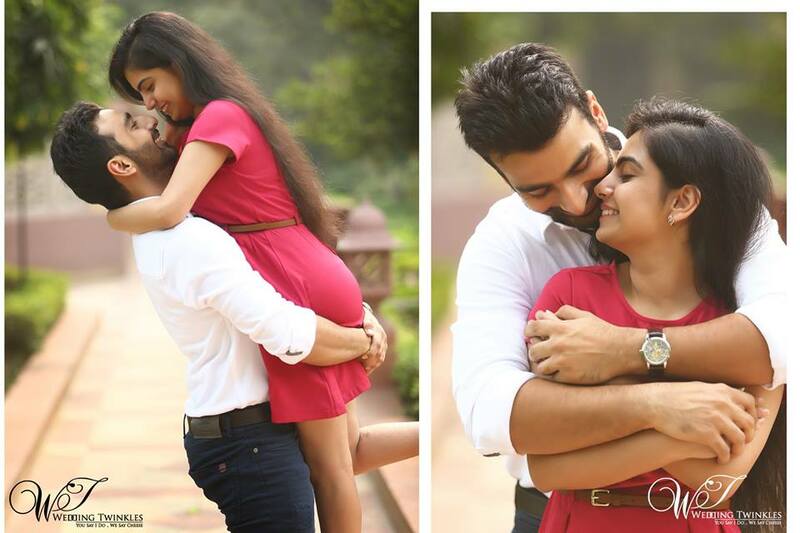 All the pictures came out beautiful and of course the credit goes to the couple Arjun and Vanshika. 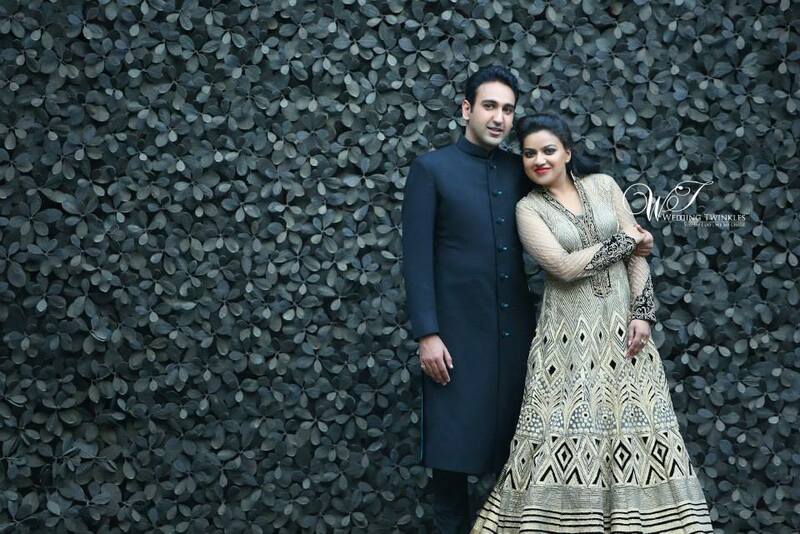 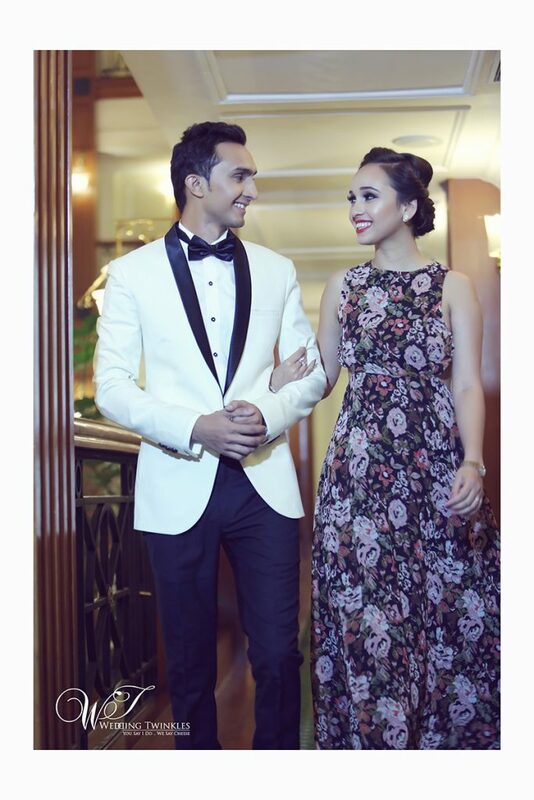 The couple was seen wearing formal attire-Striped suits, floor length gowns and many more. 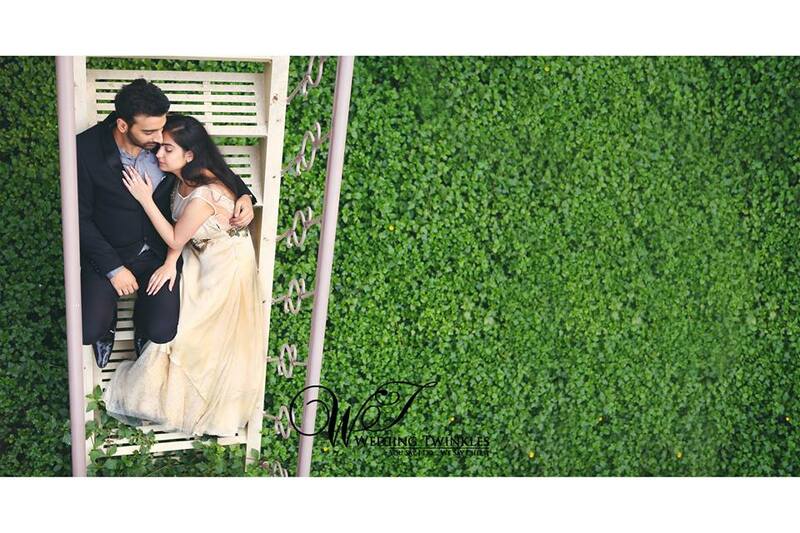 Their tender love, subtle emotion on their faces makes them look so perfect for each other. 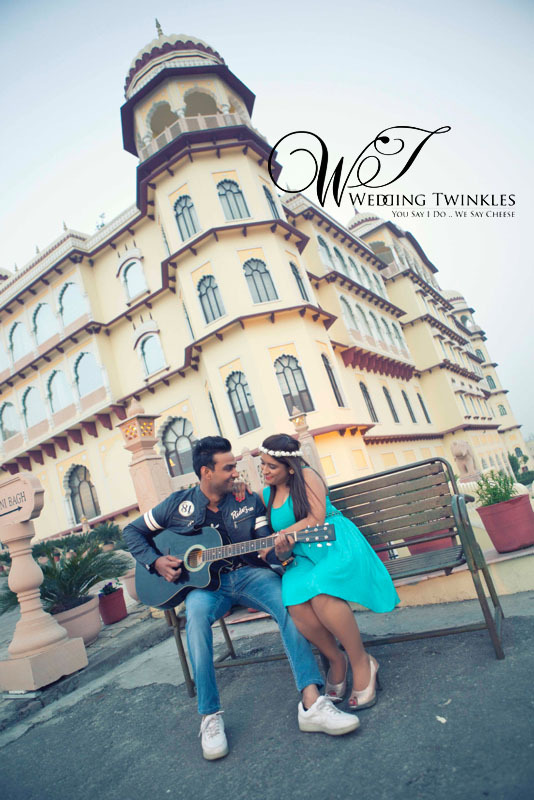 We wish the couple a very good luck for their marriage from the whole team of Wedding Twinkles. 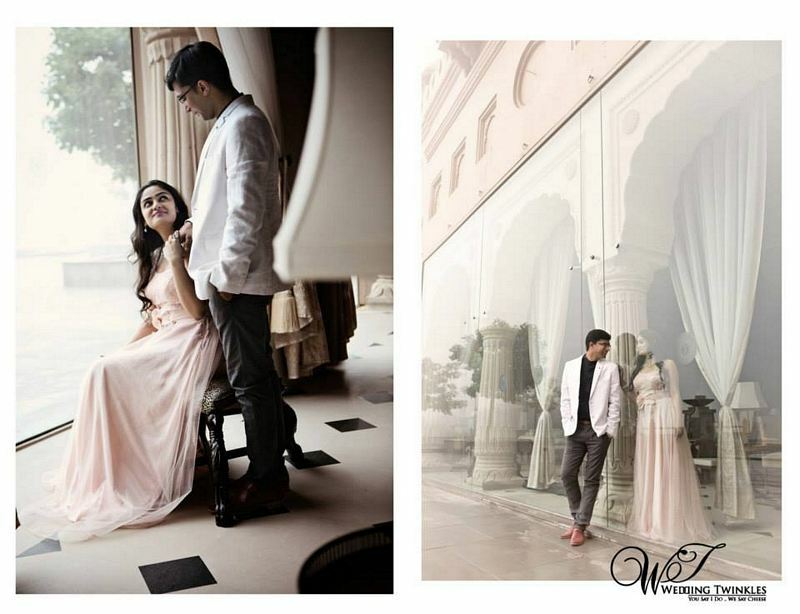 Wedding is a big thing is every couple’s life and It is very obvious that everybody wants to make it special. 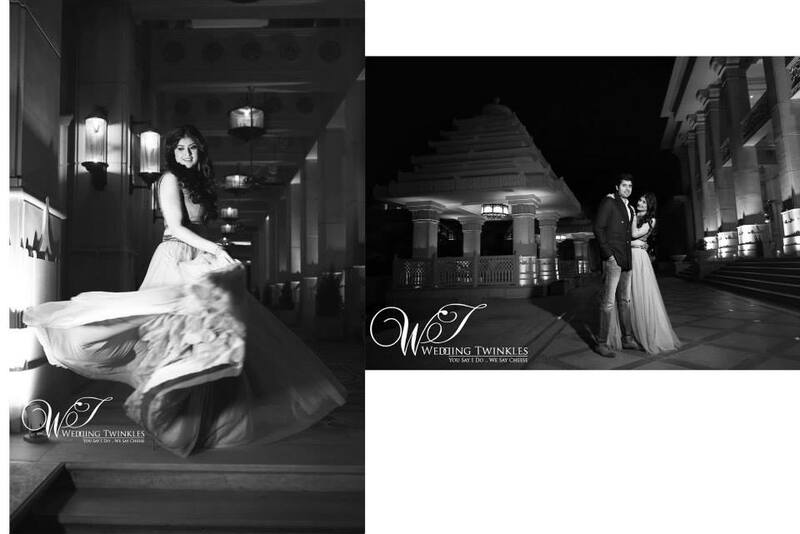 Destination wedding is something that is very much in trend these days. 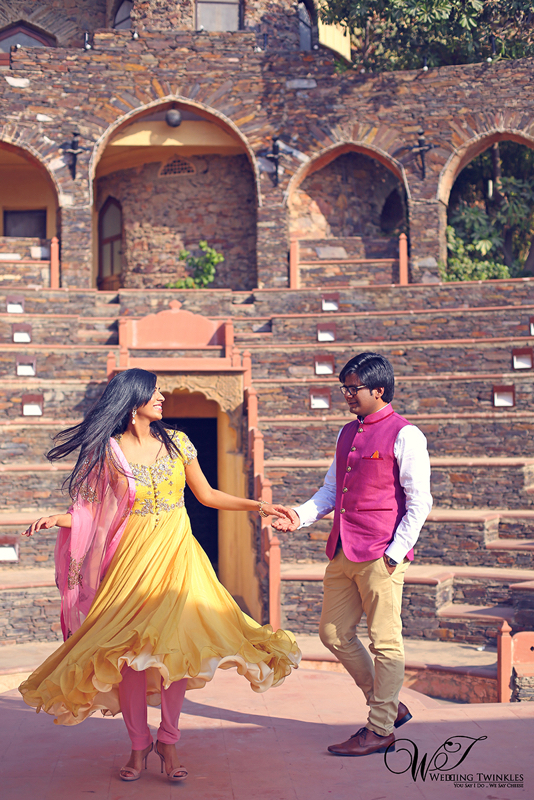 Everybody these days wants to get married from their own city away from the entire hustle bustle these days. 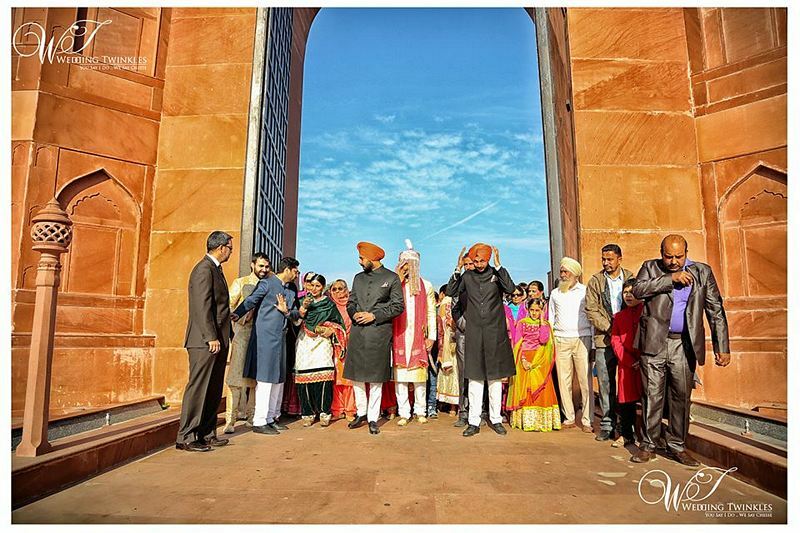 We all know that India is a country with diverse races and communities. 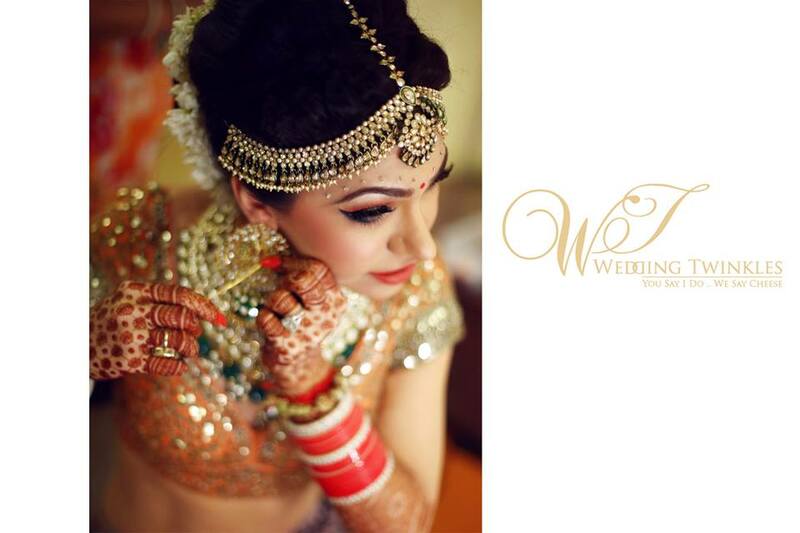 Weddings in India are any day much more than life affair, thus you need to celebrate this special day in a special way. 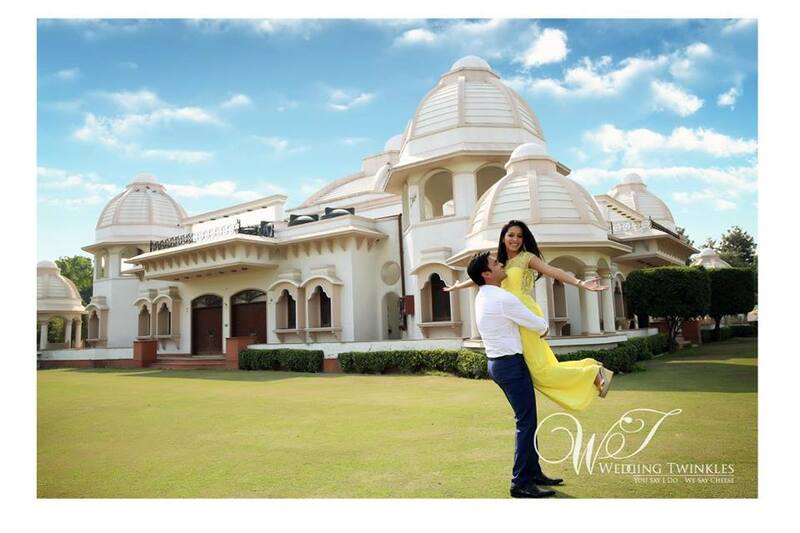 India is a country full of amazing and exotic wedding destinations, thus these days couples celebrate their weddings in a different way. 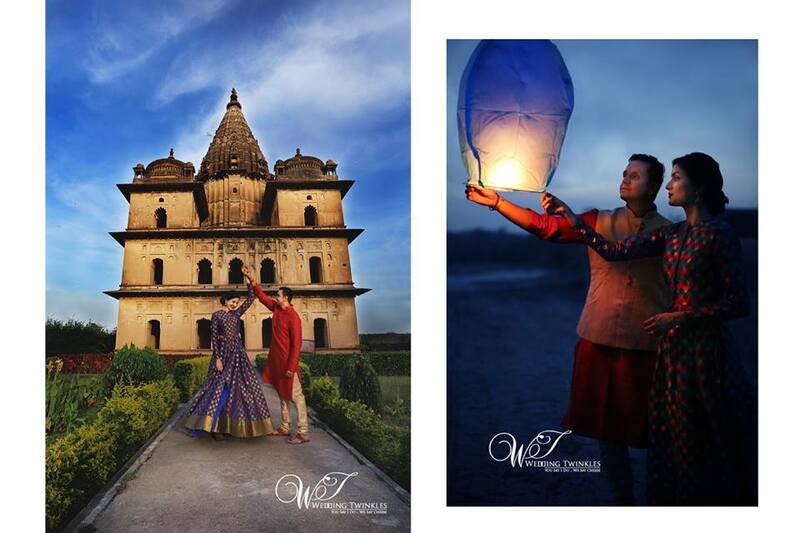 Wedding photography has become a huge thing in India these days. 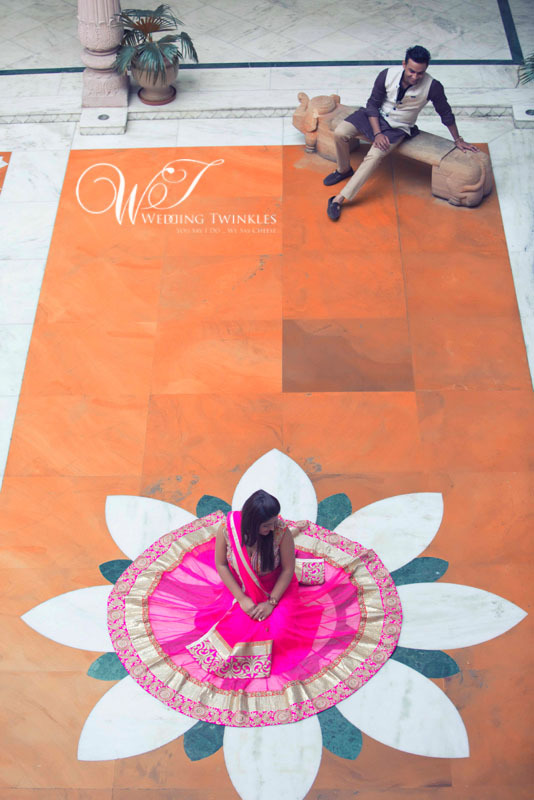 Everybody wants their wedding to look extra-ordinary. 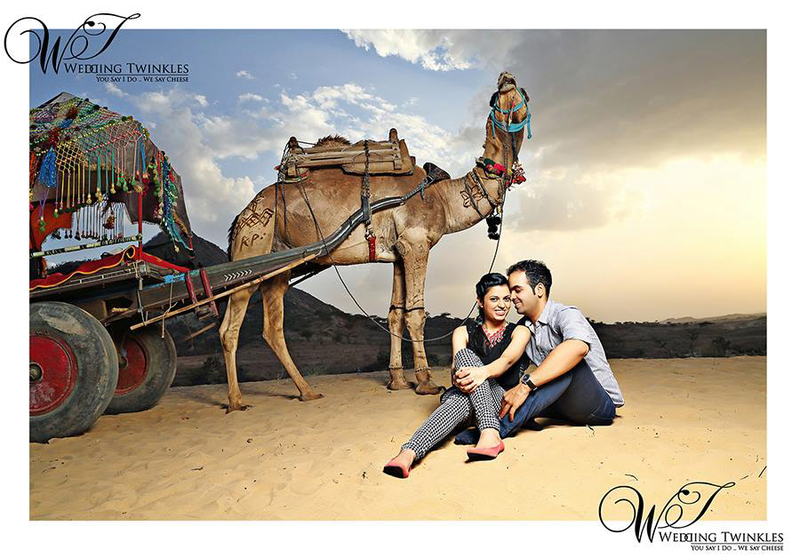 Couples get their wedding portfolios done in various destinations as well. 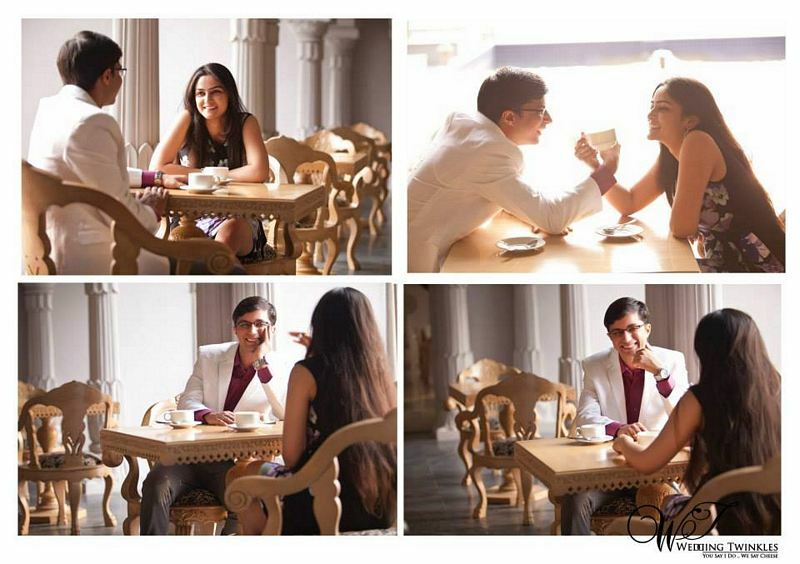 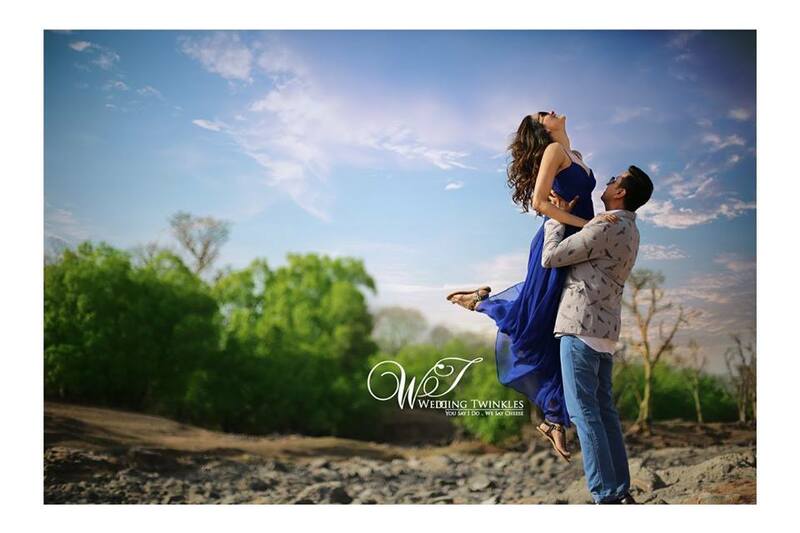 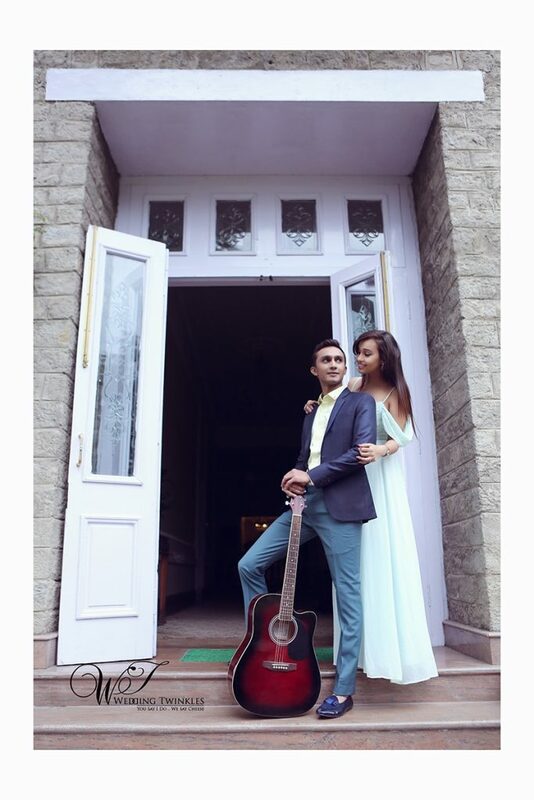 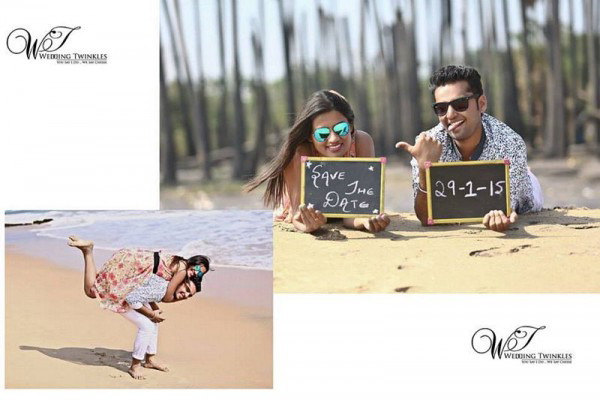 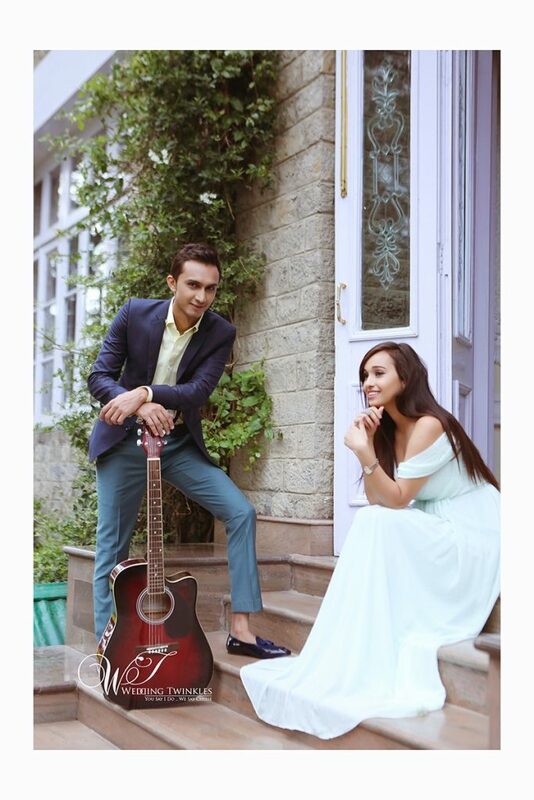 Yes you are hearing it right, pre-wedding destination shoot is the most trending thing these days. 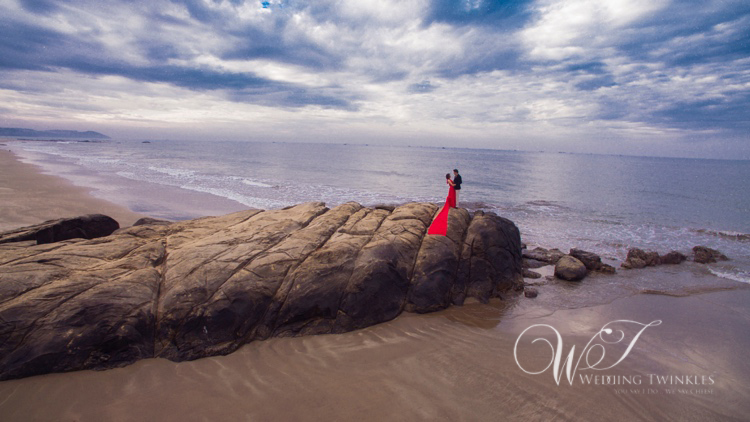 Couples are getting their wedding portfolios done in various beautiful locations. 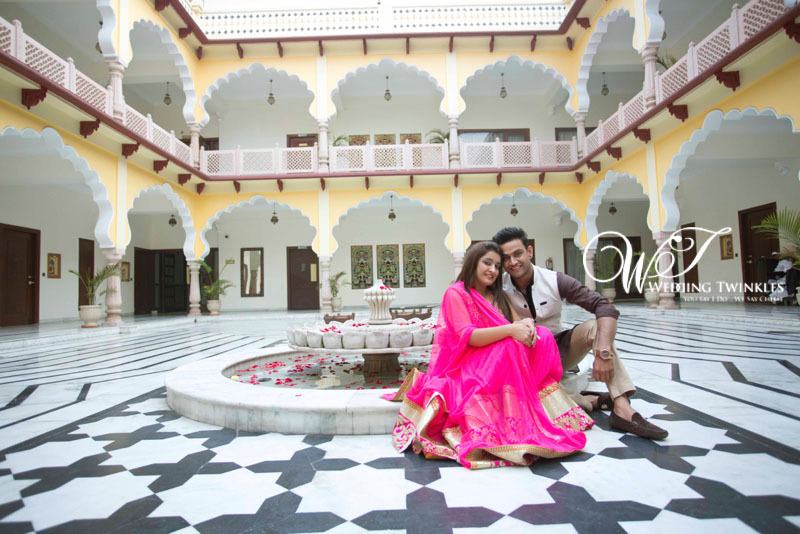 Be it Goa, Alwar, Udaipur, Jaipur, Hyderabad – wedding pre-shoots have made a very big place in the industry these days. 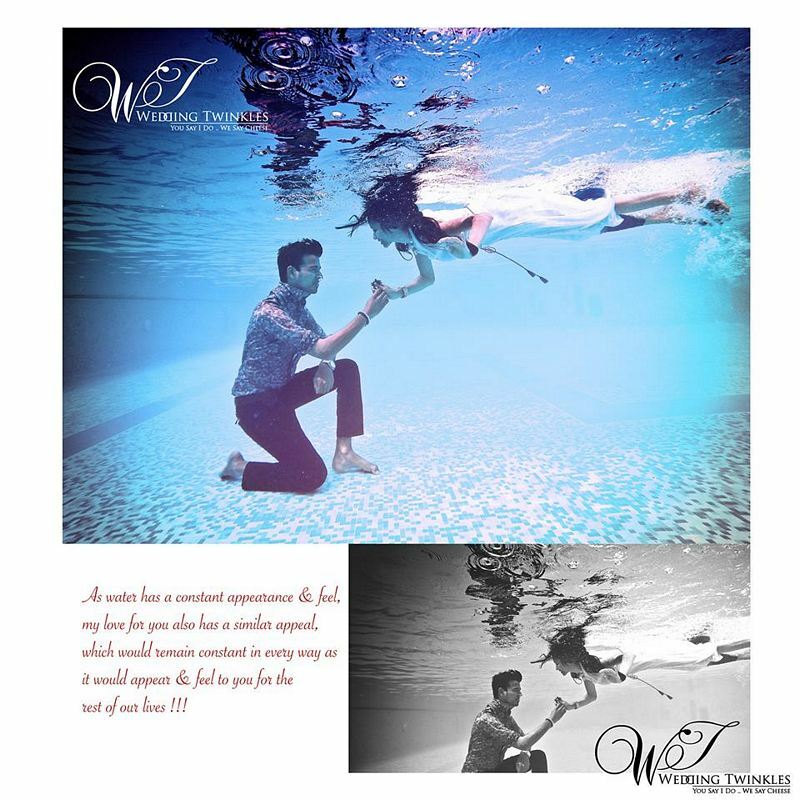 These pre-wedding shoots are done, based on various themes, like instances- underwater theme, simply traditional, semi-casuals. 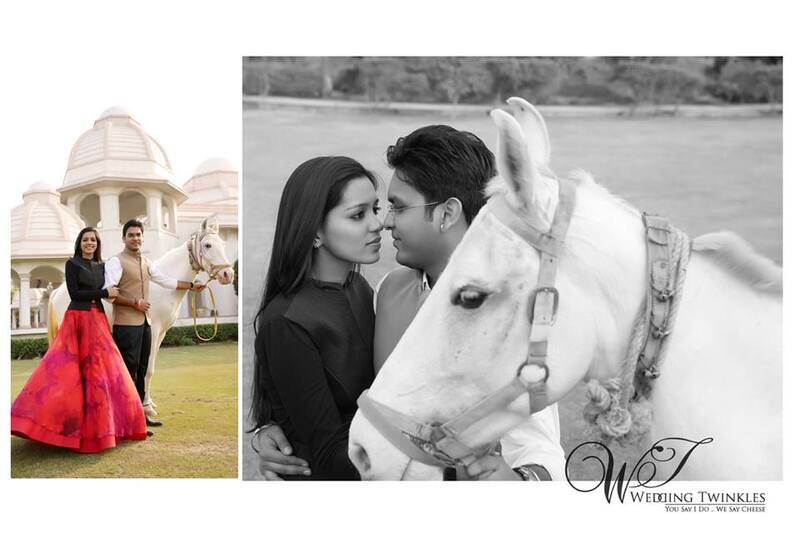 Forts, palaces, mansions, open-field, road, beach, hotels are some of the places couples chose as shoot locations. 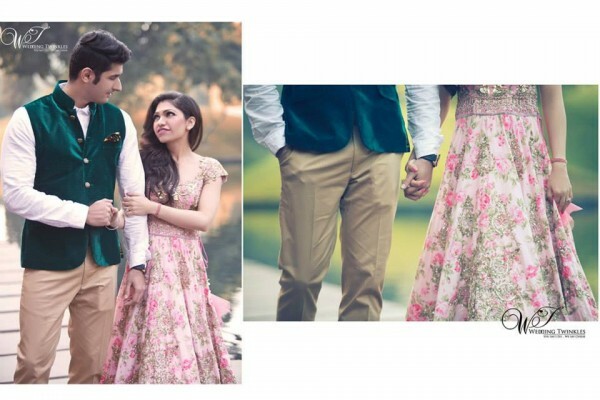 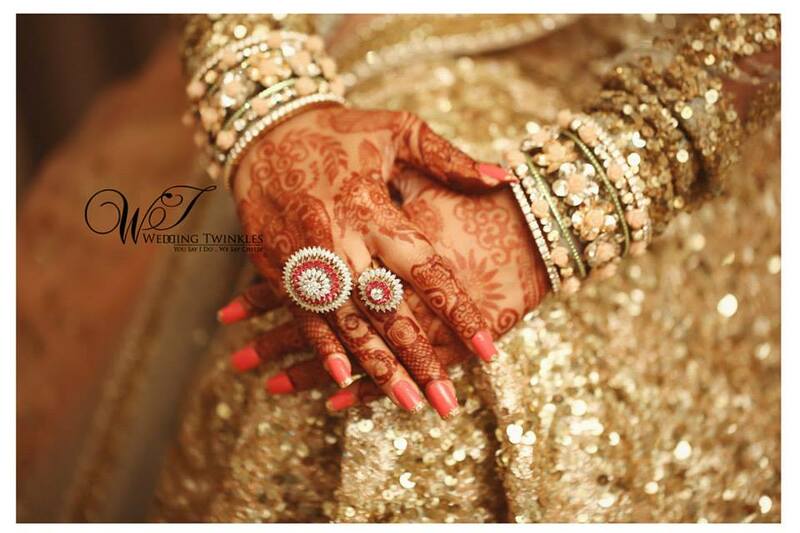 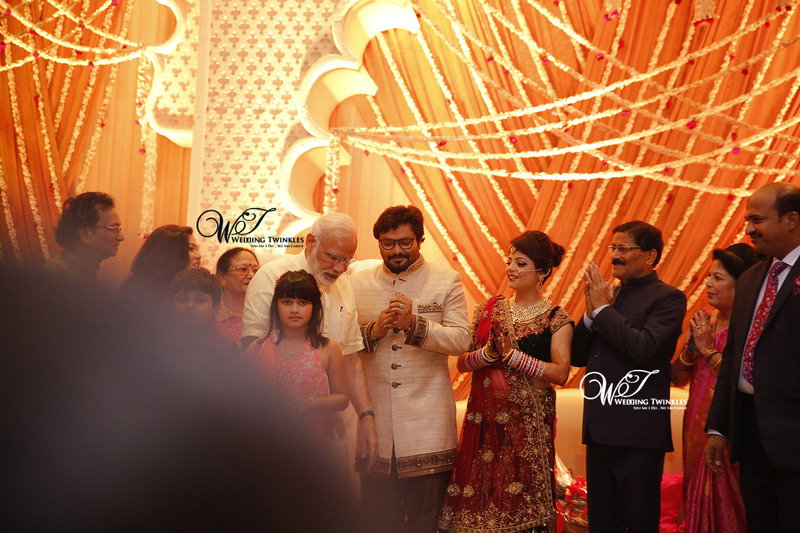 Wedding these days is just not getting married, it is rather two to three daylong celebration which includes ceremonies like roka, sangeet-mahendi, Haldi, bachelors-bachelorette night, wedding day and of course the reception. 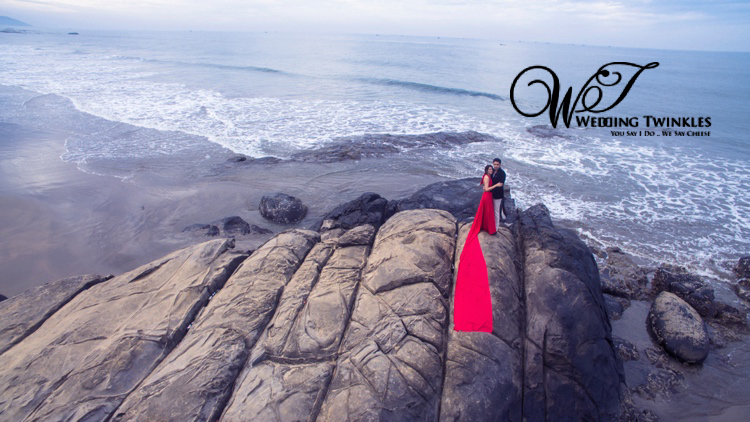 So whether you love beach or palaces, mountains or forts, India has all the options for your marriage ceremony to make it into an unforgettable event.